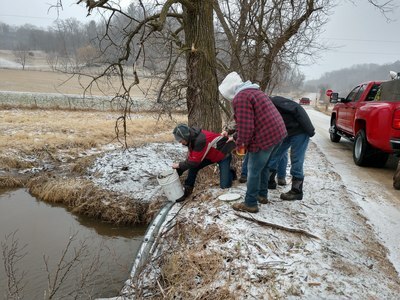 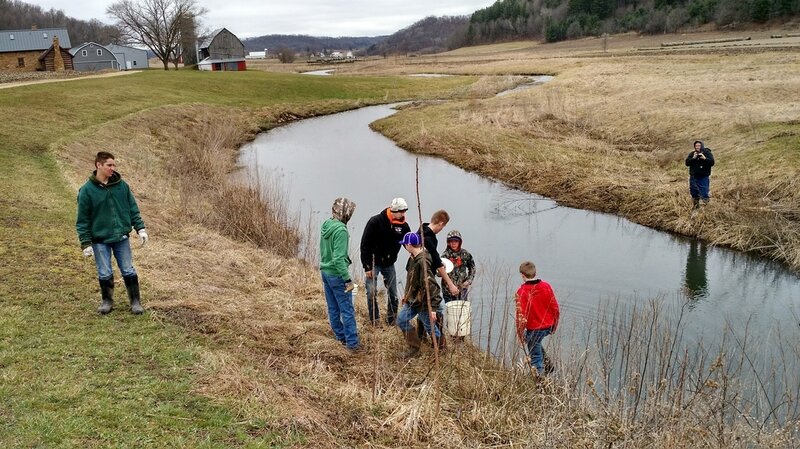 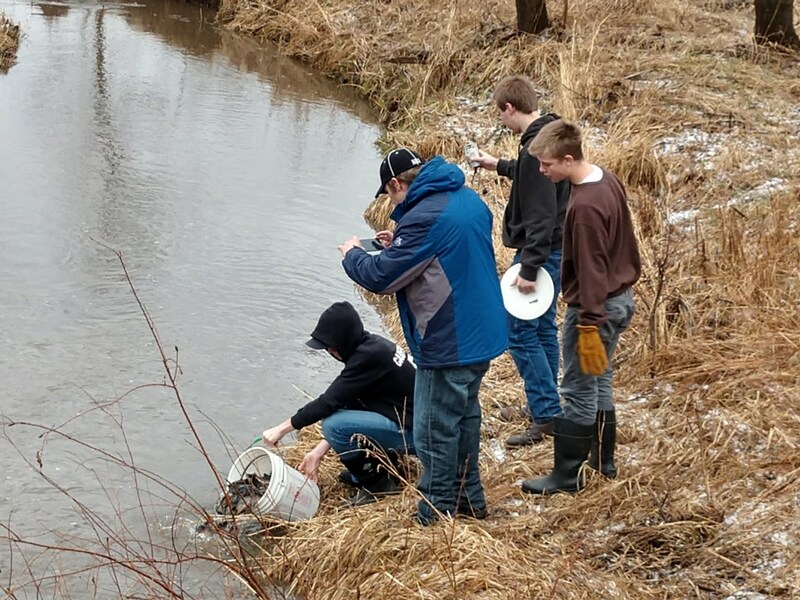 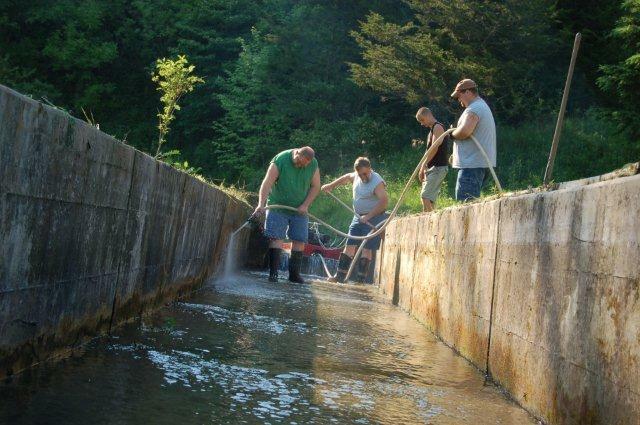 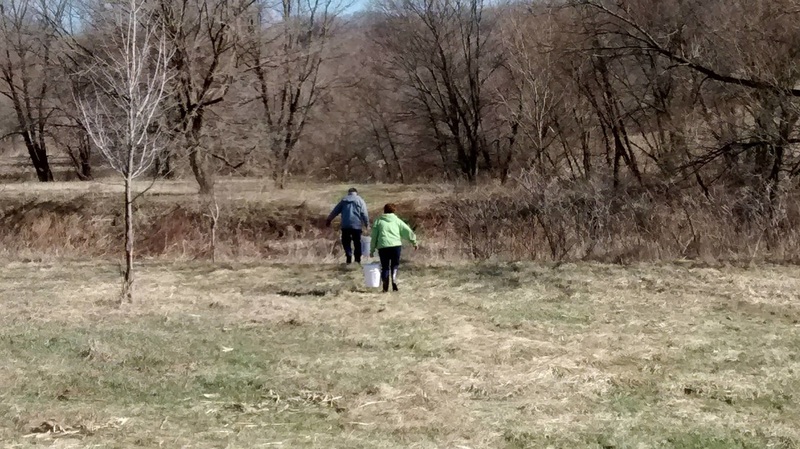 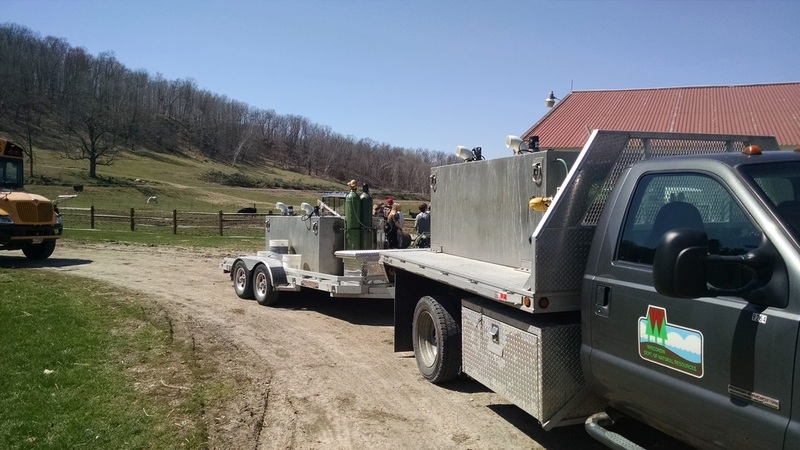 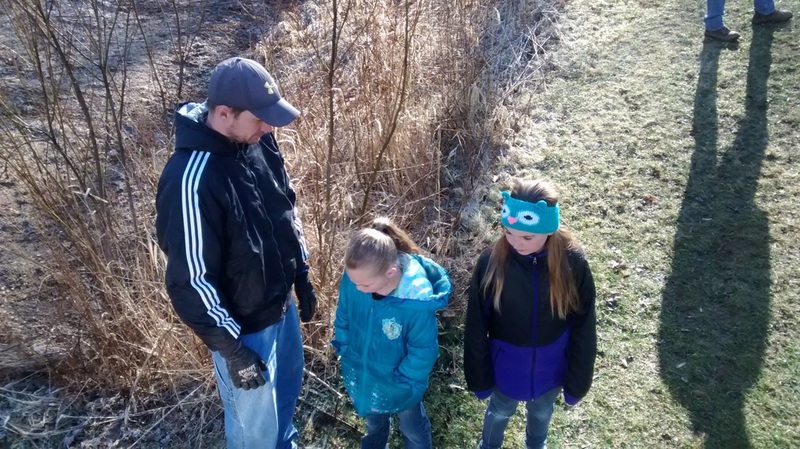 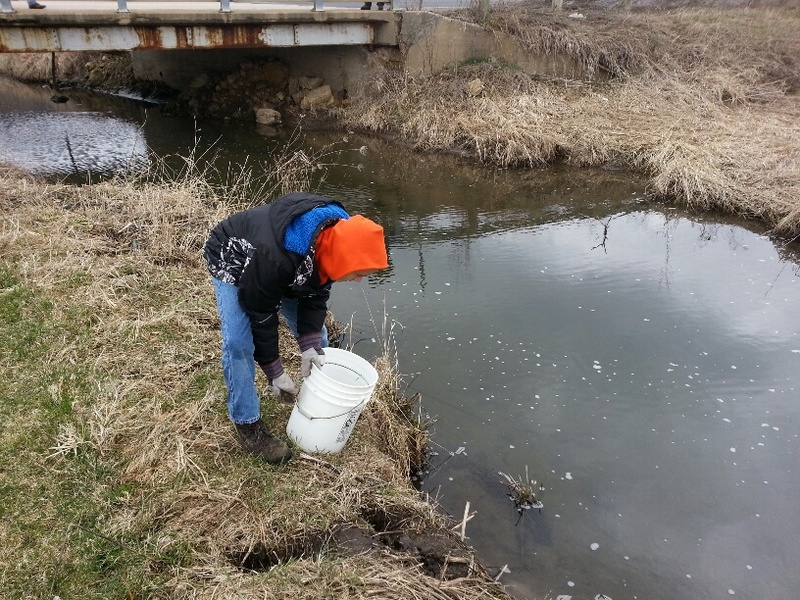 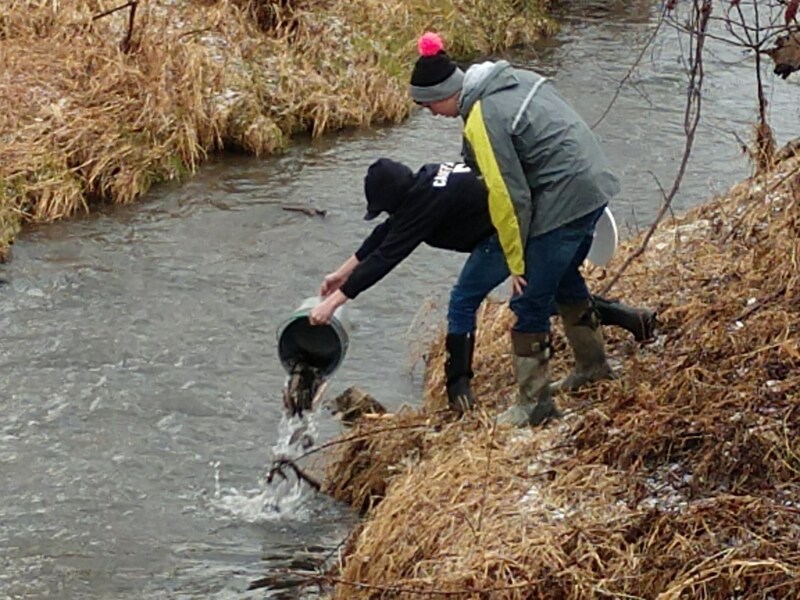 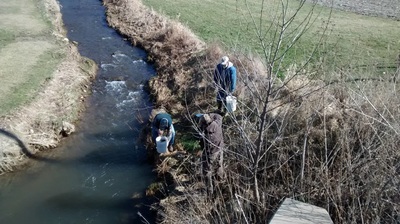 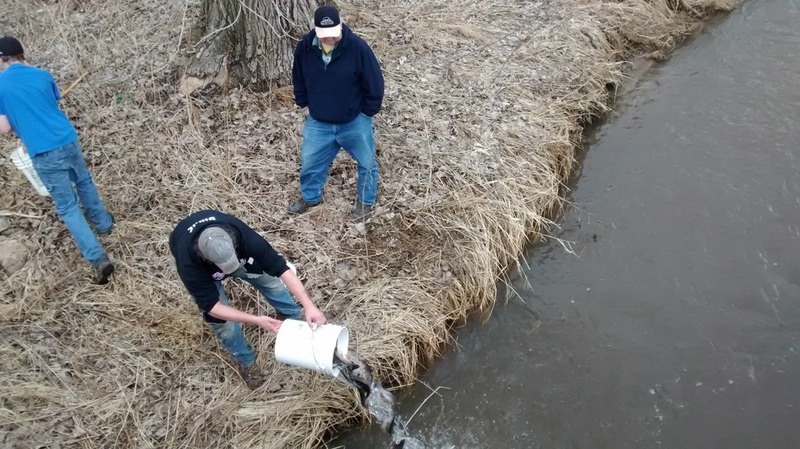 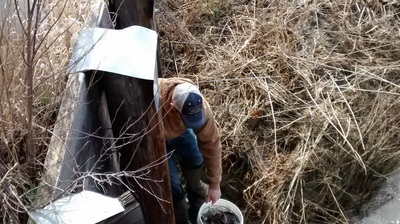 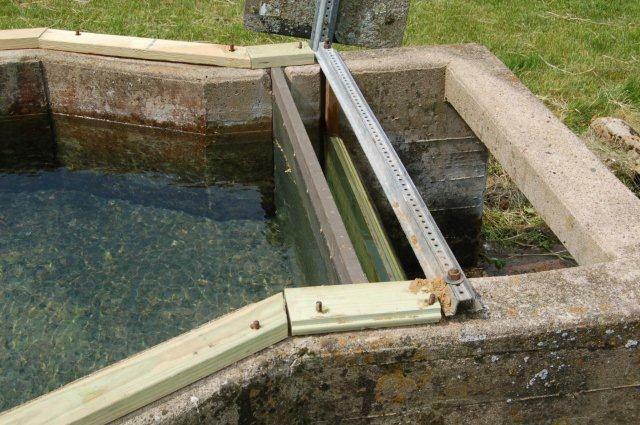 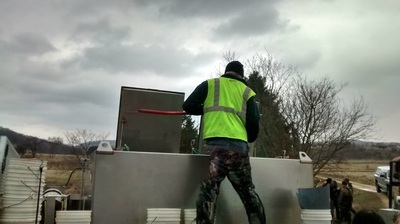 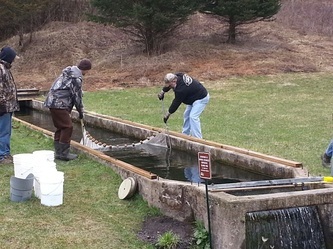 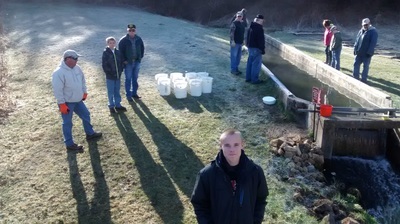 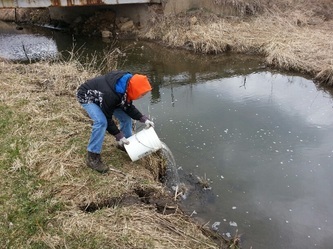 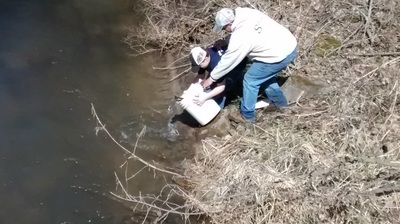 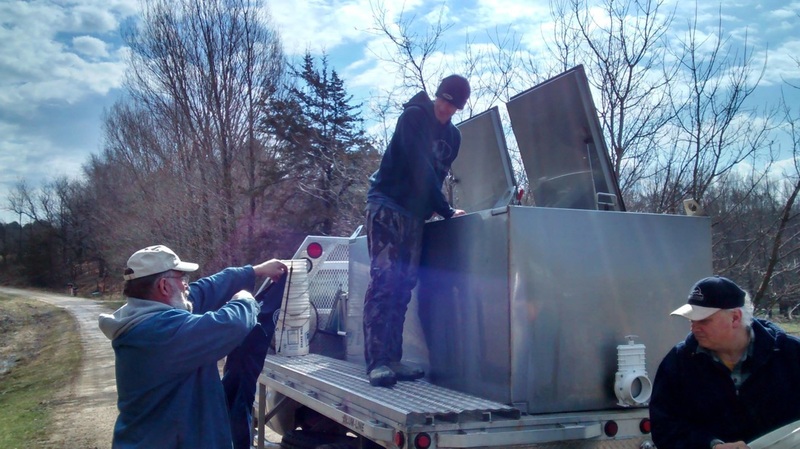 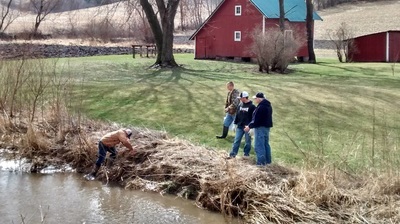 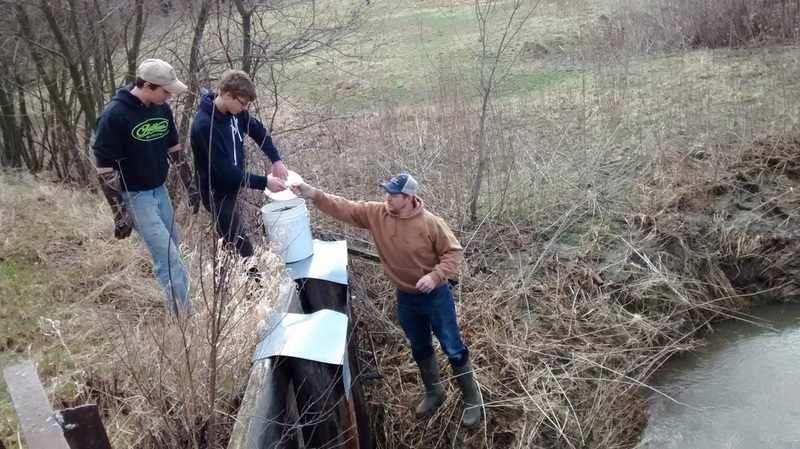 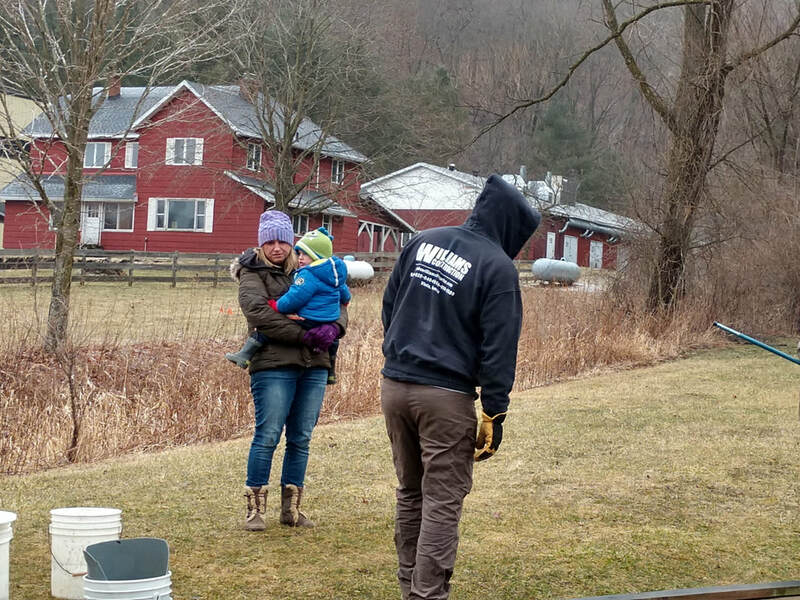 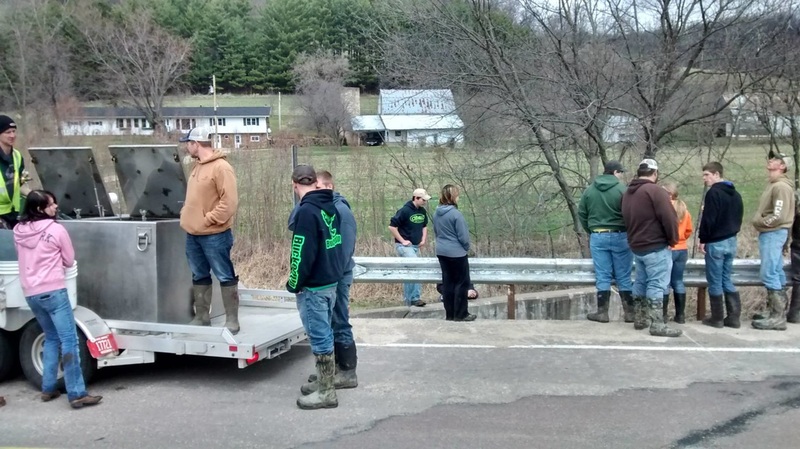 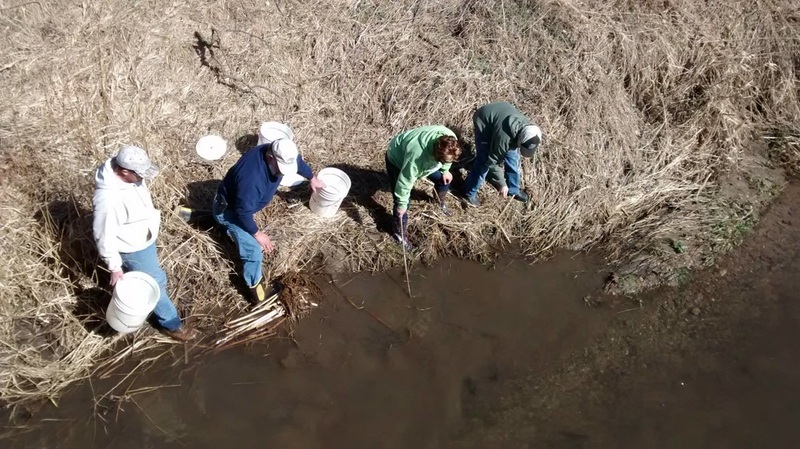 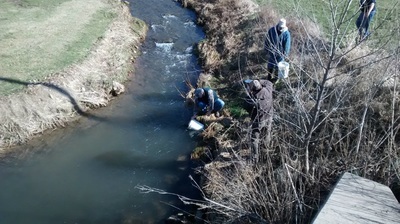 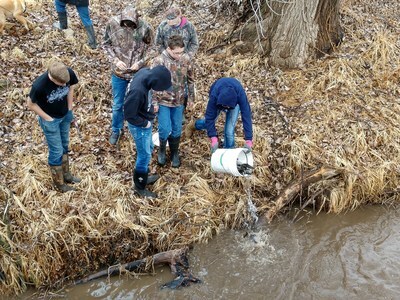 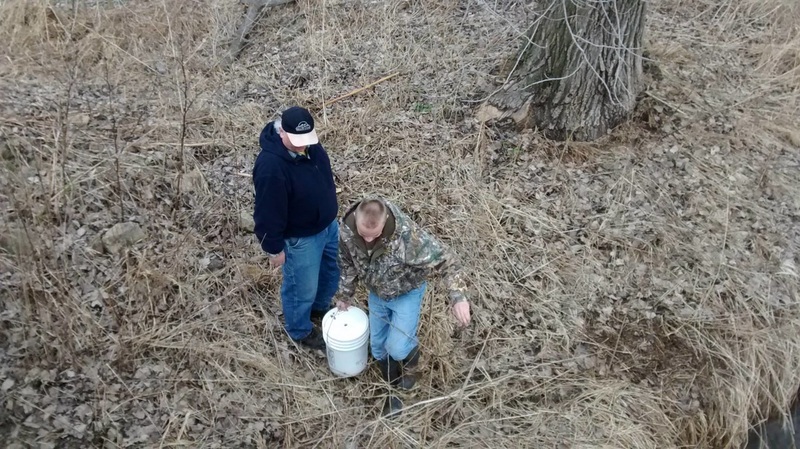 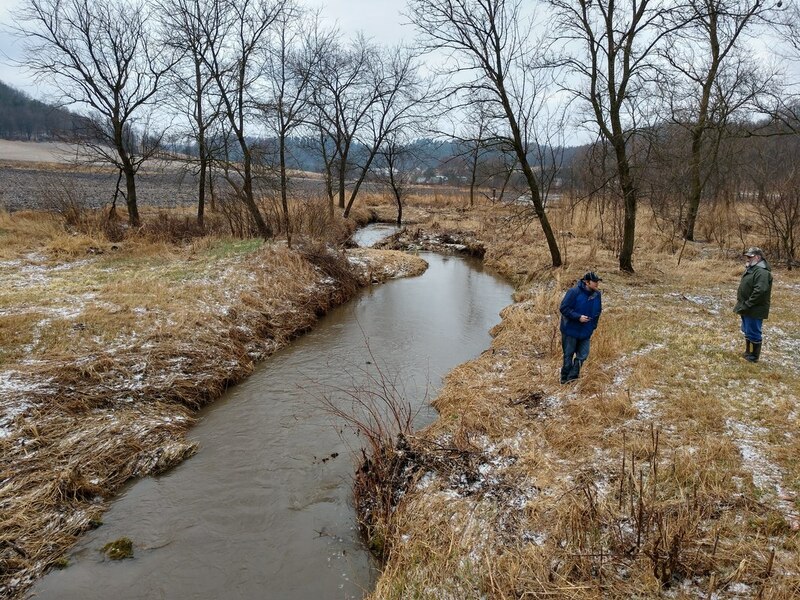 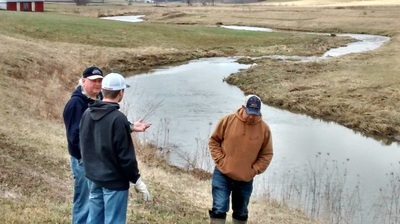 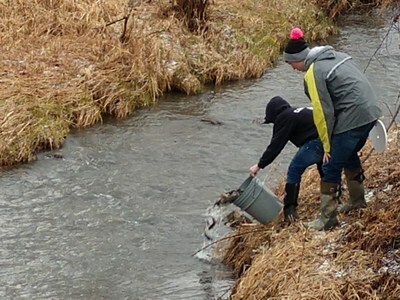 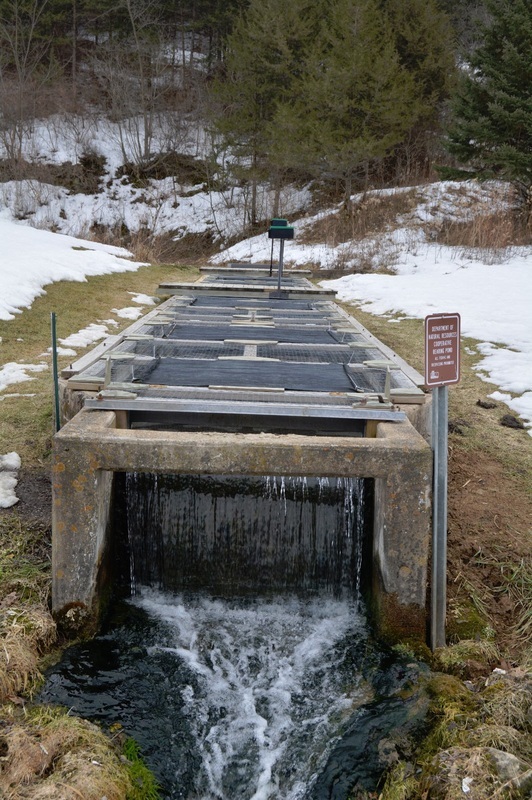 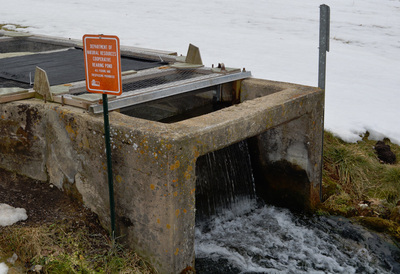 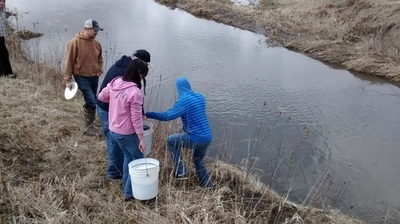 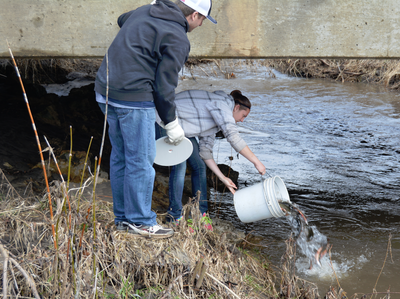 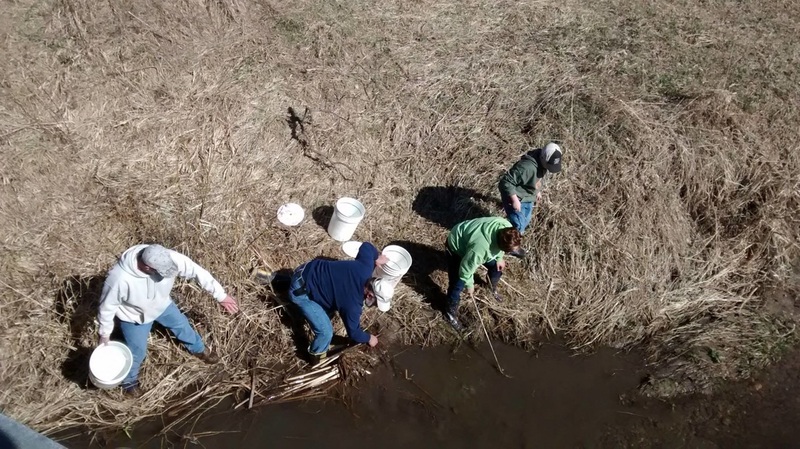 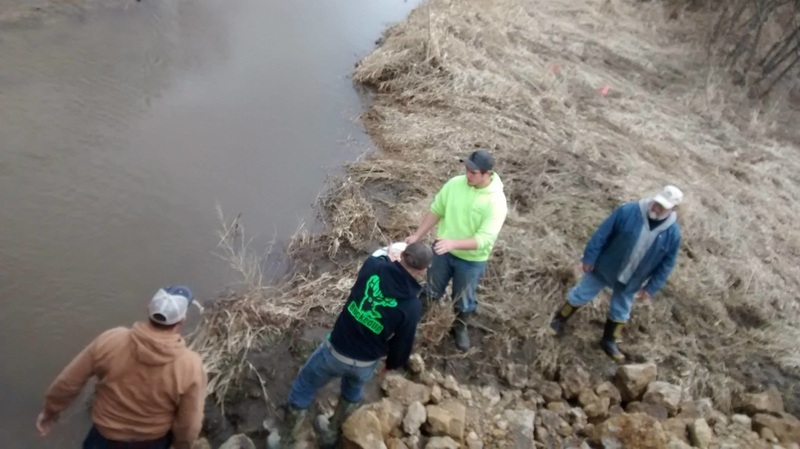 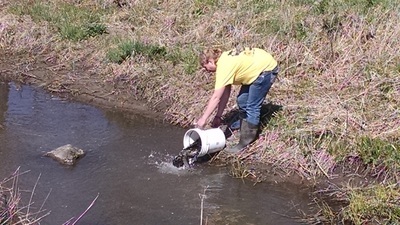 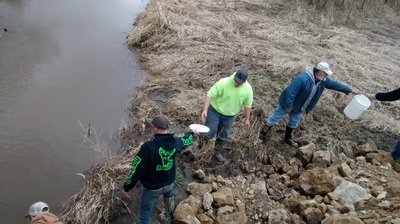 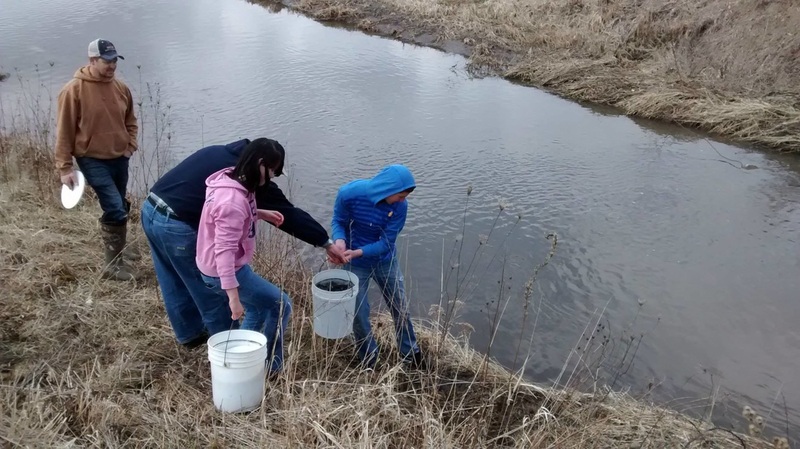 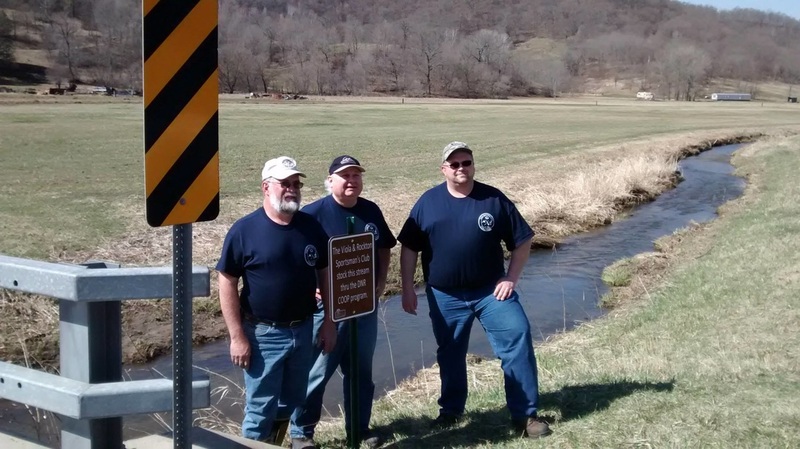 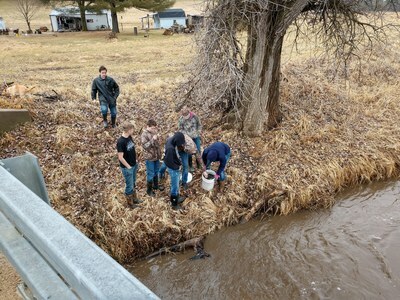 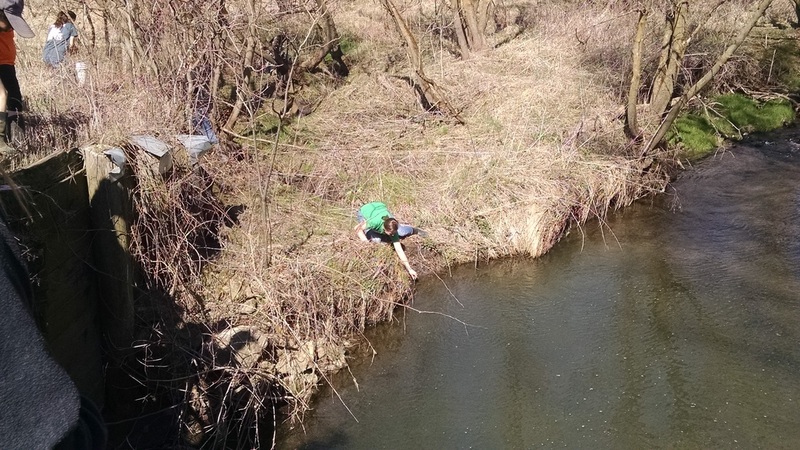 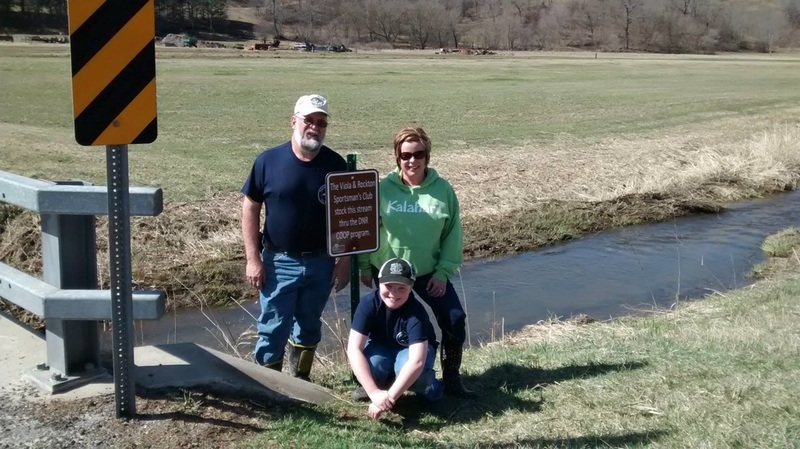 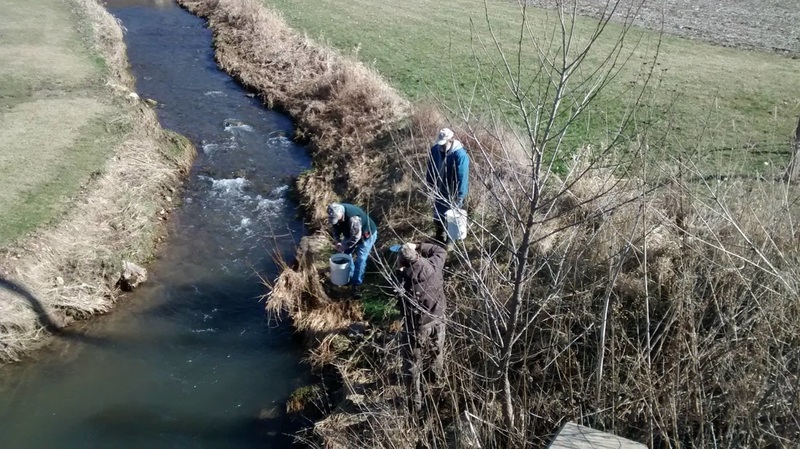 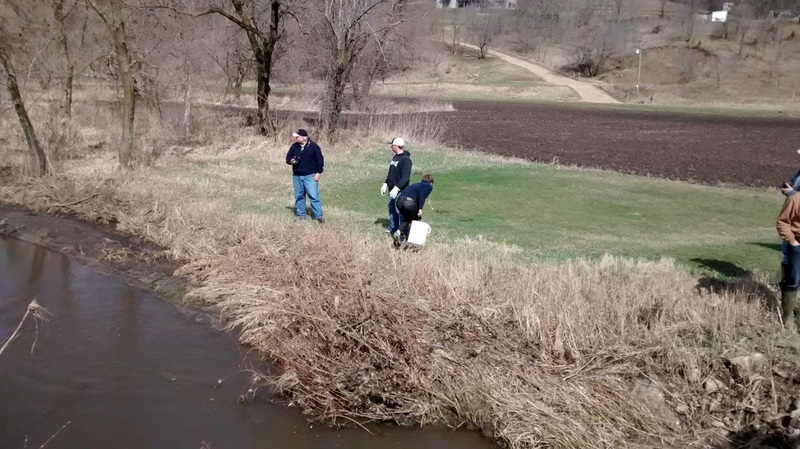 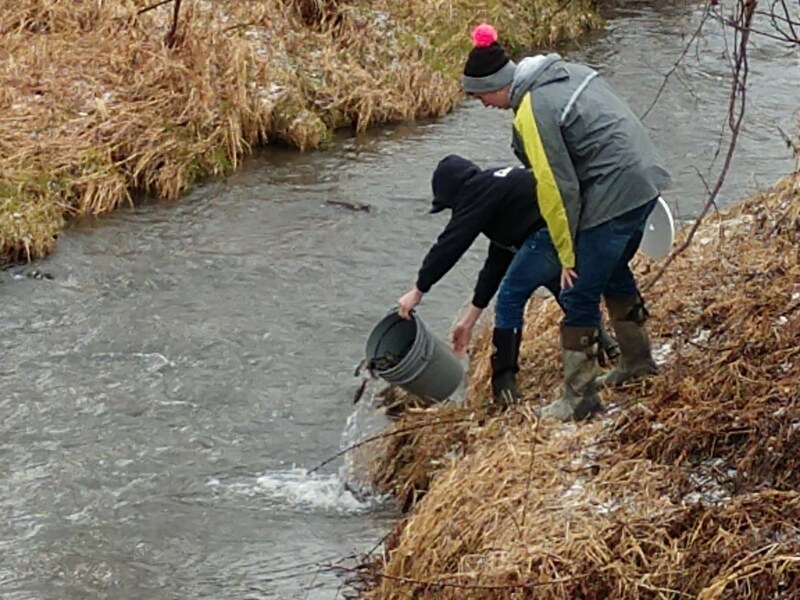 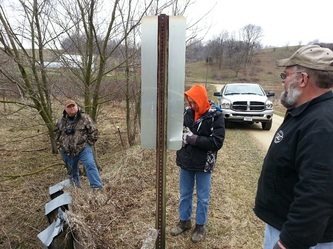 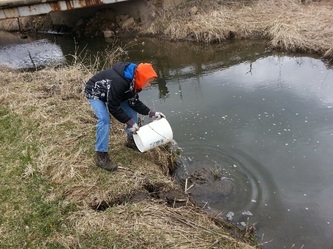 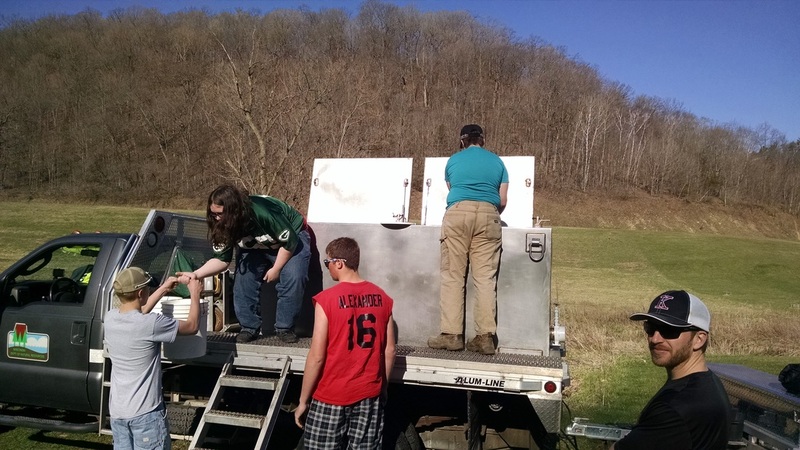 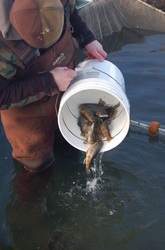 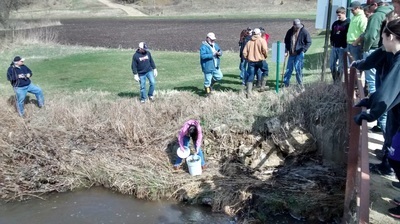 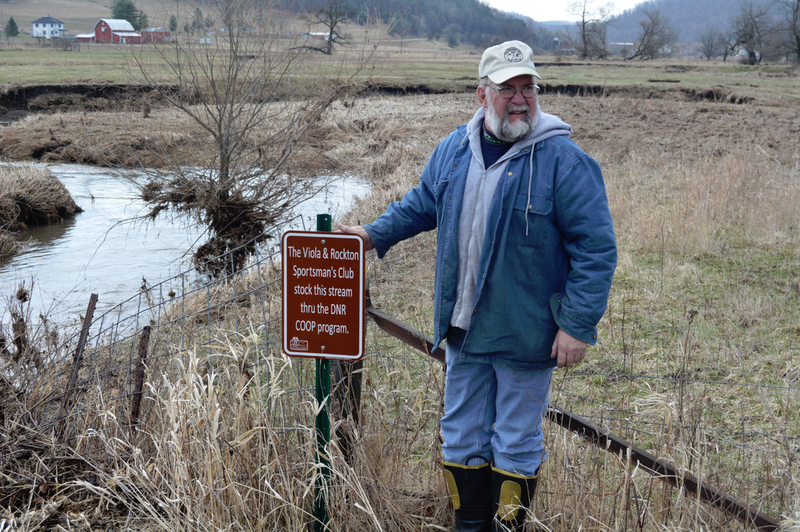 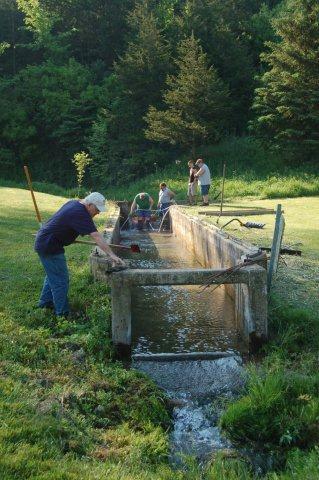 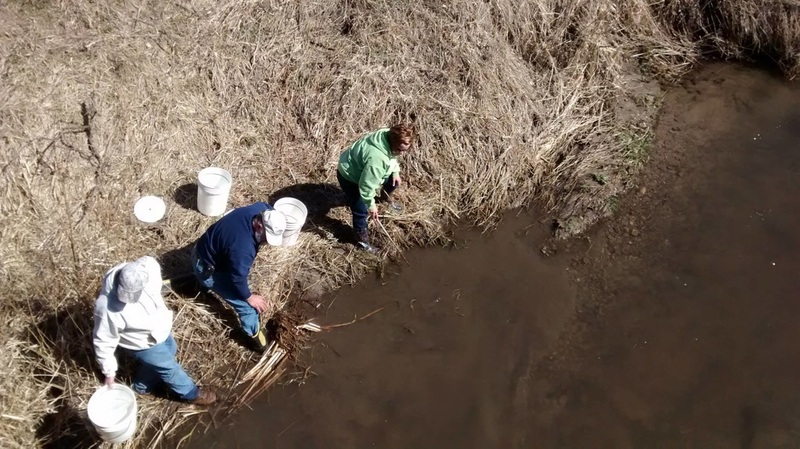 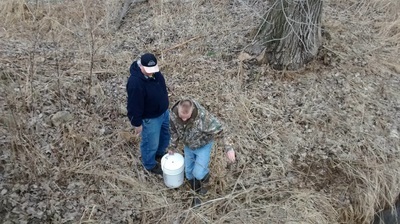 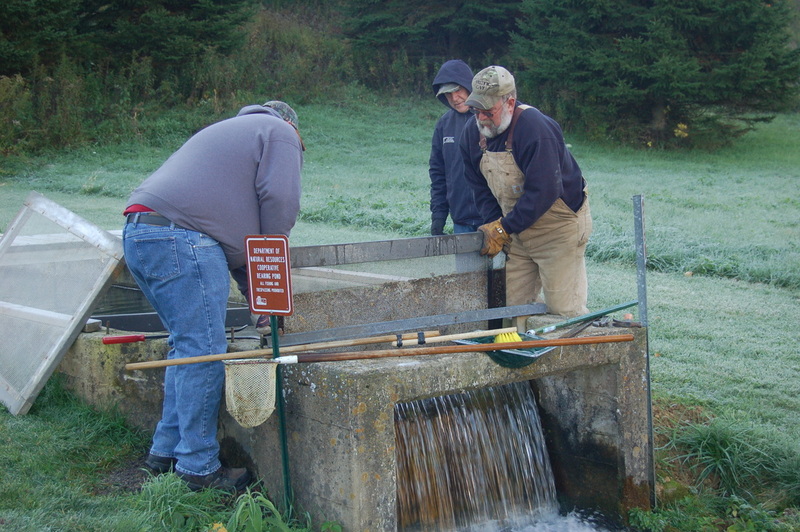 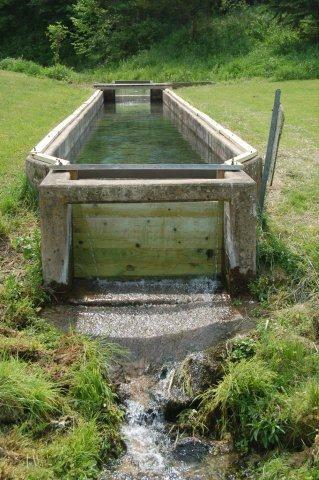 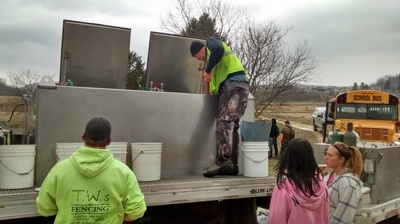 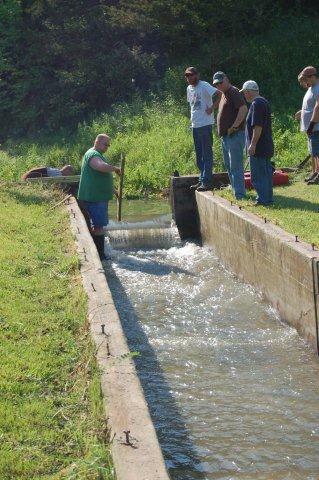 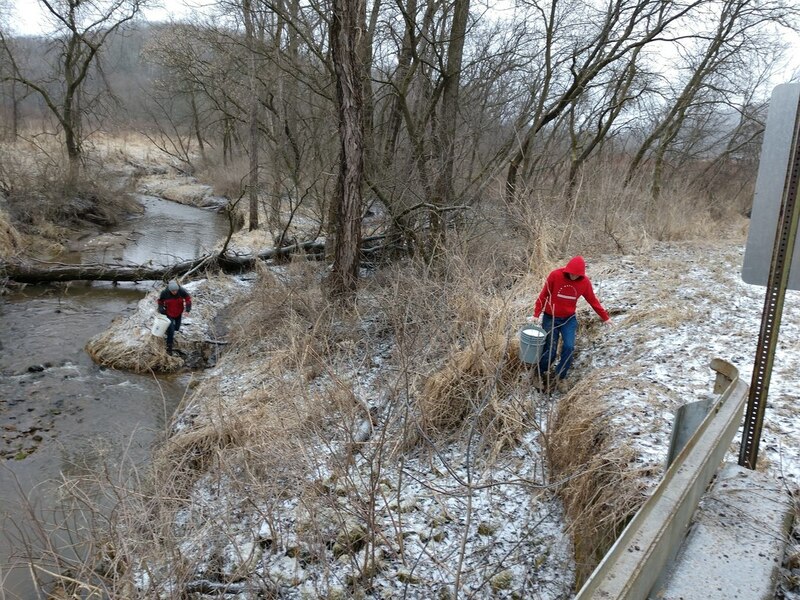 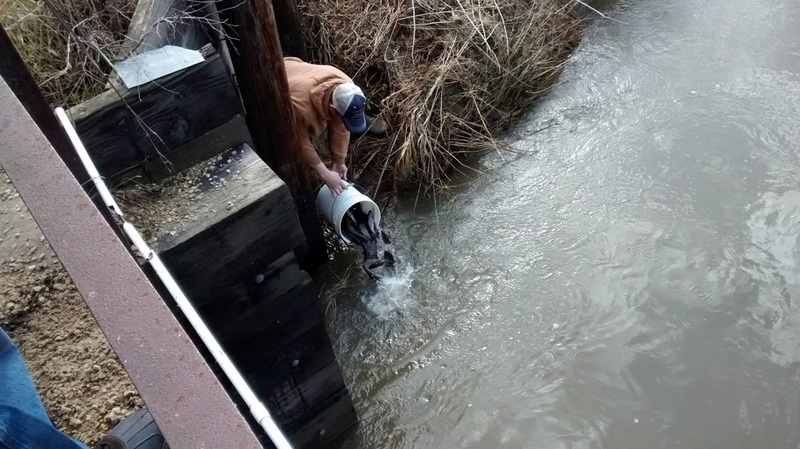 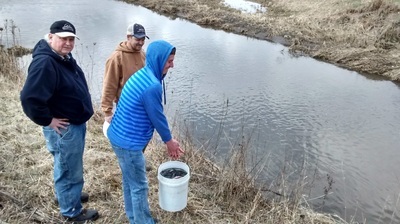 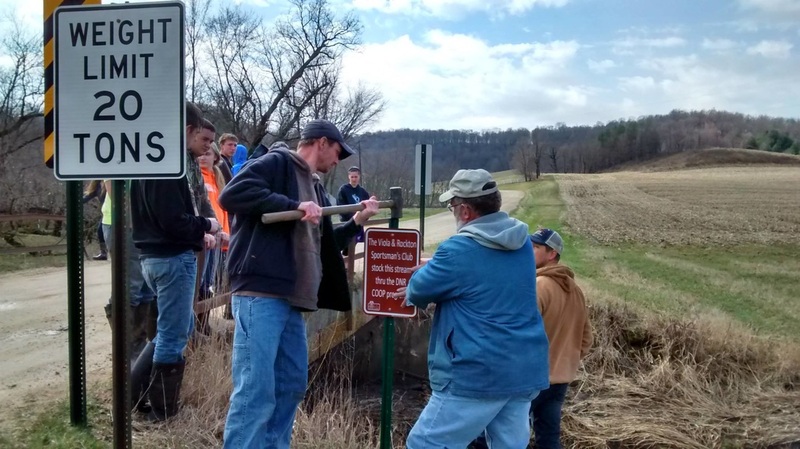 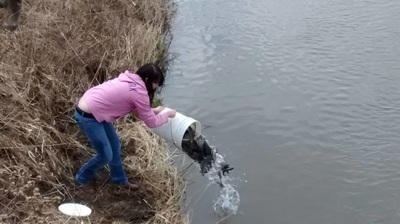 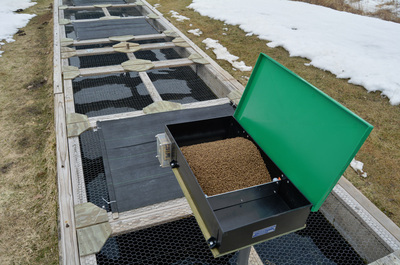 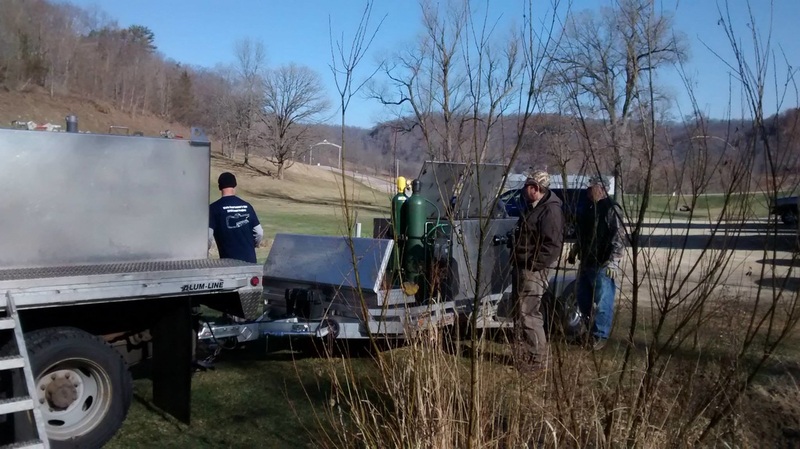 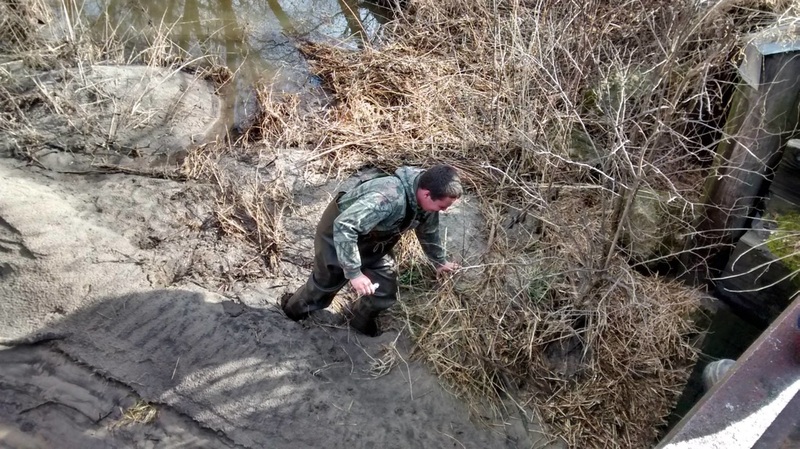 The VSC along with support from the Rockton Sportsman's Club, have now raised and stocked over 20,000 wild brook trout in local streams from Yuba to LaFarge, to near Rockton, in just four short years. 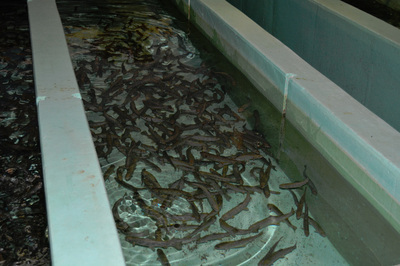 This year we expect to stock another 7000 trout. 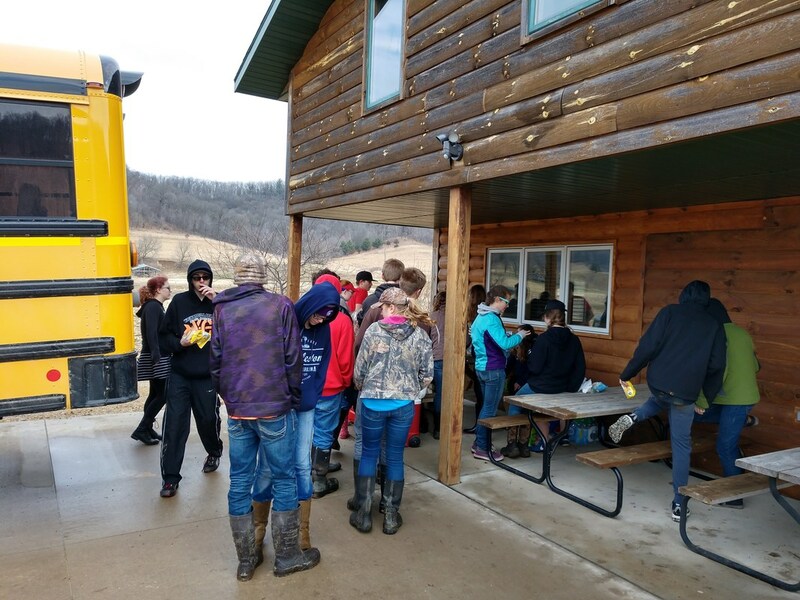 Last year we had two local schools participate in stocking, with over 50 students taking an active part in the stocking process. 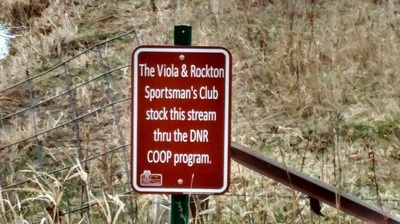 The club also won an award from the DNR which rewarded us for our outstanding work in the COOP program. Trout for the 2017-2018 season have been delivered to the runway! 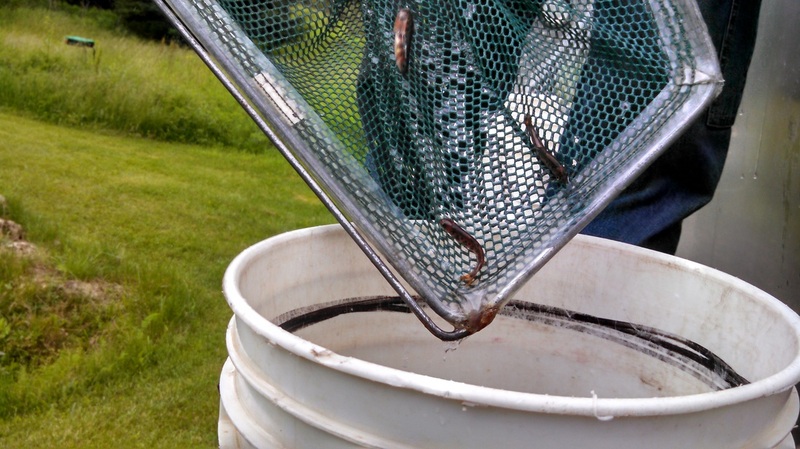 They are about half the size they usually are due to a change in vendors. 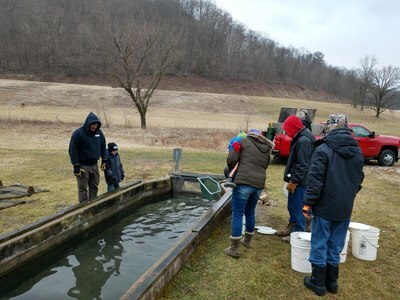 Please check back periodically for information regarding the 2018 trout stocking schedule! 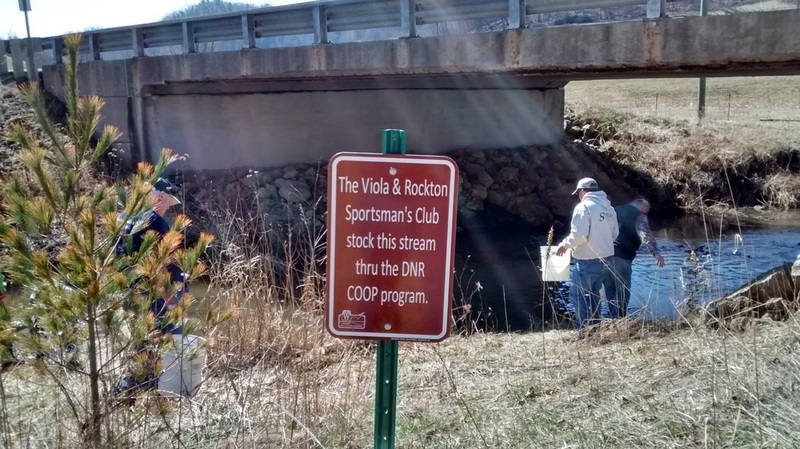 ​The Viola and Rockton Sportsman’s Clubs combined efforts again, and this season we released 7,519 Brook Trout into streams near Yuba and LaFarge. 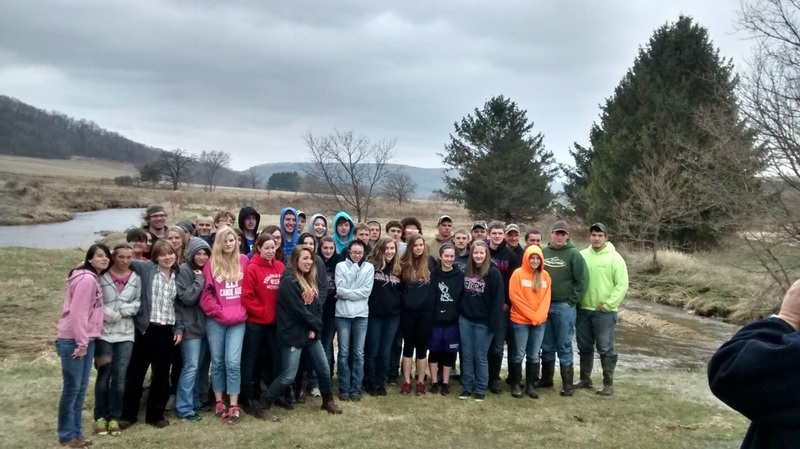 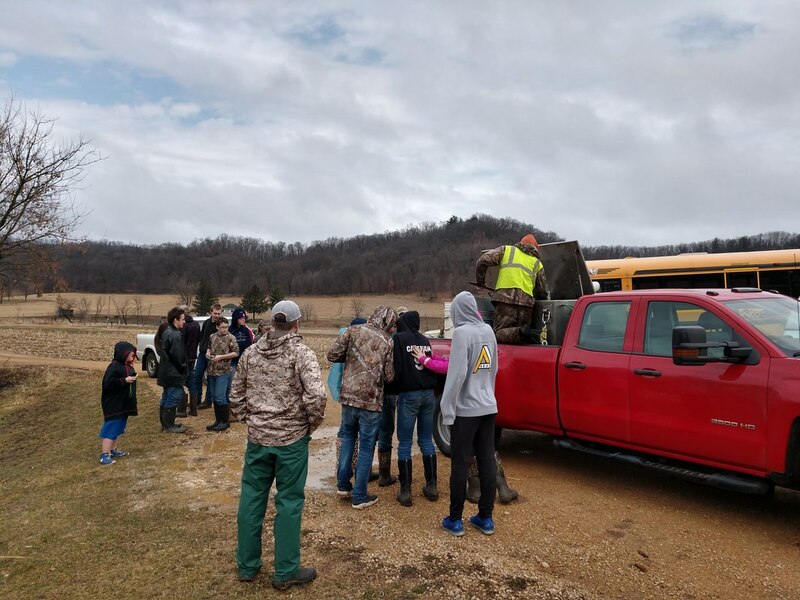 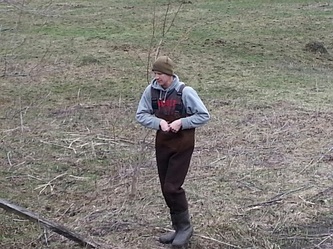 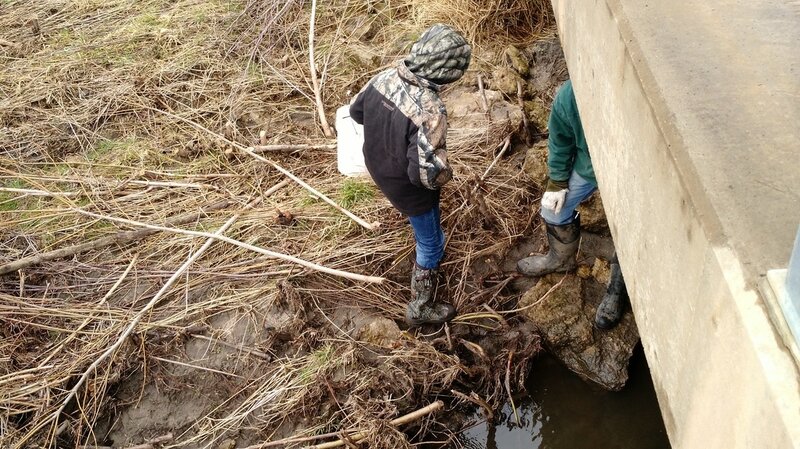 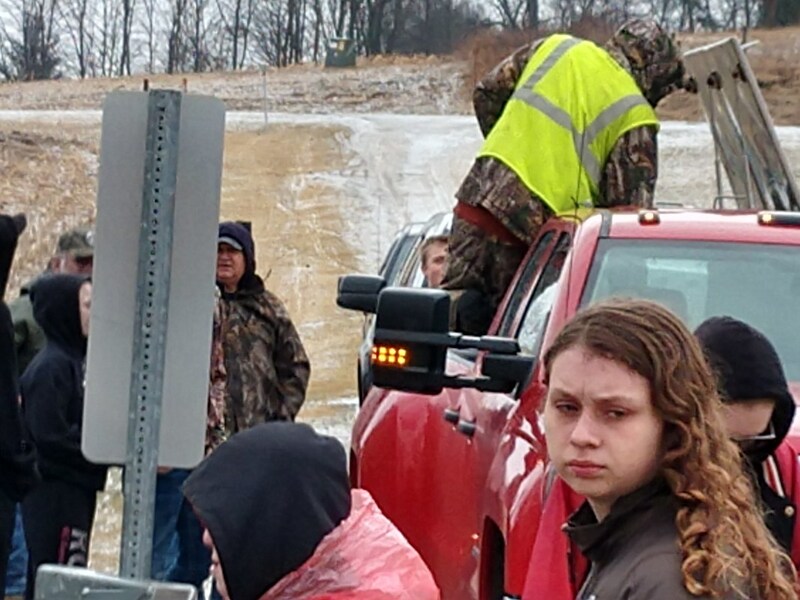 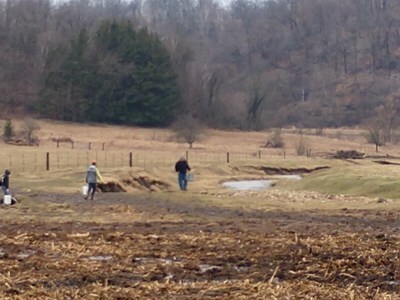 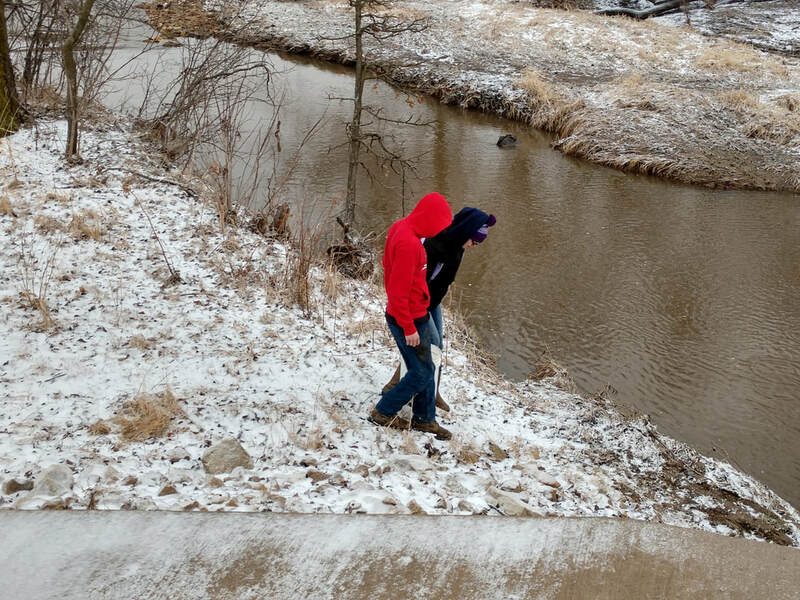 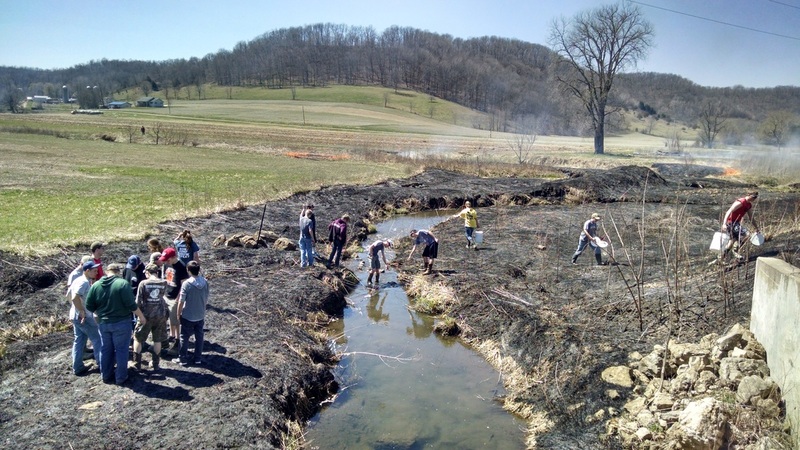 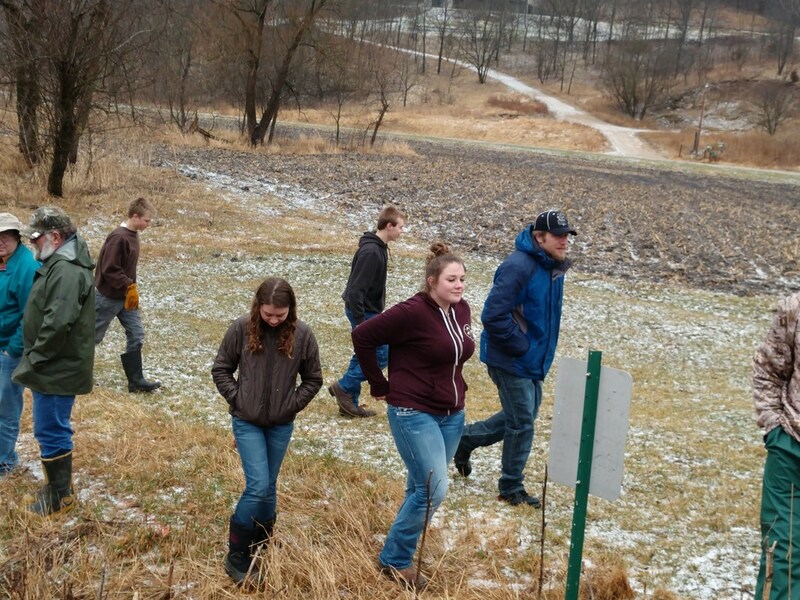 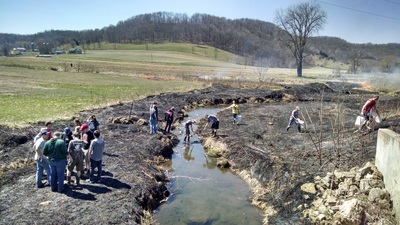 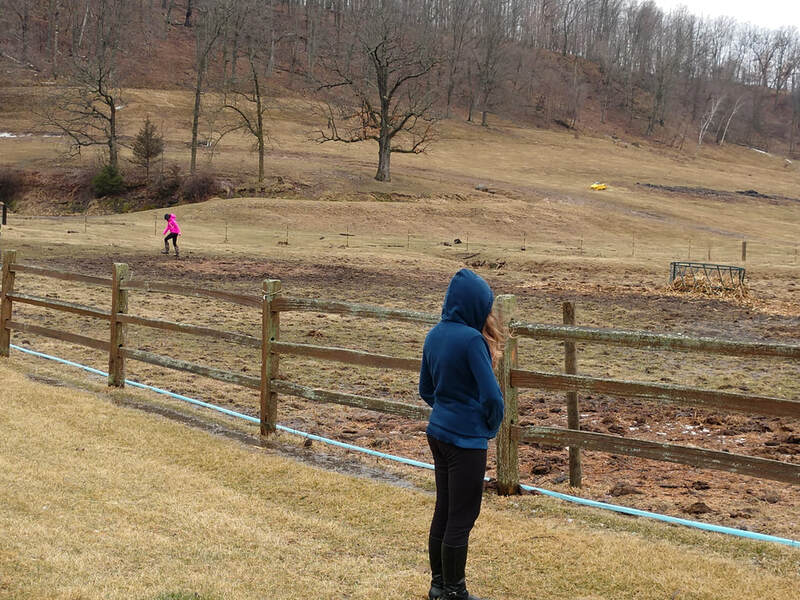 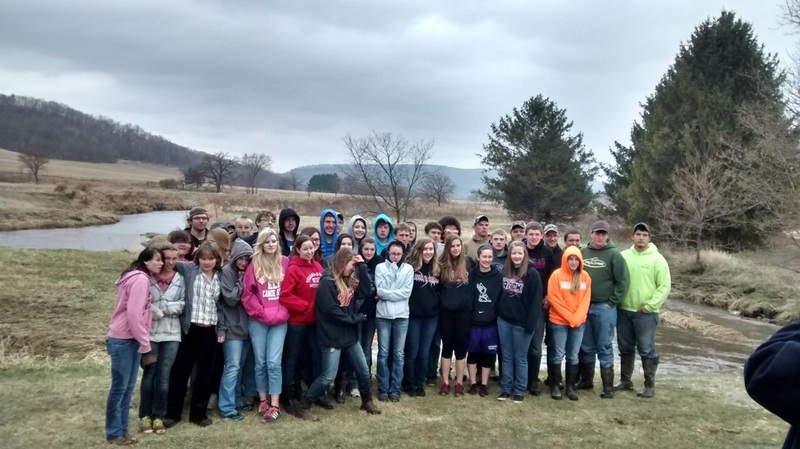 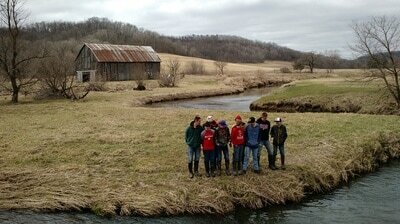 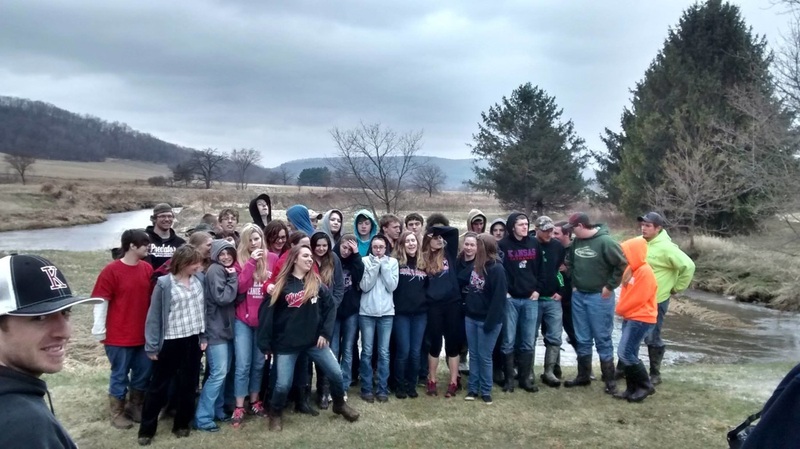 We had help stocking from about 50 students from Kickapoo and LaFarge High Schools, along with a dozen or more members and even a landowner. 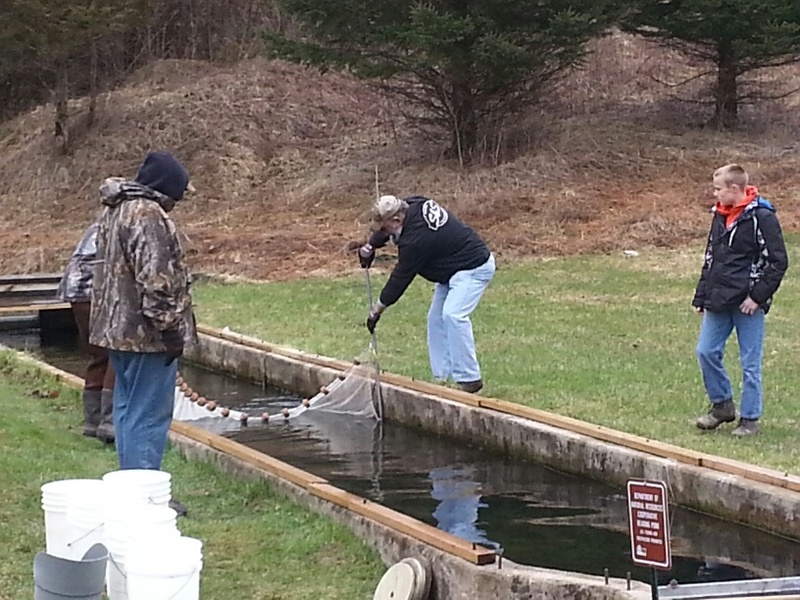 We want to thank everyone who had a part in the stocking program and with actually stocking the trout. 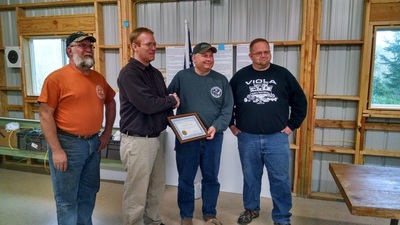 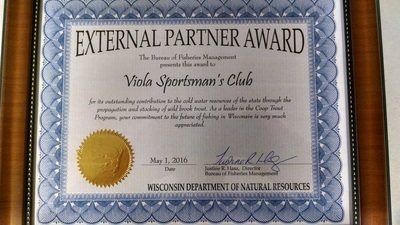 On May 3rd, three representatives from the DNR, David Schmidt, Jordan Weeks, and Todd Kalish attended our monthly meeting and presented the clubs with an External COOP Partnership Award. 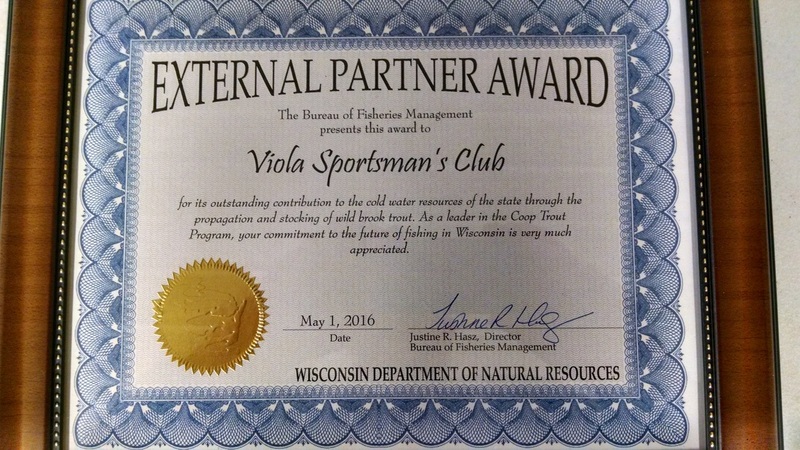 We got the award for our part in the overall COOP trout stocking program, and for several of our projects that have community and youth involvement, like Hunters Safety training and the Jr Air Rifle team. 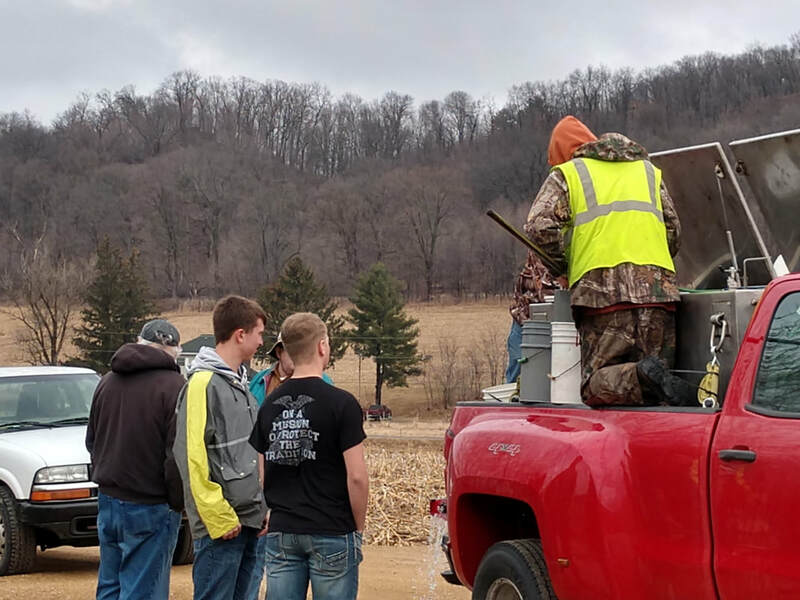 We’re already working on more programs to get youth involved, so watch for upcoming news in the Sportsman’s Corner and on our website. 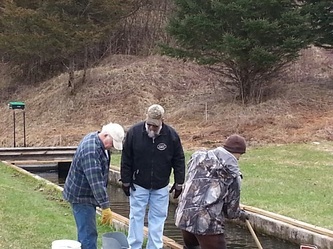 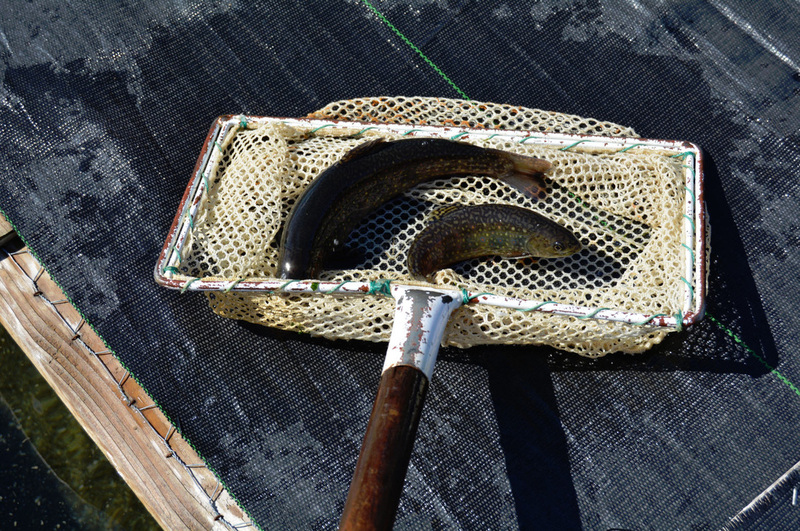 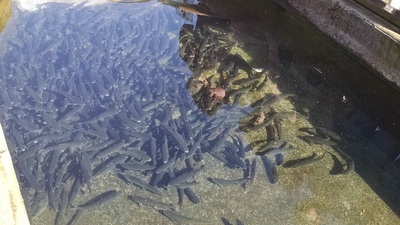 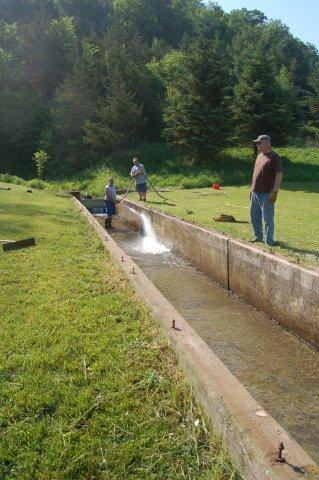 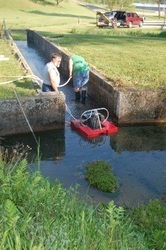 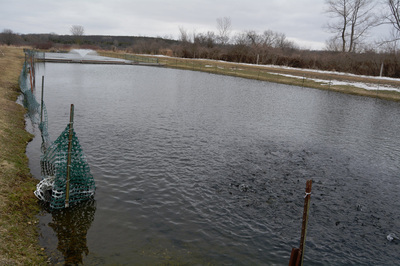 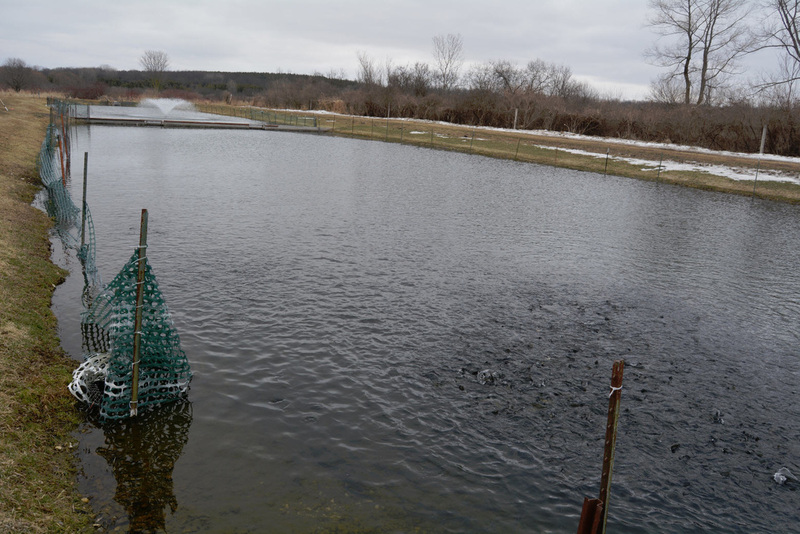 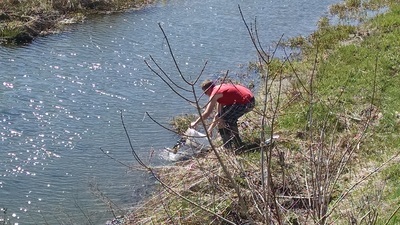 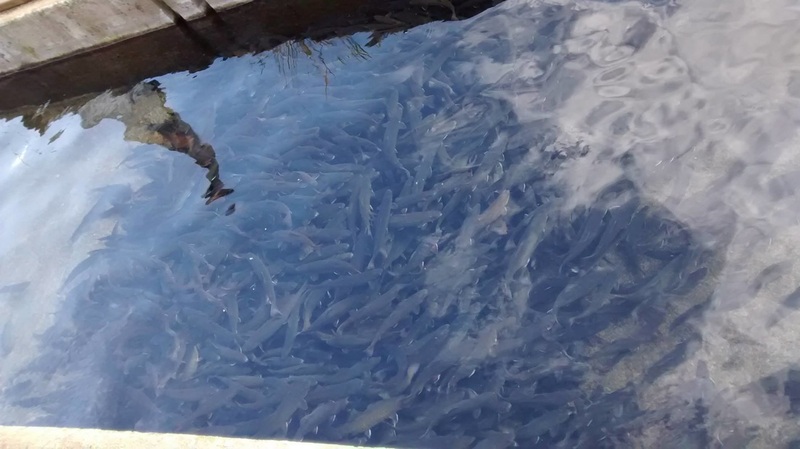 We started the season in June 2014, with getting the pond repaired and ready for inspection on June 12th, and the new trout arrived on June 17th. 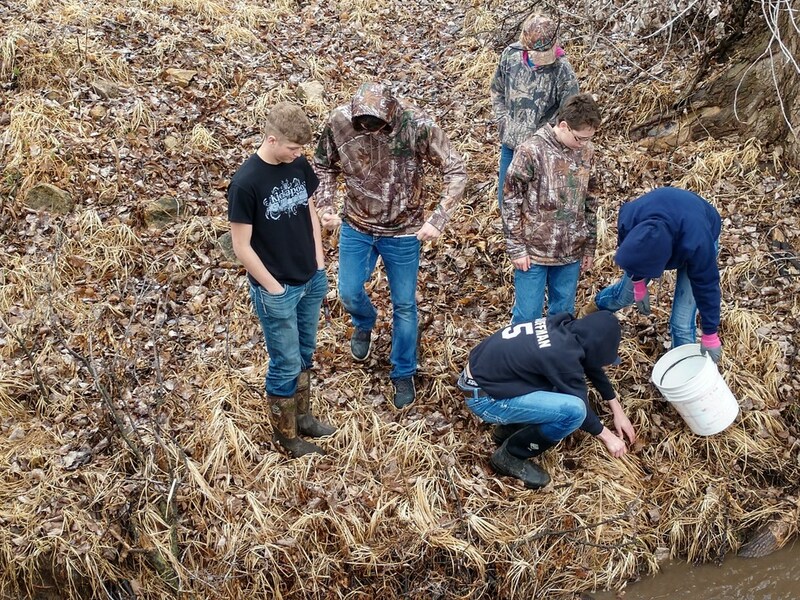 The trout are an inch and a half to two inches long when we get them, so estimating the number of trout we get is kind of tricky. 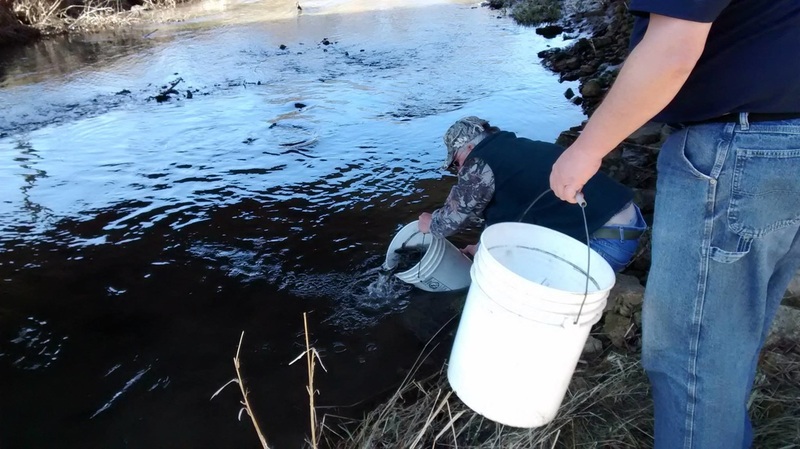 It was estimated that we had around 6,300 trout this year. 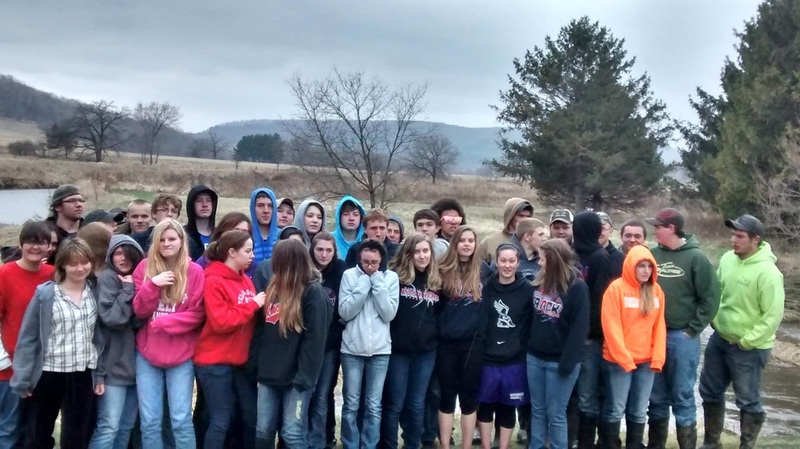 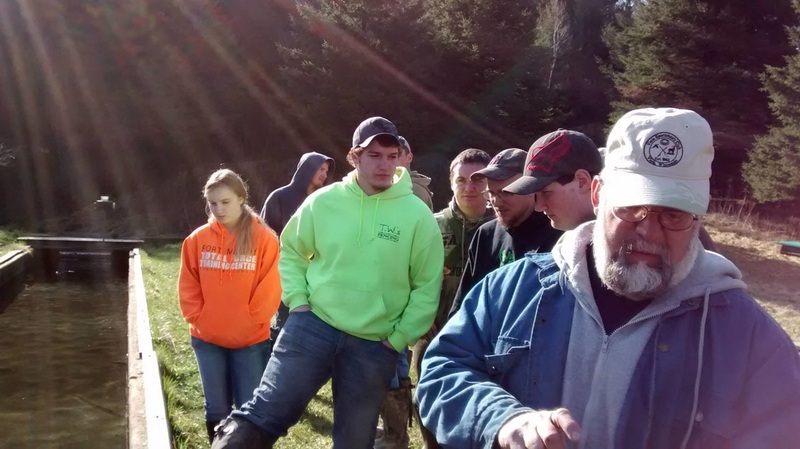 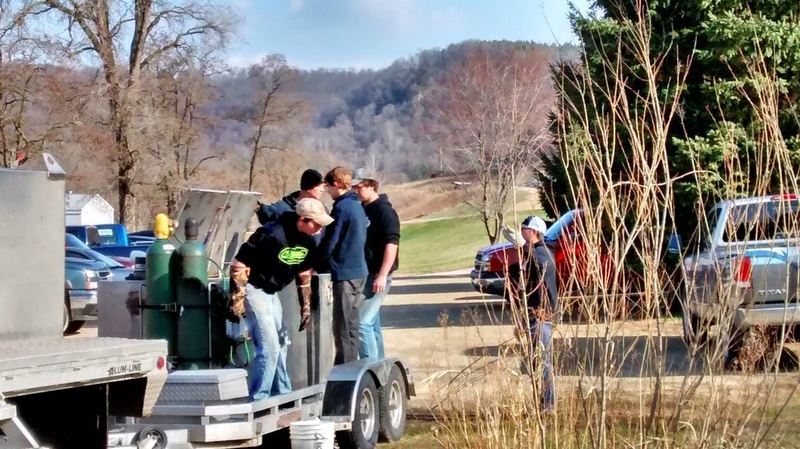 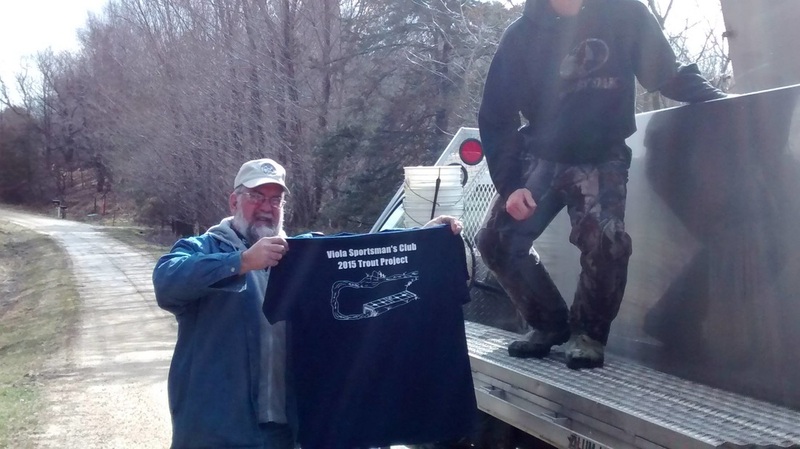 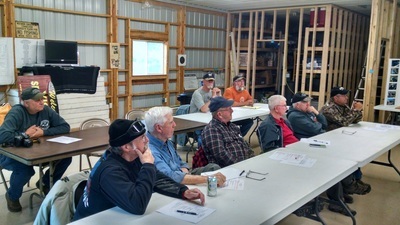 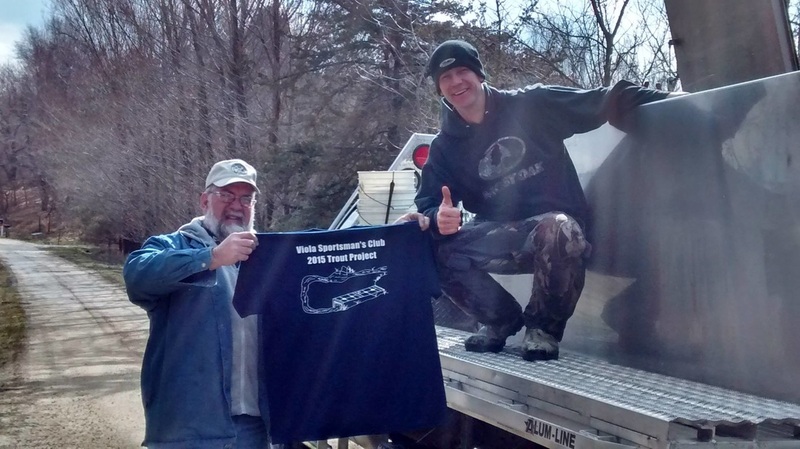 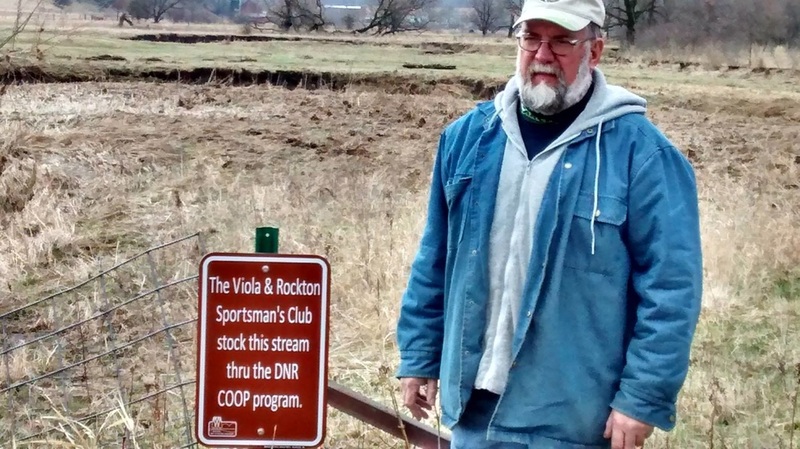 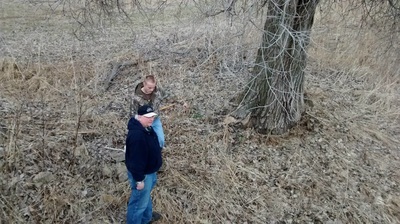 The Viola Sportsman’s Club and the Rockton Sportsman’s Club have combined efforts to keep this program growing for the last three years. 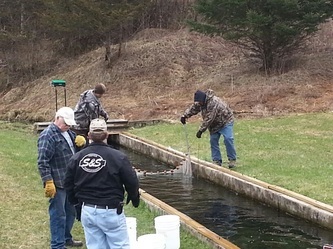 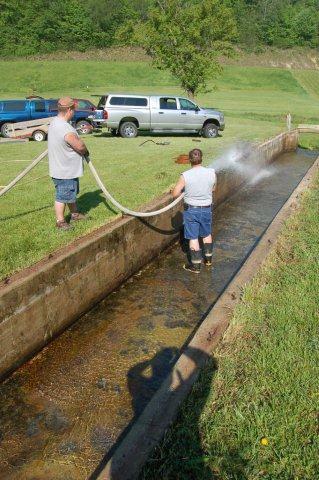 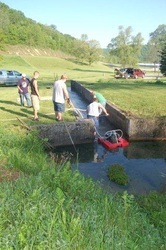 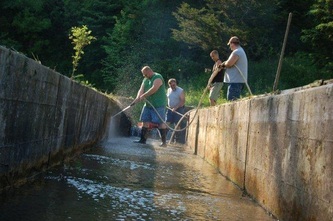 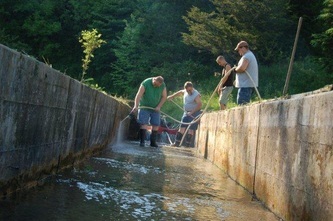 The VSC members are the caretakers of the trout, taking care of feeding and maintaining the cement raceway during the process. 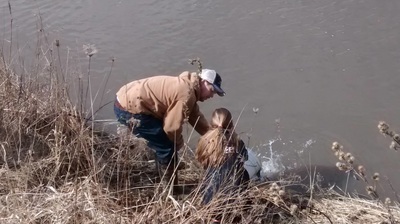 The RSC provides financial support to help pay for the trout feed. 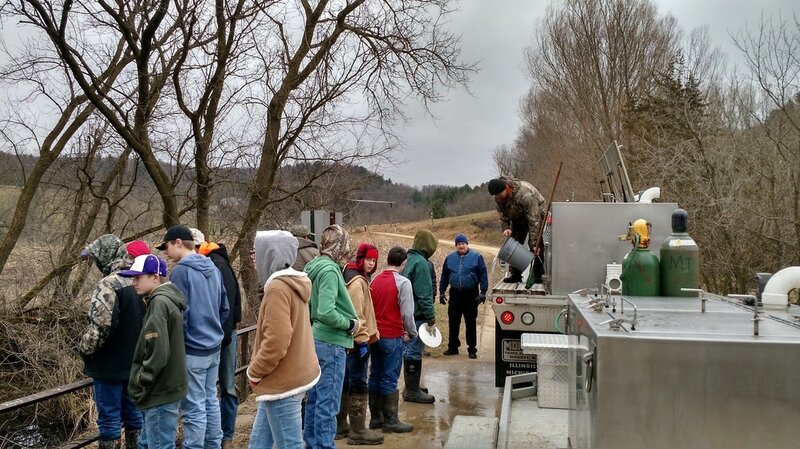 Part of our daily duties as caretakers is to follow the DNR’s feeding schedule and to document things as we go. 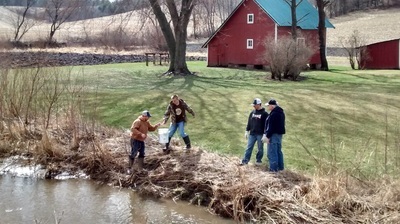 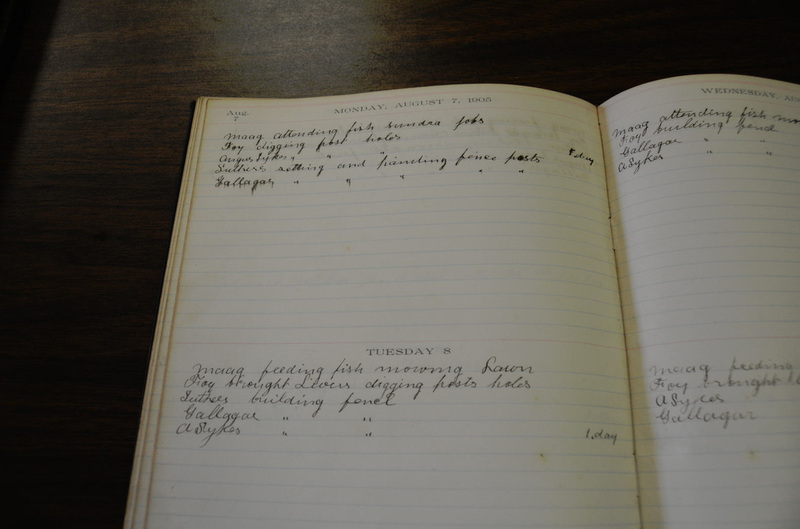 We also keep track of any trout mortalities during the season. It’s expected we will lose a couple hundred trout during the process, so we keep track daily and notify the DNR if there is anything abnormal. 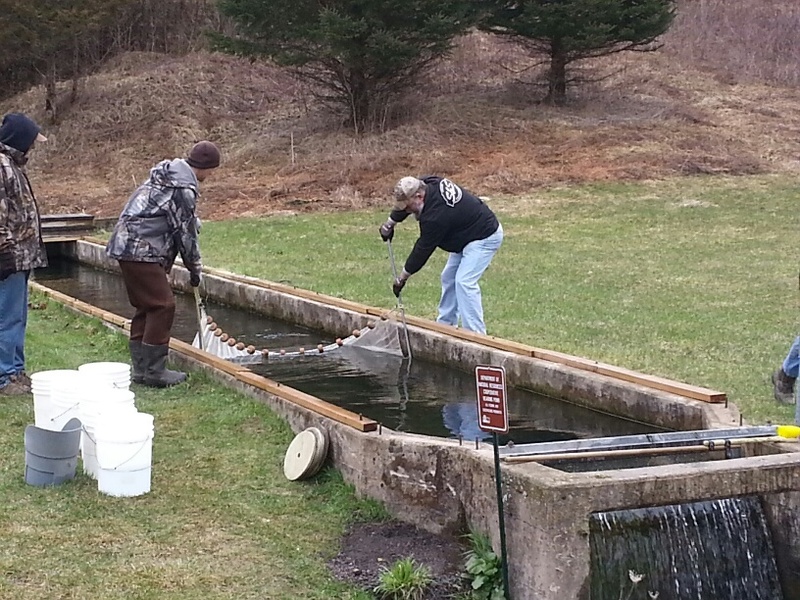 We are proud to report we only had 81 trout mortalities this season, by far our best. 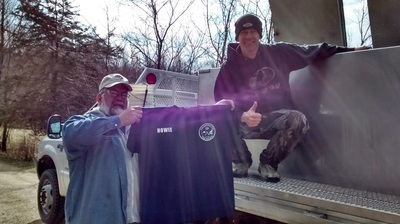 We are fortunate that David “Howie” from the DNR is able to alter his work schedule to allow us to stock on two days. 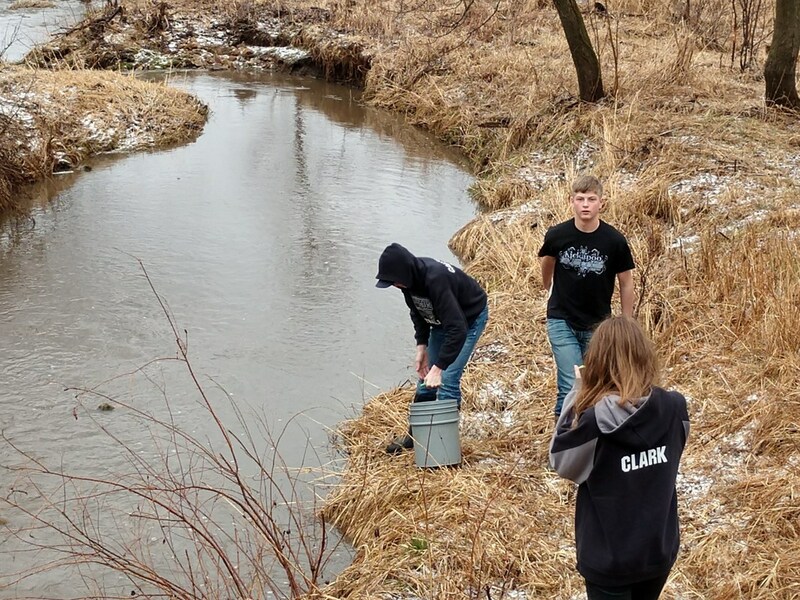 Because of that, we were able to get two local schools involved on the Friday stocking day, and members and their families take care of stocking on Saturday. 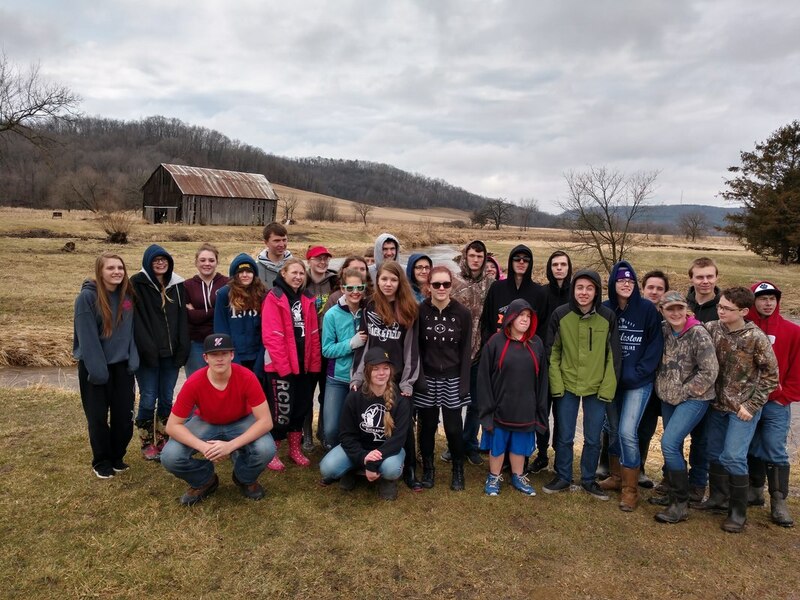 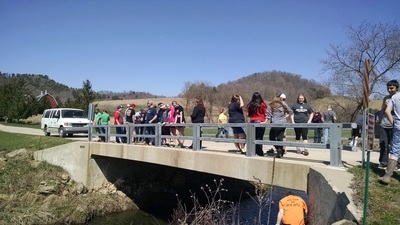 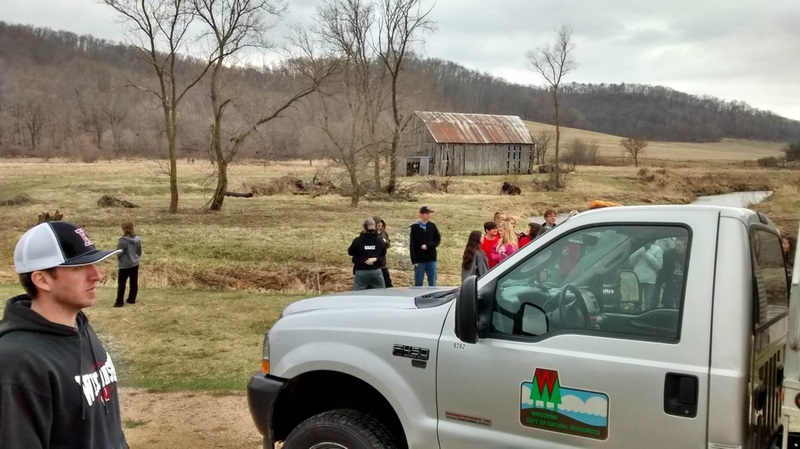 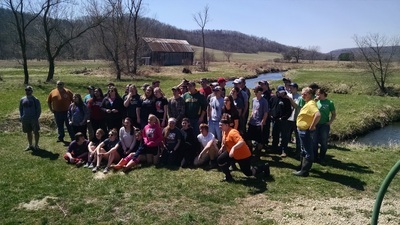 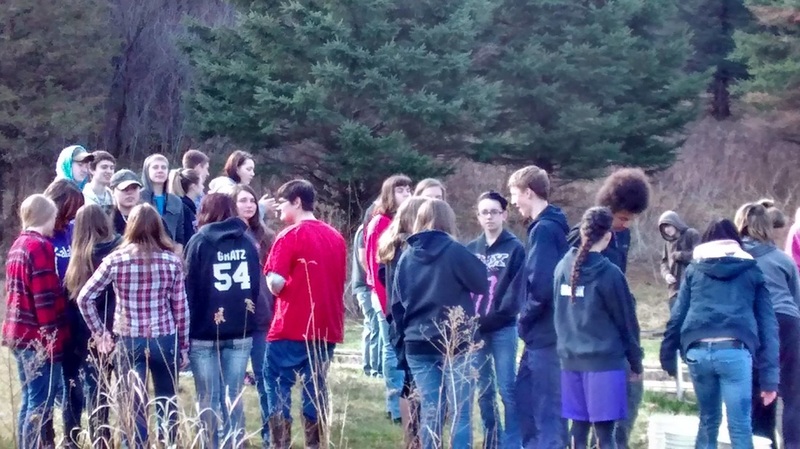 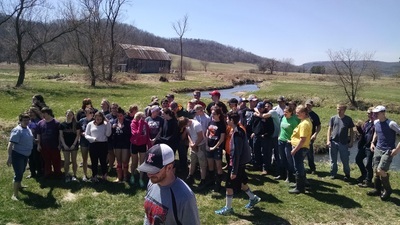 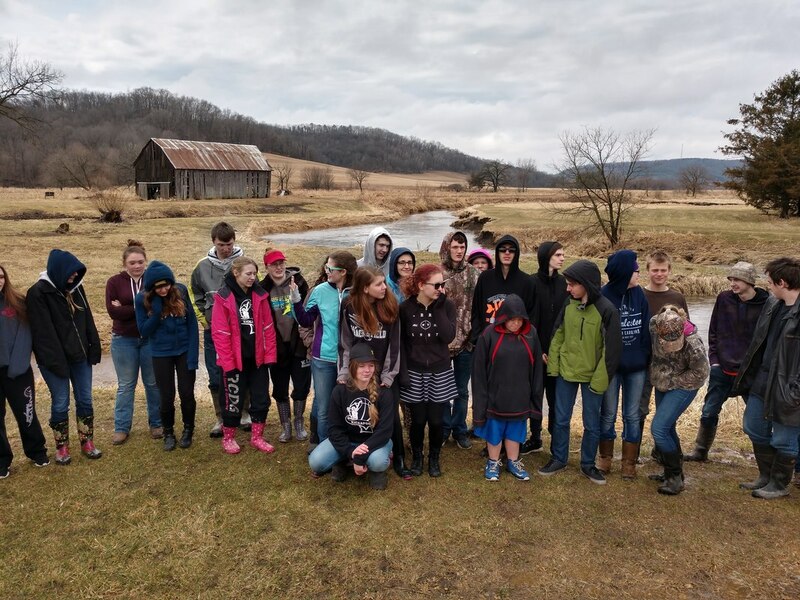 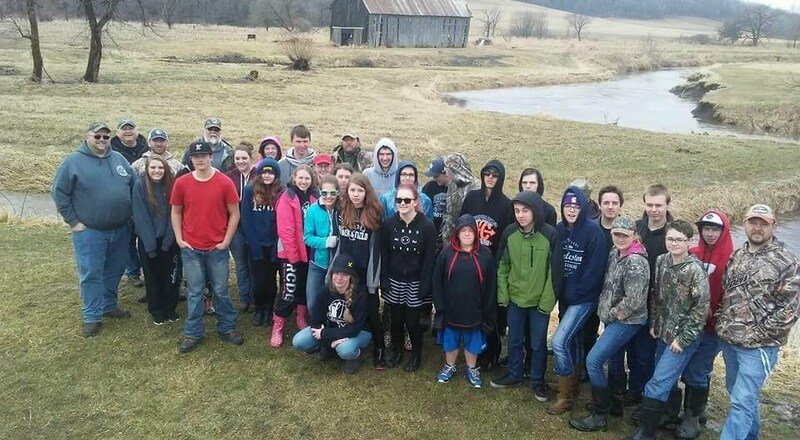 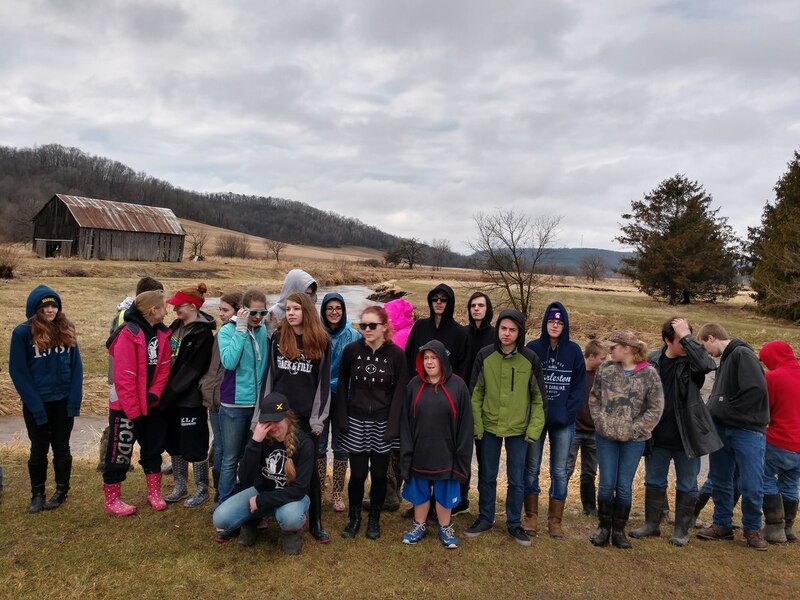 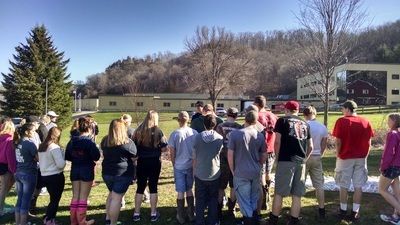 This year we had a combined 41 students participate on Friday from Kickapoo and LaFarge High Schools, plus their teachers, bus drivers, and probably another dozen club members. 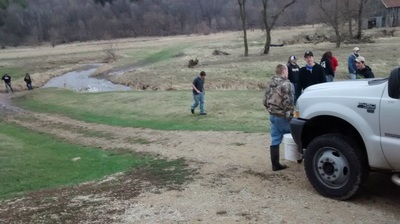 On Saturday we had about a dozen members complete the stocking for the year. 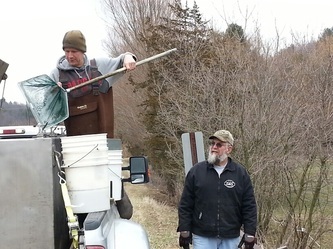 We started Friday out by having Howie explain the overall stocking process, from collecting eggs in the fall in a local stream, to raising the trout at the Nevin Fish Hatchery in Madison, to what we do when they turn the trout over to us. From June to April, the trout grew from 2” to an average of 10.1”, which for a wild Brook Trout is really big! 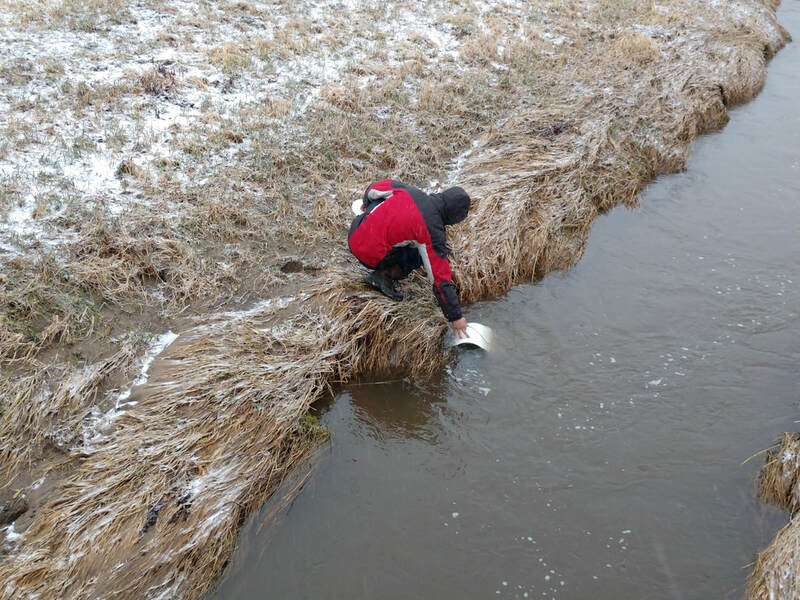 This year the students asked lots of great questions and they took an active part in the stocking. 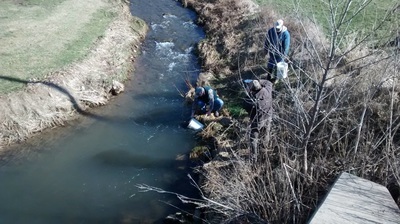 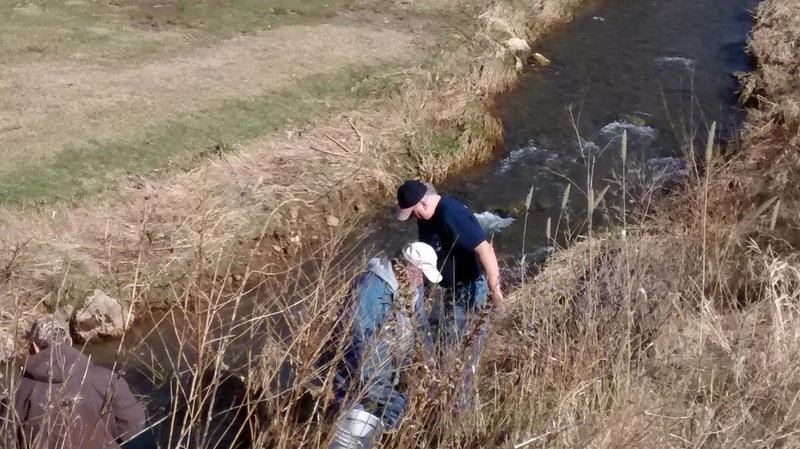 In all, this year we stocked the trout in eight different streams, three near Yuba, three different branches of Bear Creek, and different locations on Otter, Jug, Champion, 24 Valley, and Cheyenne Creek. 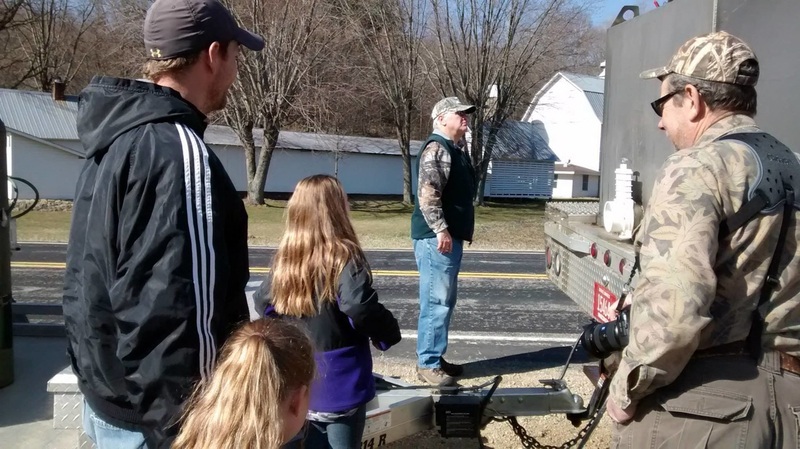 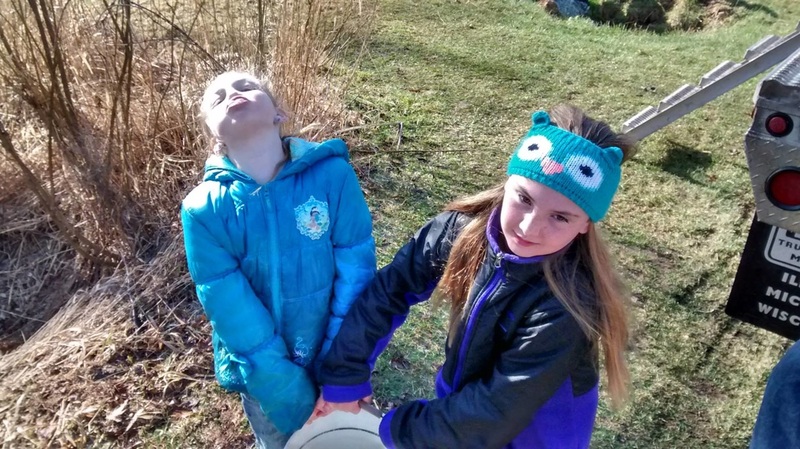 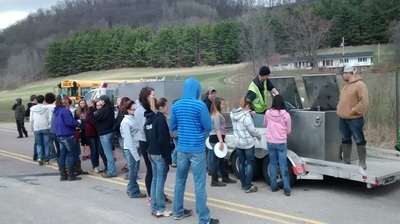 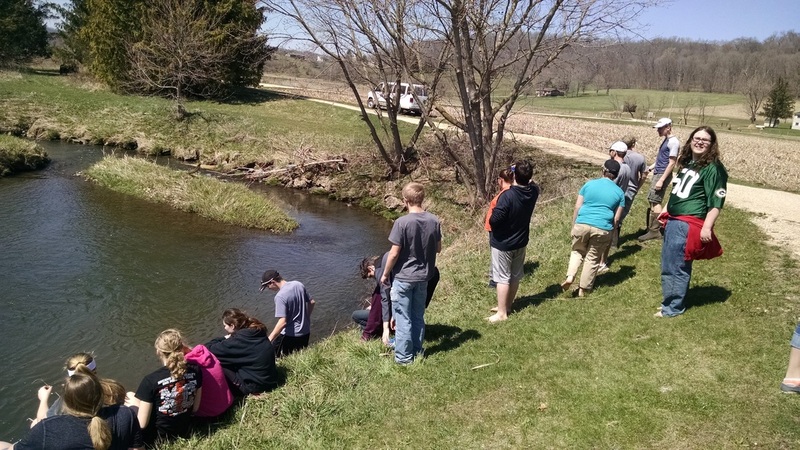 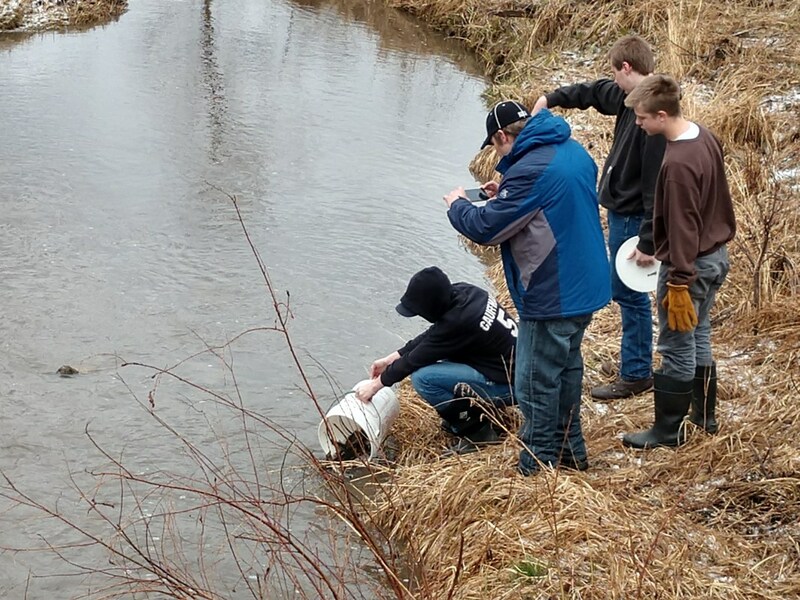 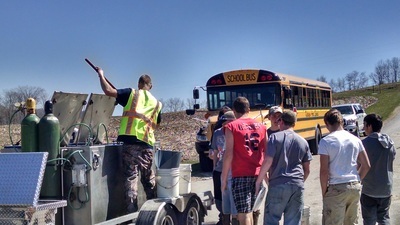 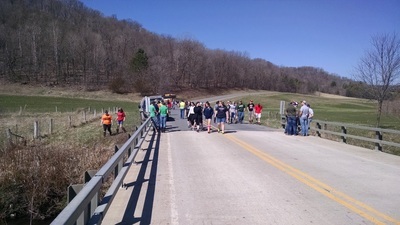 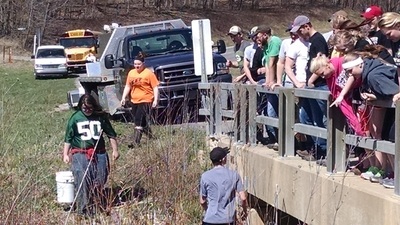 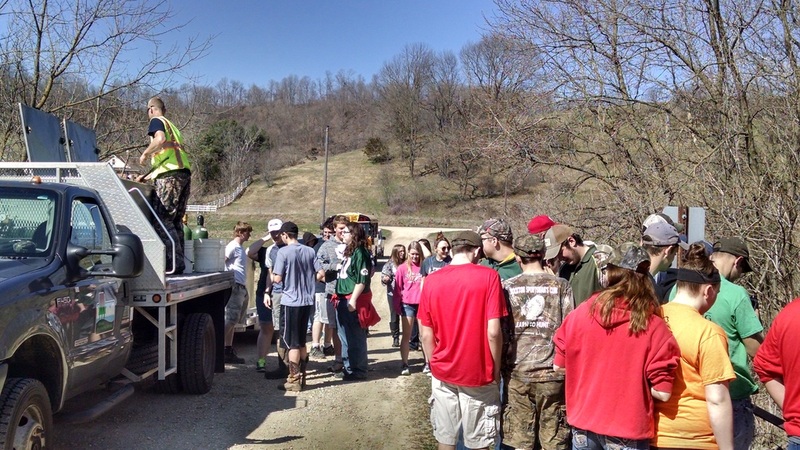 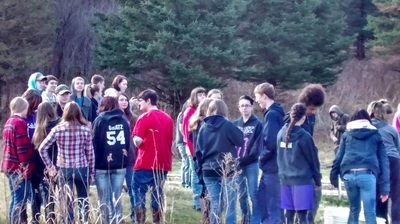 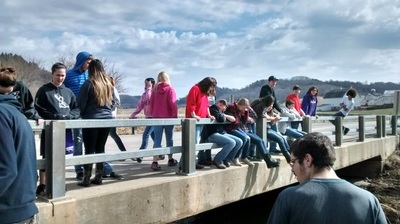 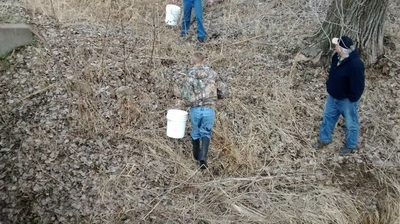 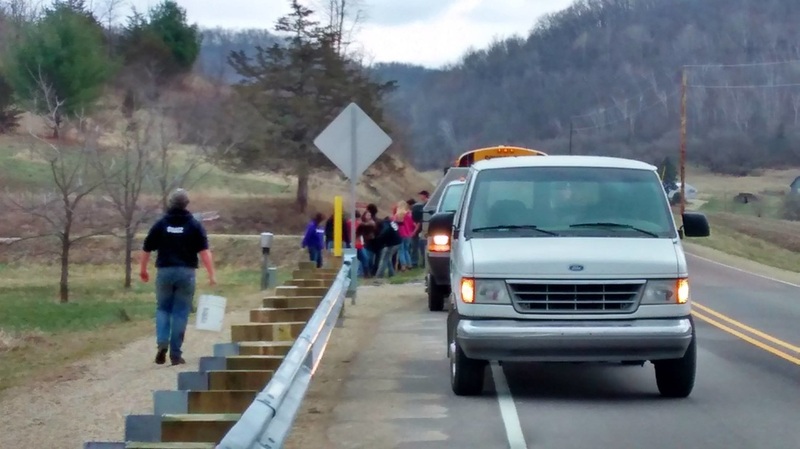 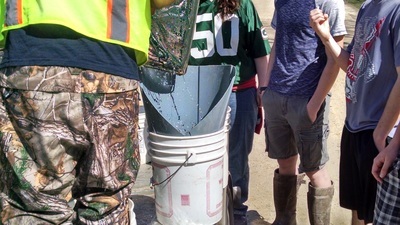 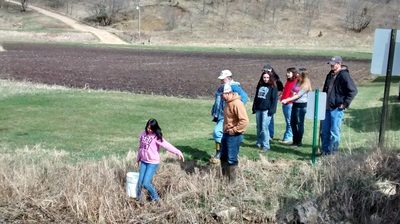 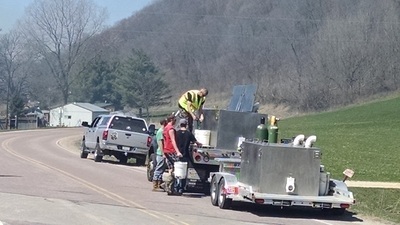 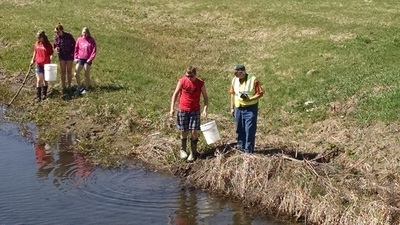 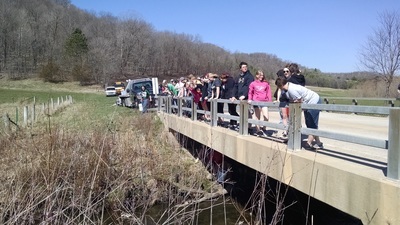 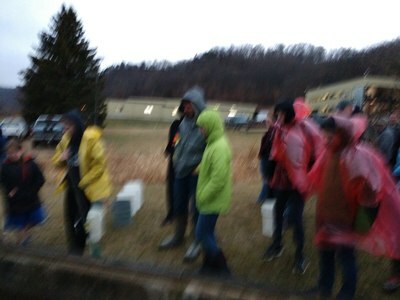 So with Howie leading a fairly big convoy of buses and other vehicles, we made several stops and the students got to participate by carrying buckets of trout from the tanker truck to the streams. 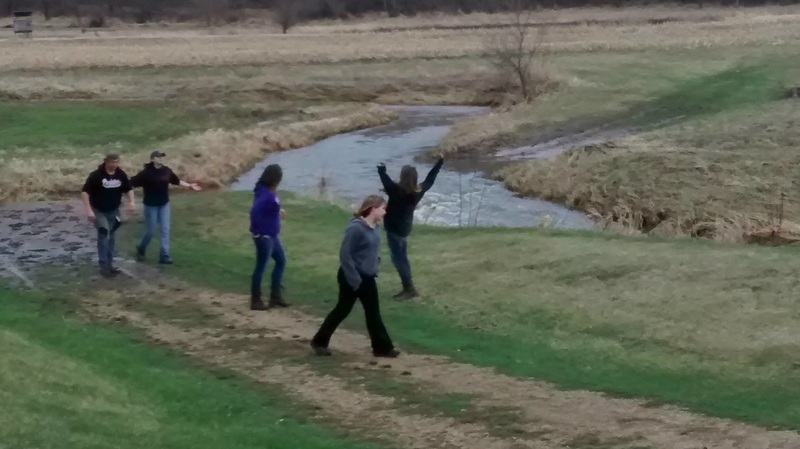 There are always lots of smiles to be seen as they pour the trout into the creeks. This year we again provided all the helpers with a small picnic lunch both days at one of the stocking locations. 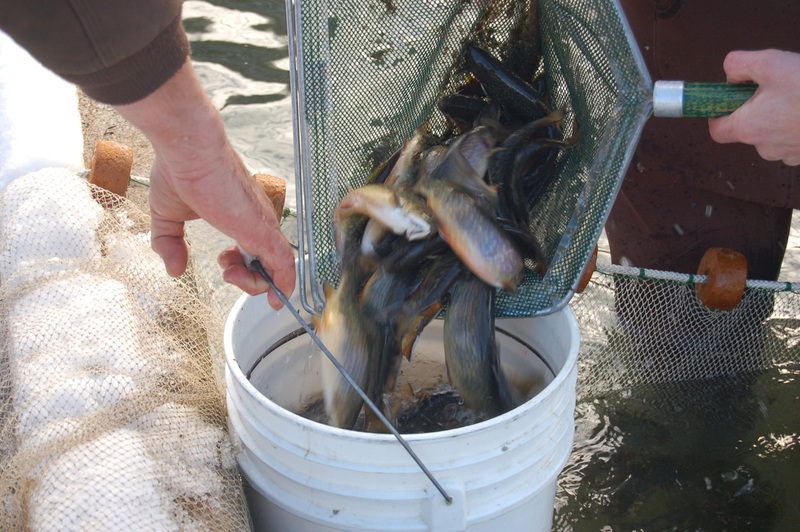 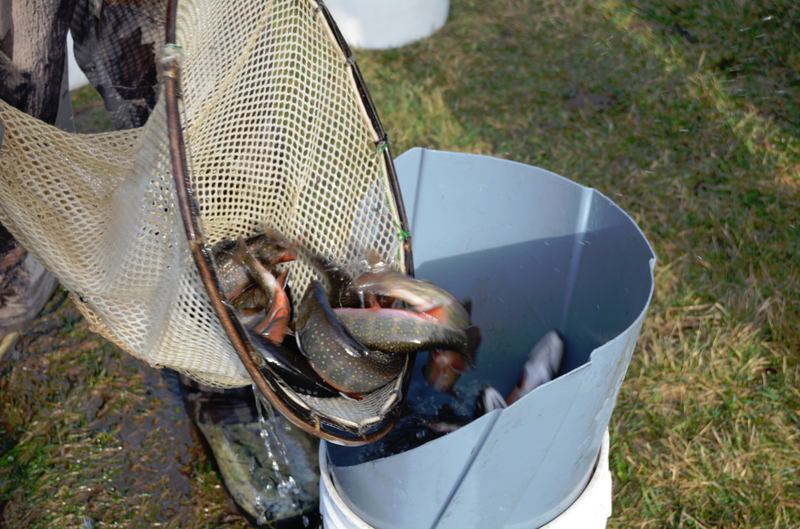 To arrive at the total number of trout stocked we count two buckets of trout and take an average. 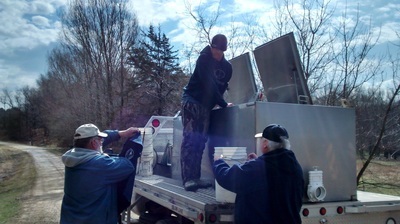 Then multiply that by the number of buckets of trout we load into the tanker truck. 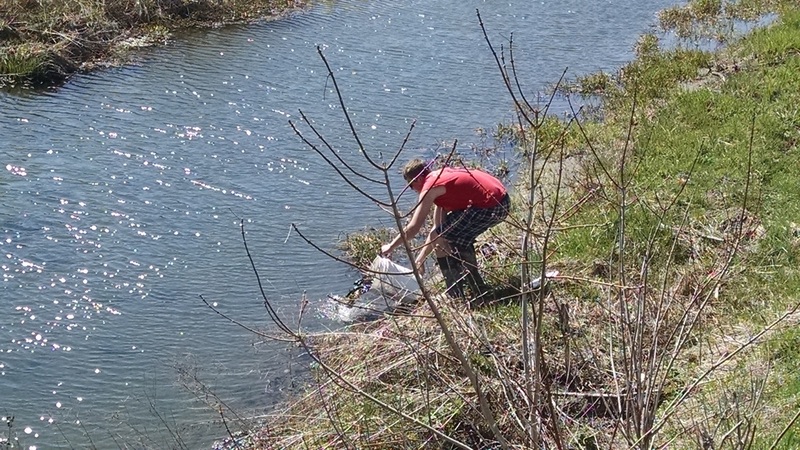 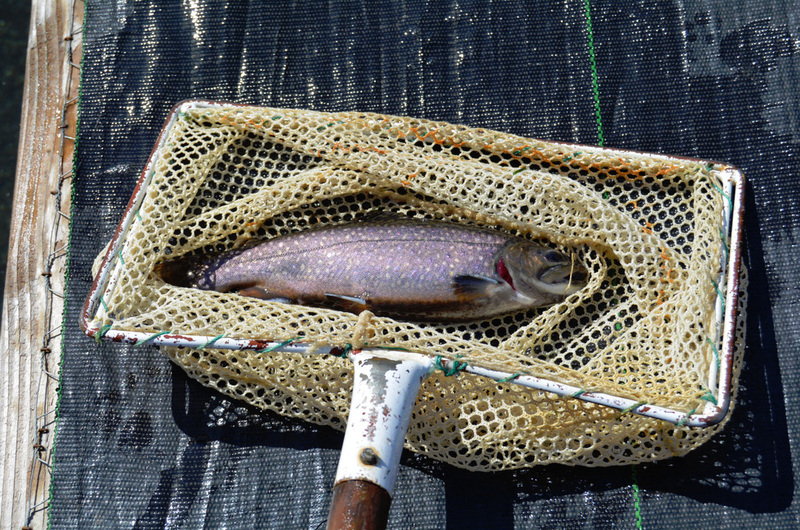 The final estimated total of trout stocked this year was 5,123 Wild Brook Trout that averaged 10.1”J. Both the VSC & RSC’s would like to thank everyone who participated and supported this program this past year. 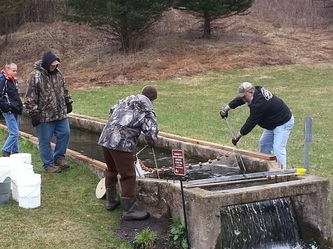 It’s turned into a very rewarding program for the clubs, students & teachers, and we’re sure for the many trout fishermen and women who are able to enjoy catching these wild Brook Trout in our local streams. 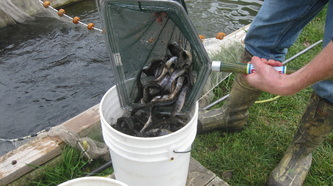 We had a great couple of days again this year to release. 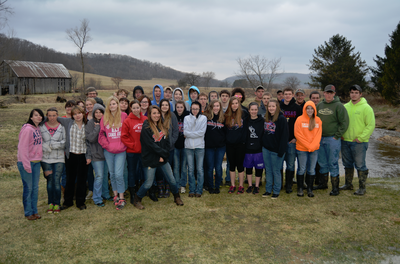 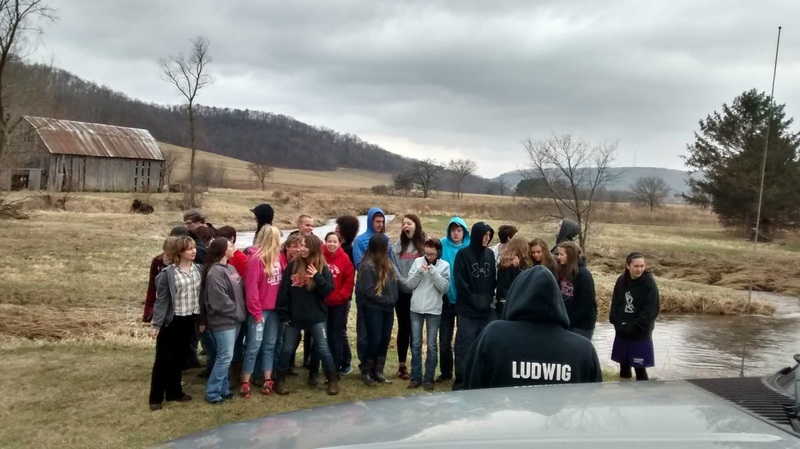 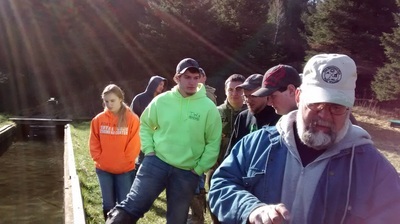 Big thanks to all the students from Kickapoo and Lafarge that joined us on Friday. Also thanks to the members that put in so much effort to make this happen. 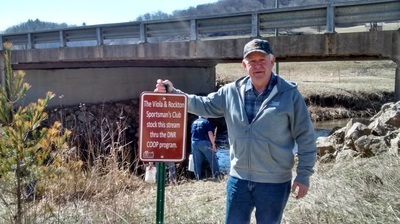 What a great project for the club and the community. 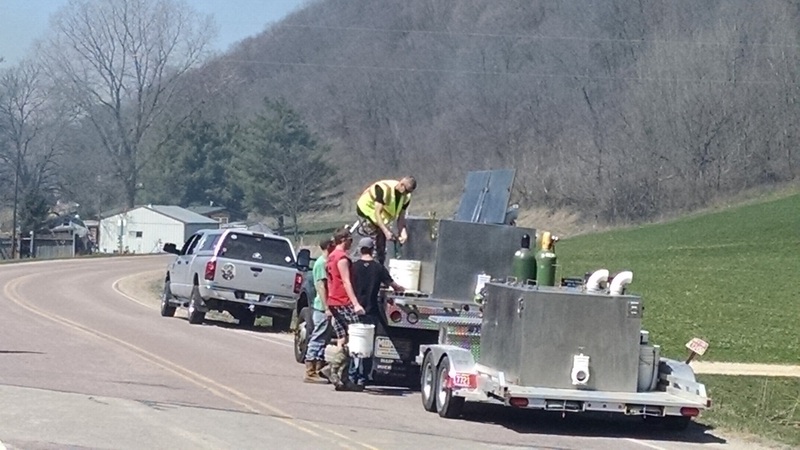 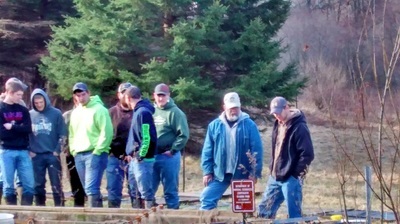 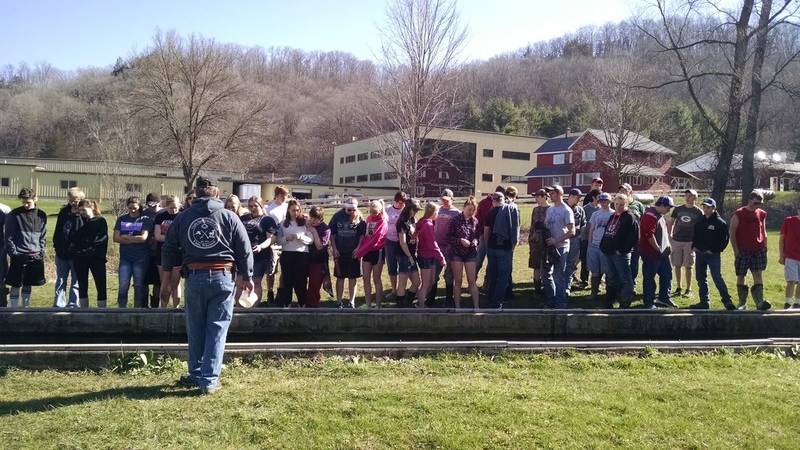 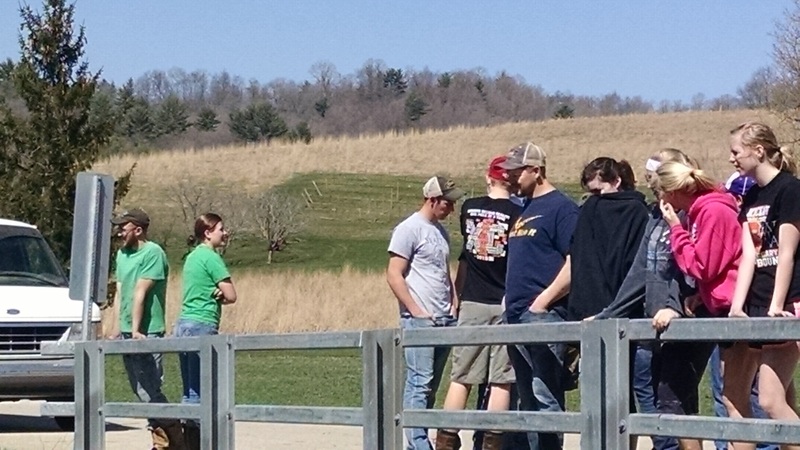 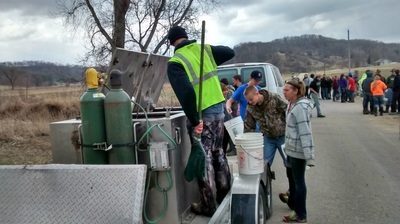 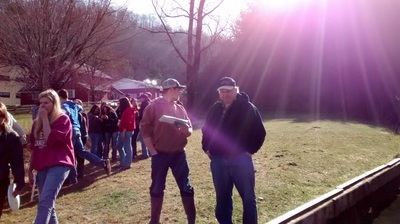 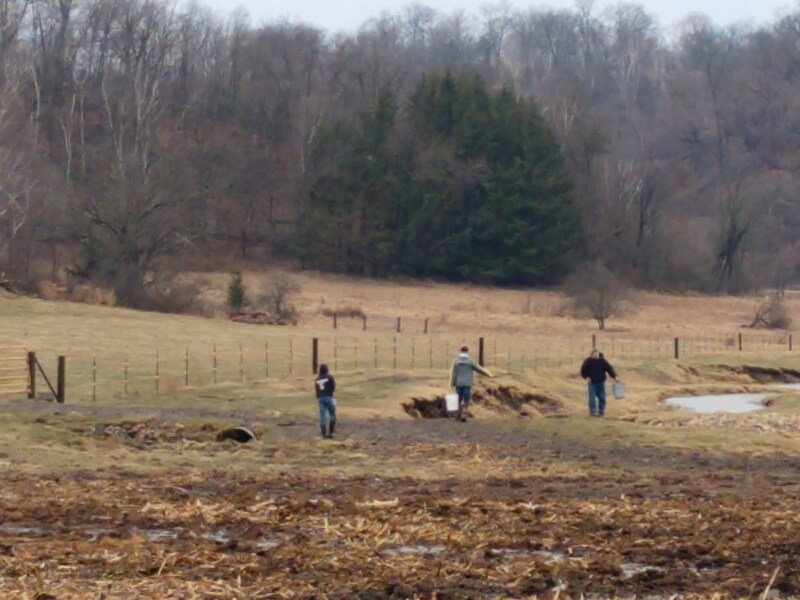 The Viola Sportsman’s Club would like to thank everyone who helped us stock trout last Friday, 04-04-2014 and Saturday, 04-05-2014. 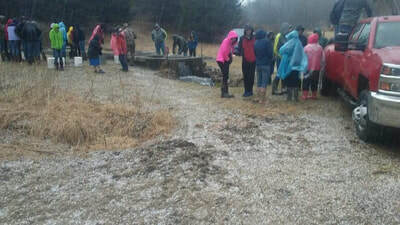 We had lots of students and kids help out this year and they all seemed to enjoy it, even though the weather was not very nice on Friday. 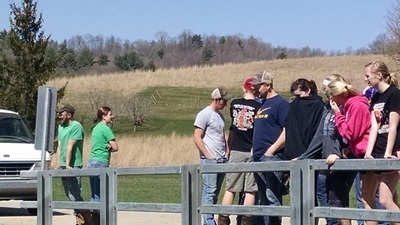 Saturday we had a perfect weather day and everyone had a great time. 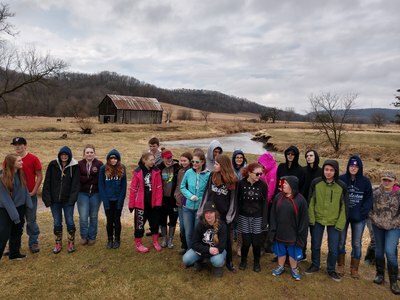 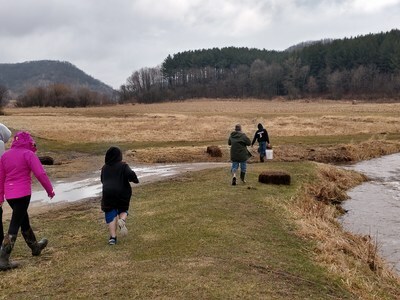 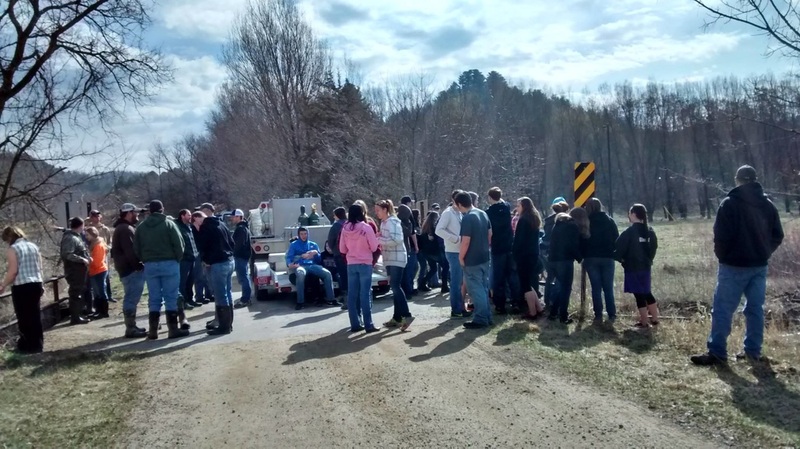 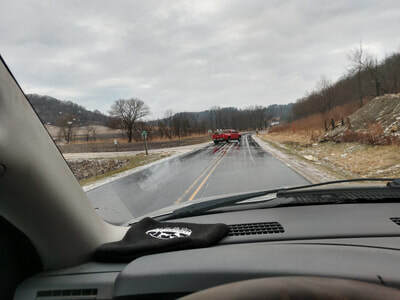 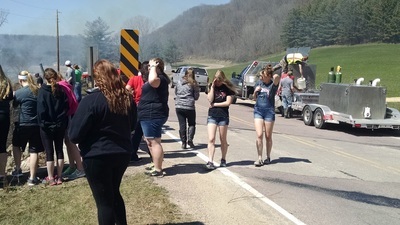 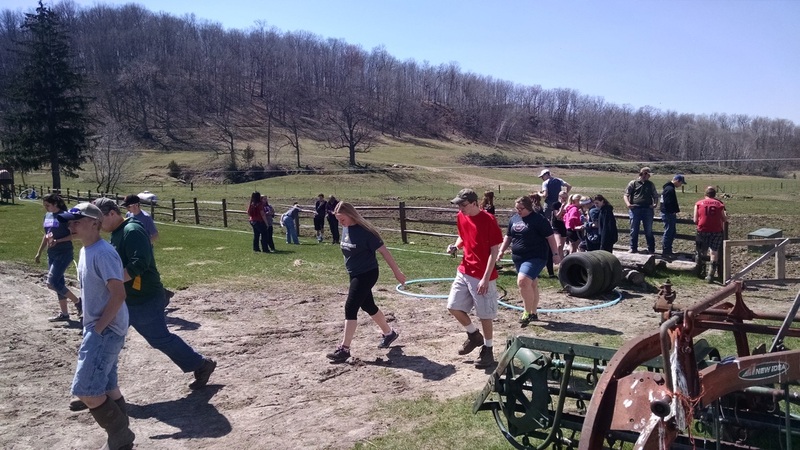 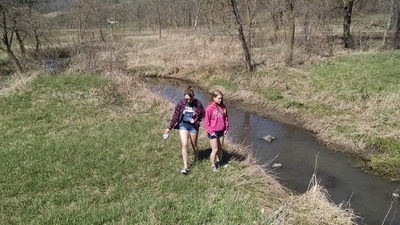 We had kids from Kickapoo High School, kids from Viroqua, and several VSC members kids all participated, and there were lots of smiling faces every place we stopped. Friday we had close to fifty people help with the stocking, and close to twenty five helped on Saturday. We had a great turnout this year. As soon as we gather all of the pictures that were taken, we will post them on the website. 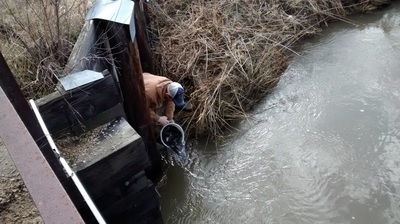 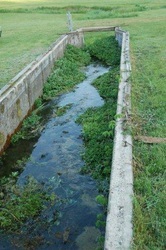 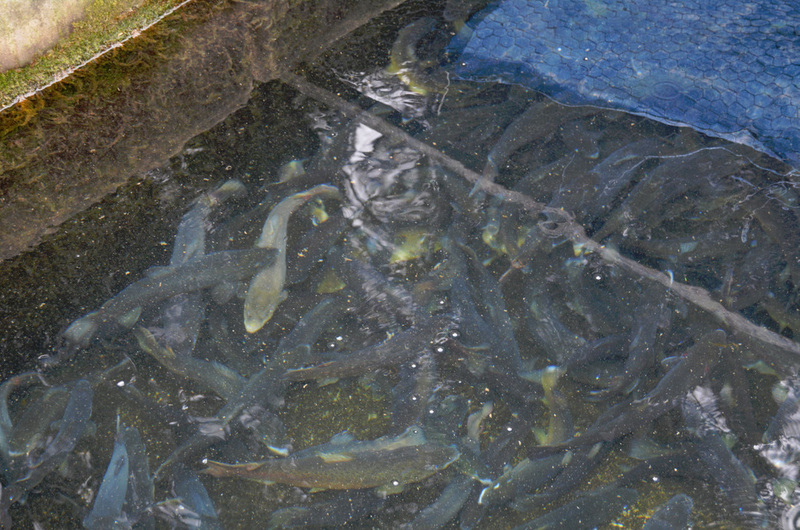 Last year the VSC stocked 846 trout in three streams near Yuba. 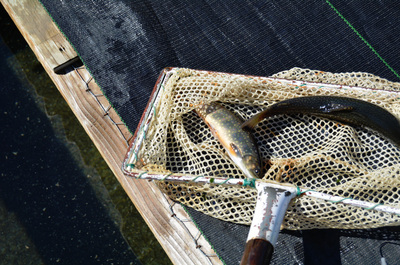 This year we stocked 6868 Brook Trout! 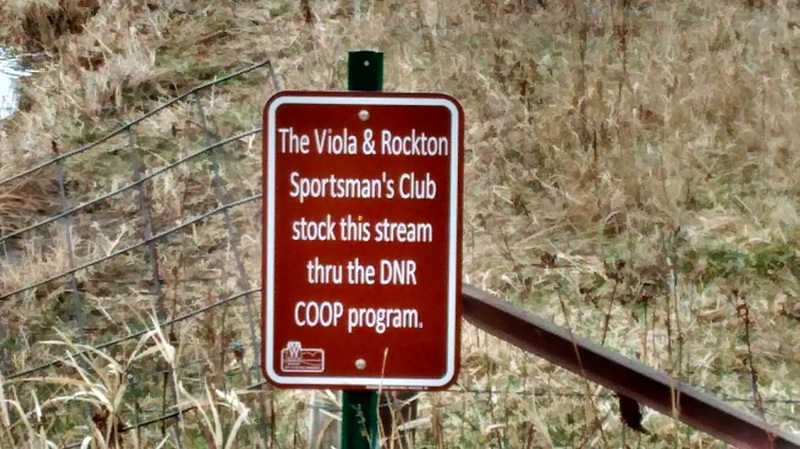 This is a great increase for us, and we need to thank the Rockton Sportsman’s Club for their generous contribution to this program, we couldn’t have done this without their help. Both clubs have also committed to raising the same number of trout this coming year. 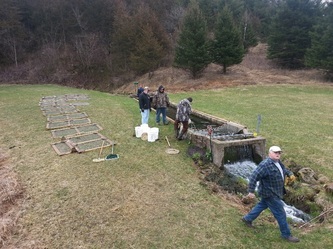 Thanks again to all those who helped stock the trout, feed the trout, and to all those who have supported our fundraising efforts for the trout program. 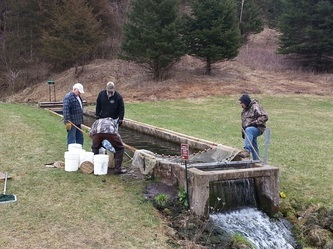 The trout are only a couple weeks away from being released. 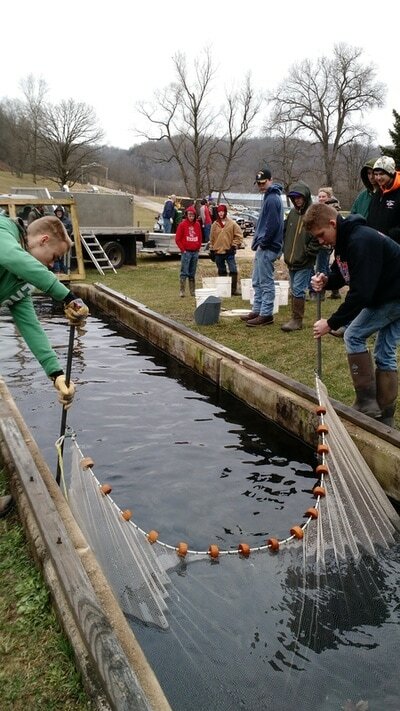 The stocking dates are Friday April 4th, and Saturday April 5th. 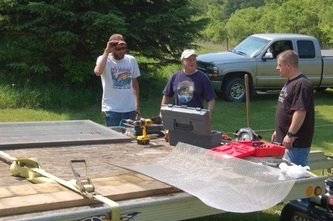 We will be stocking around 7000 native Brook Trout this year with the help of the Rockton Sportsman’s Club. The RSC was a partner in our program this year, and they will be doing the same next year. 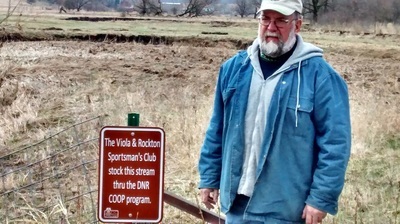 We couldn’t be involved with the COOP program to the extent we are without their help. 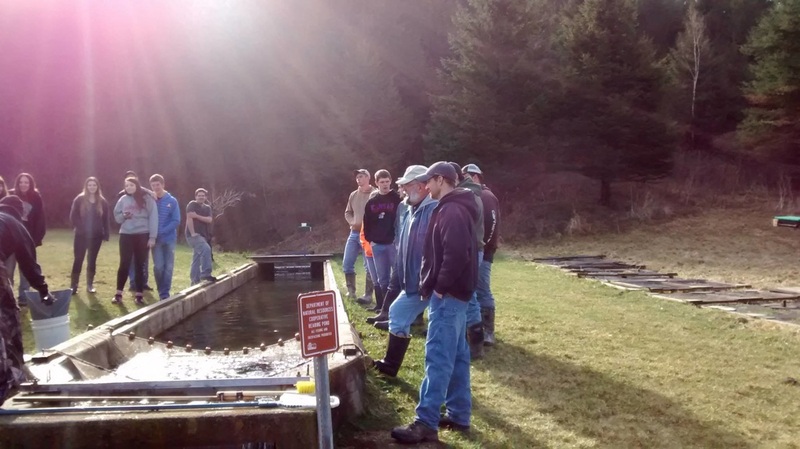 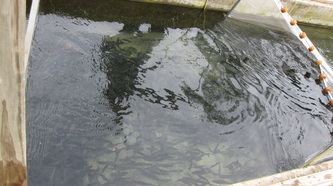 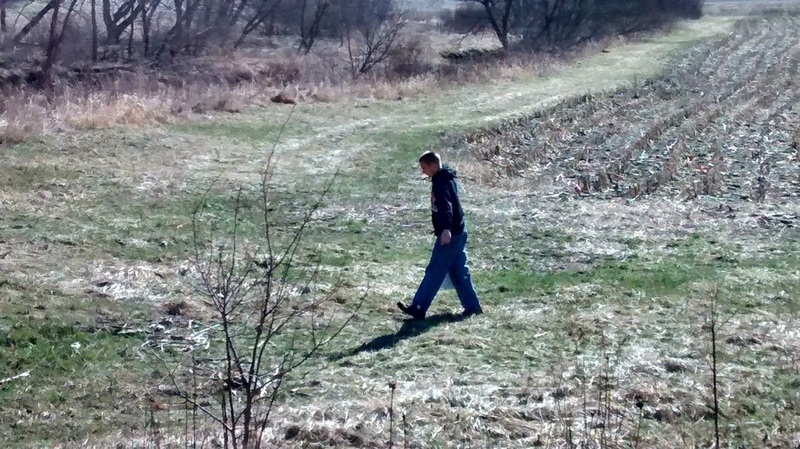 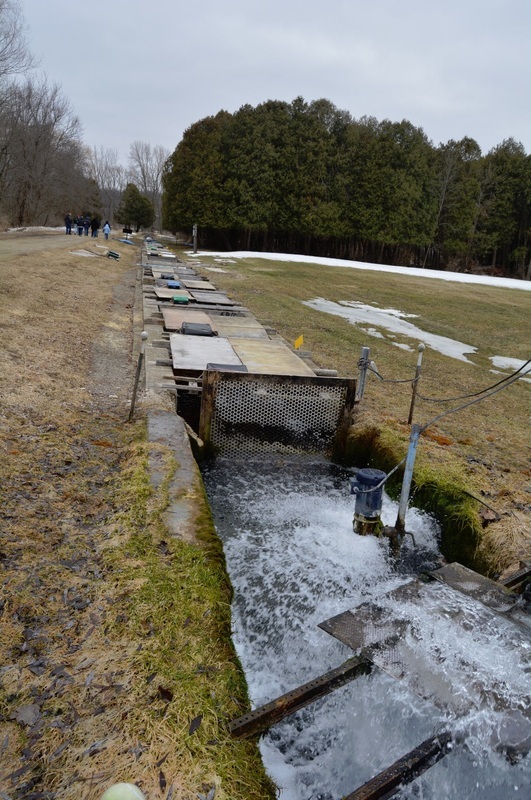 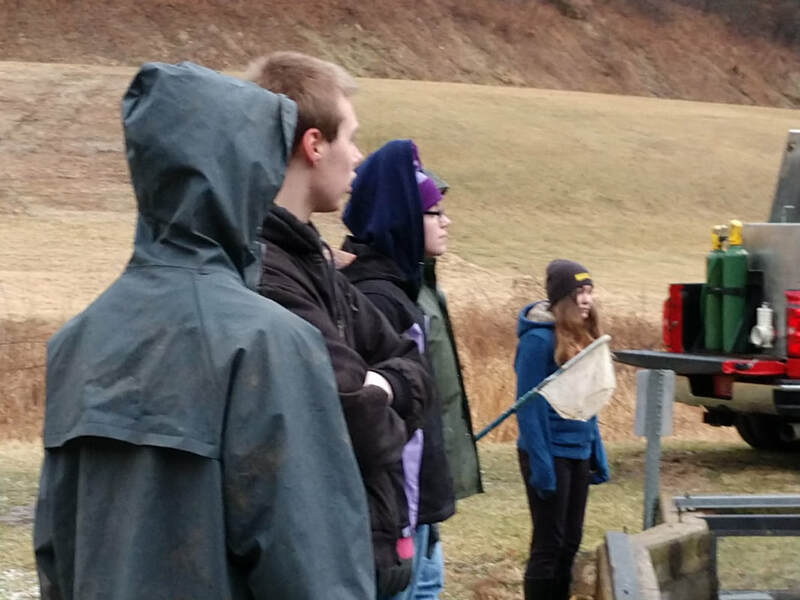 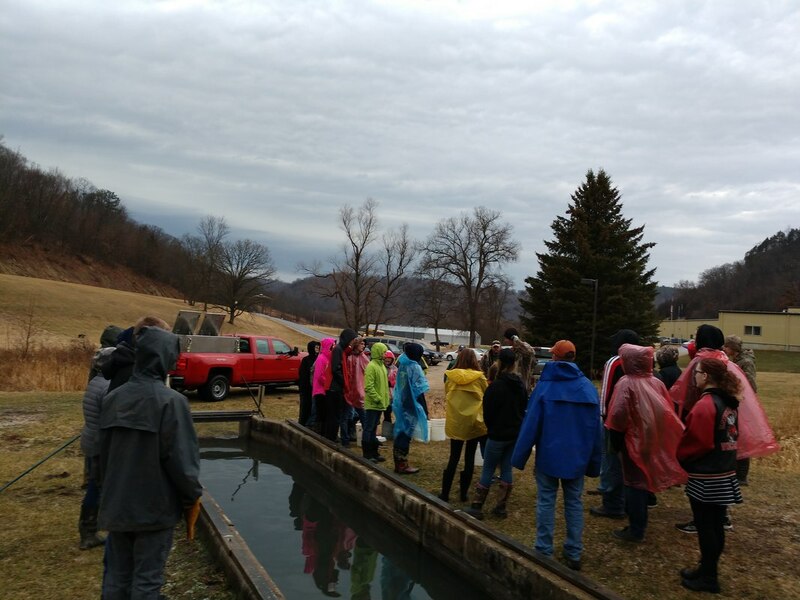 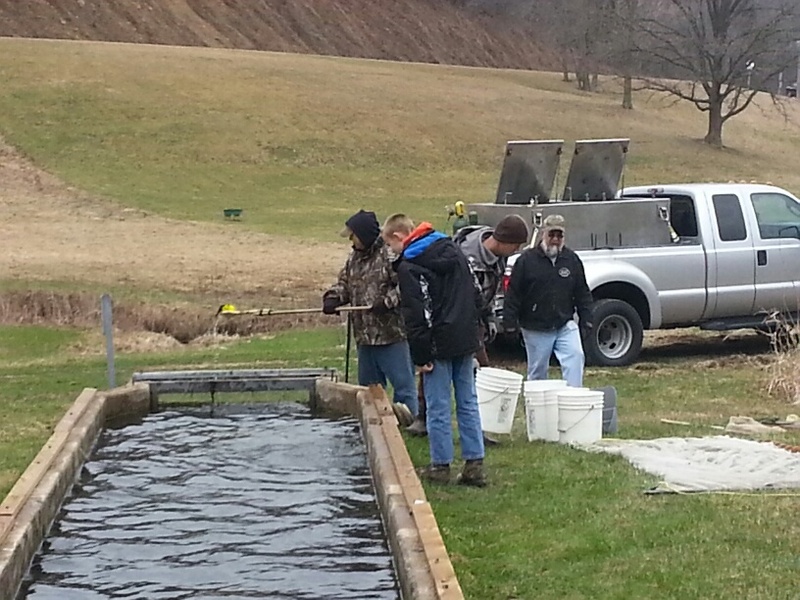 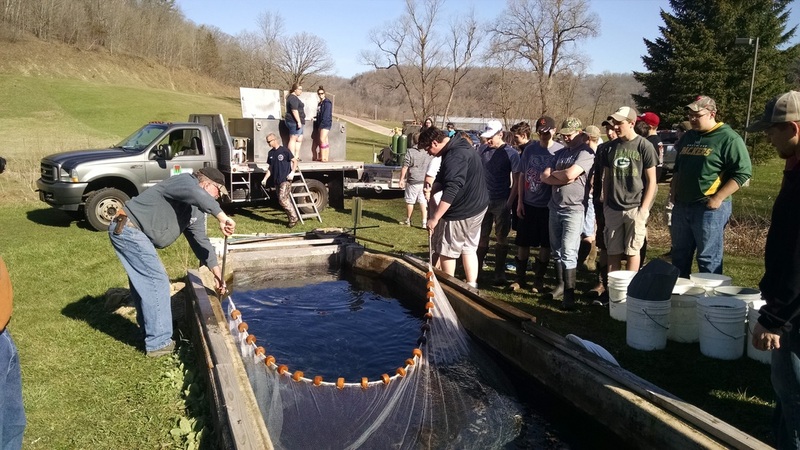 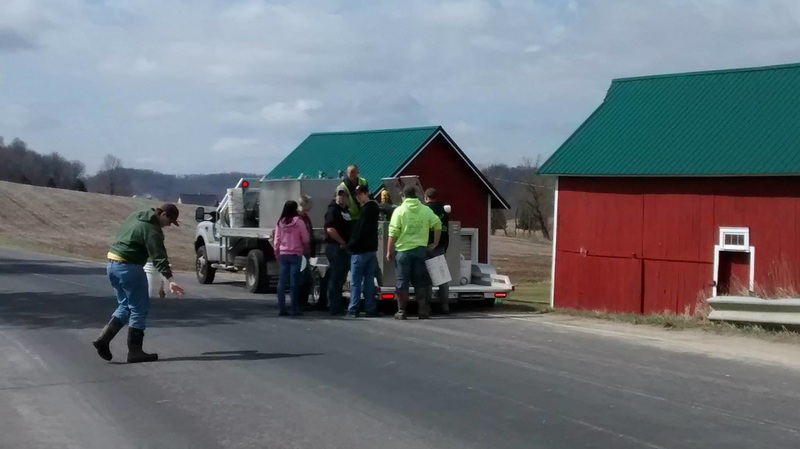 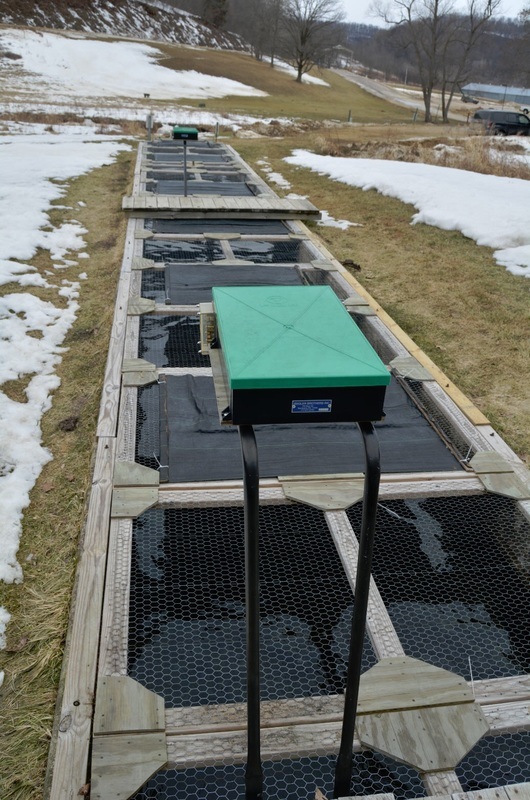 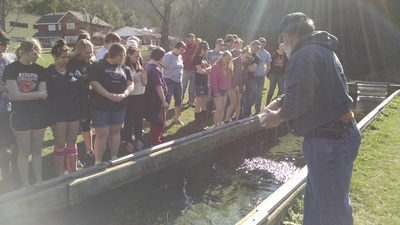 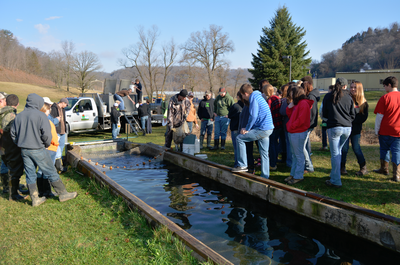 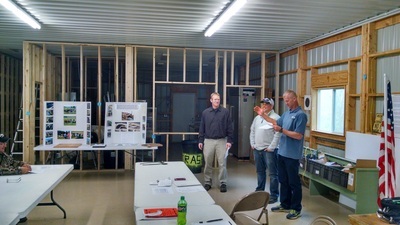 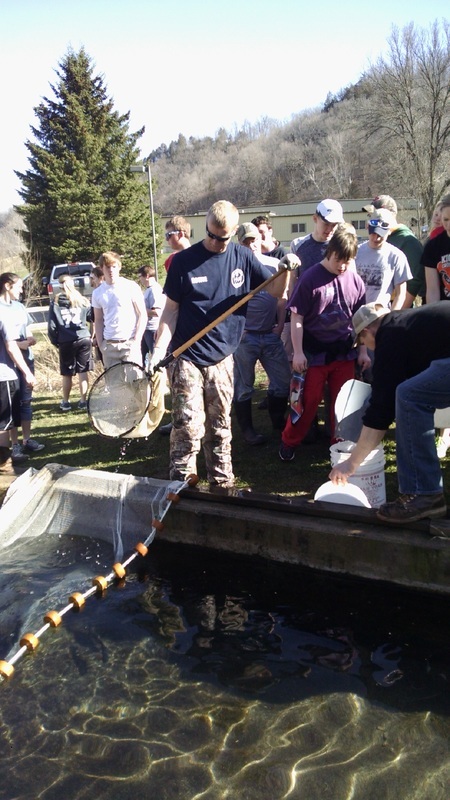 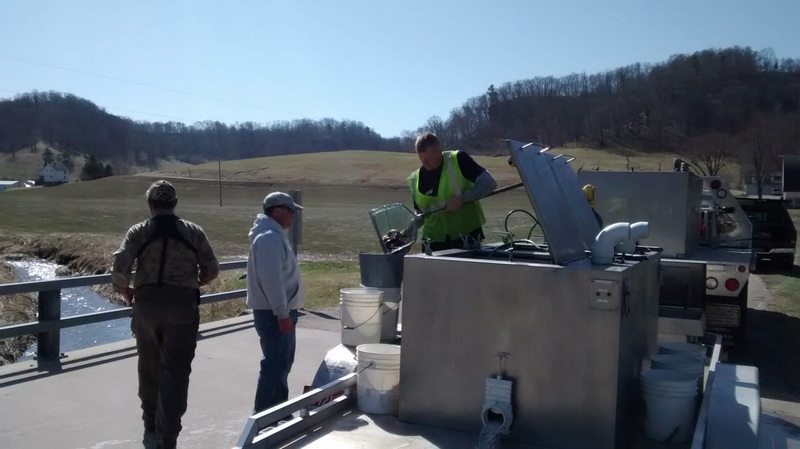 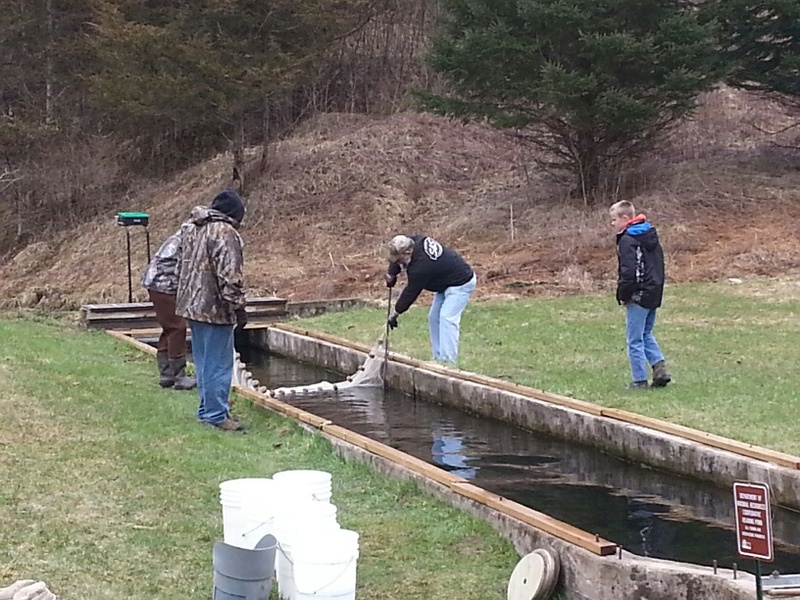 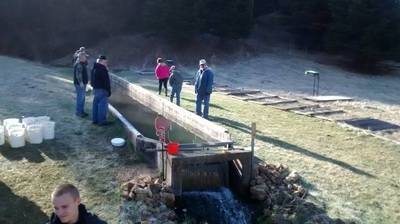 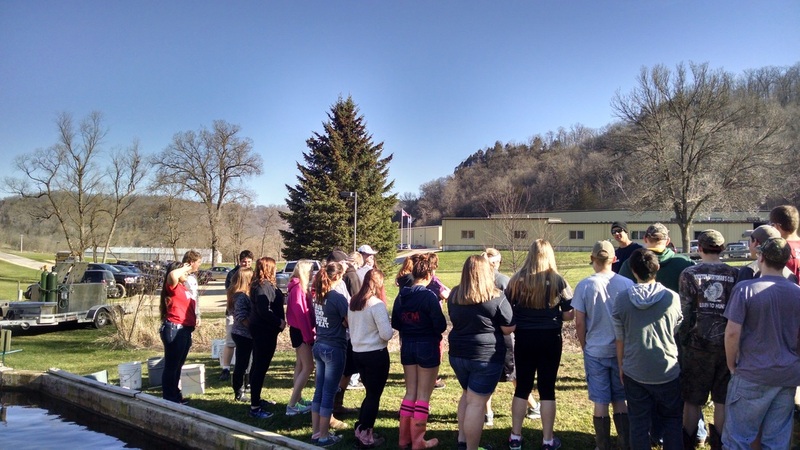 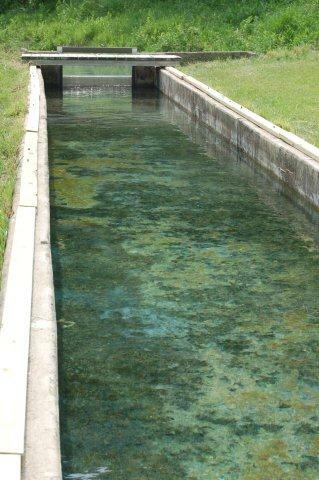 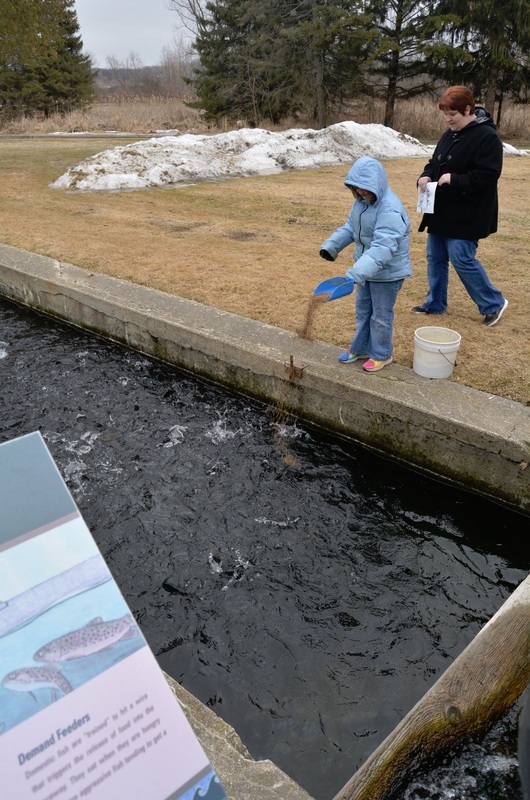 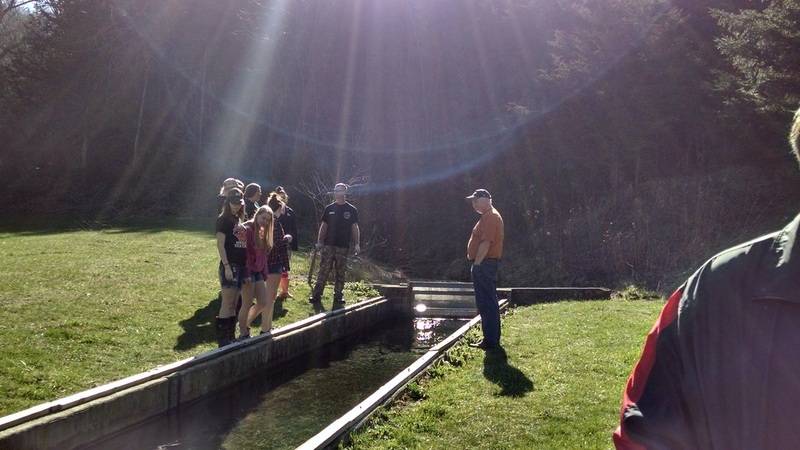 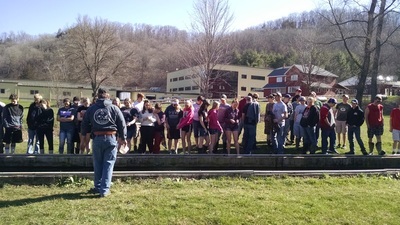 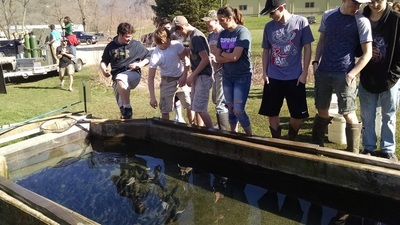 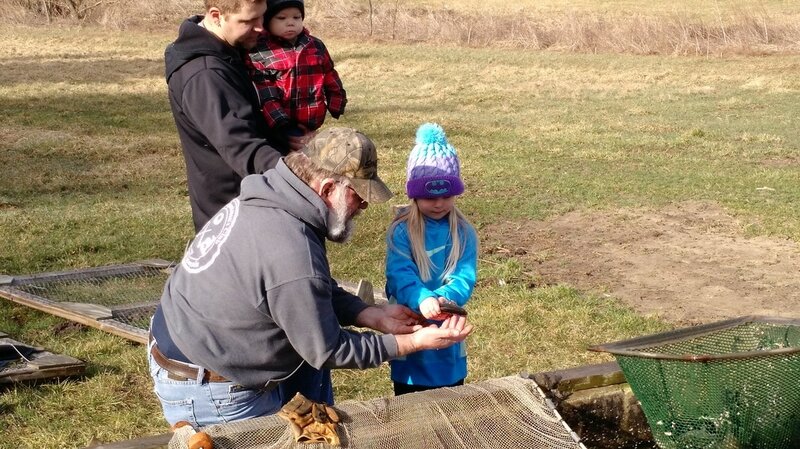 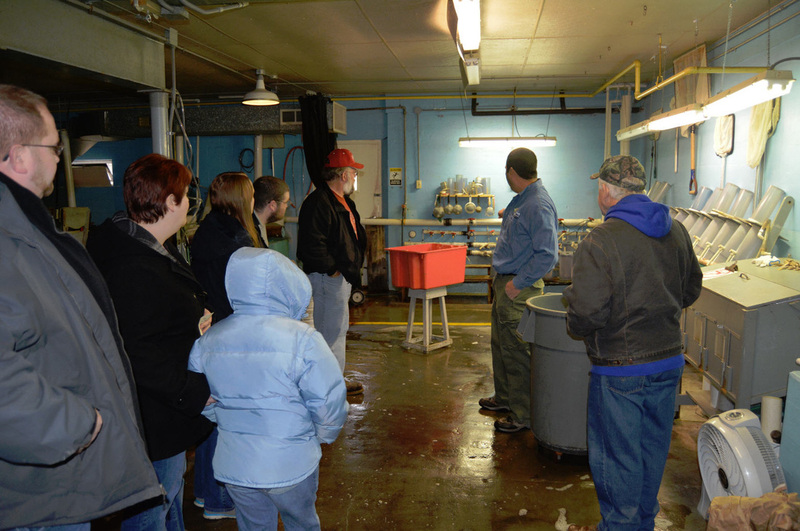 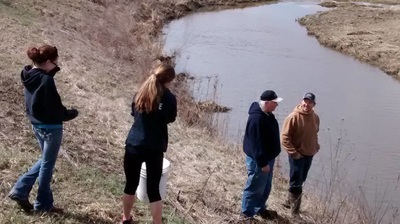 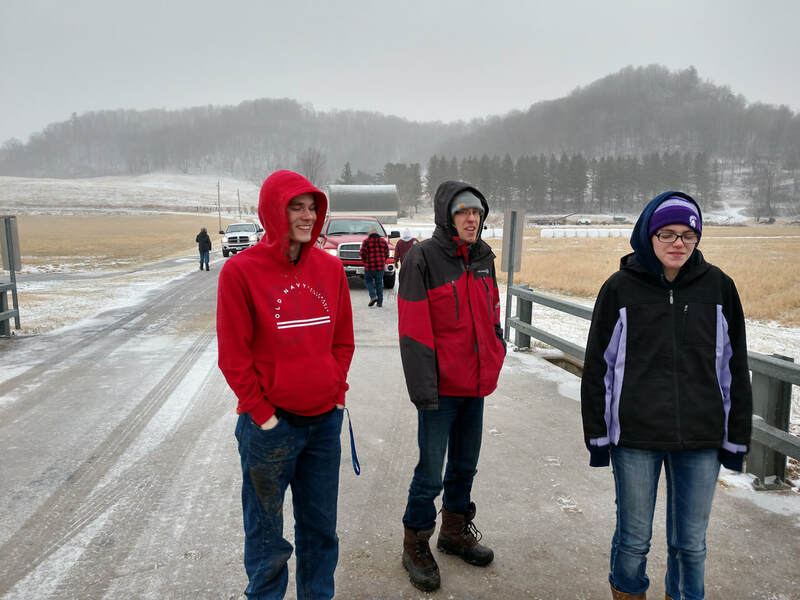 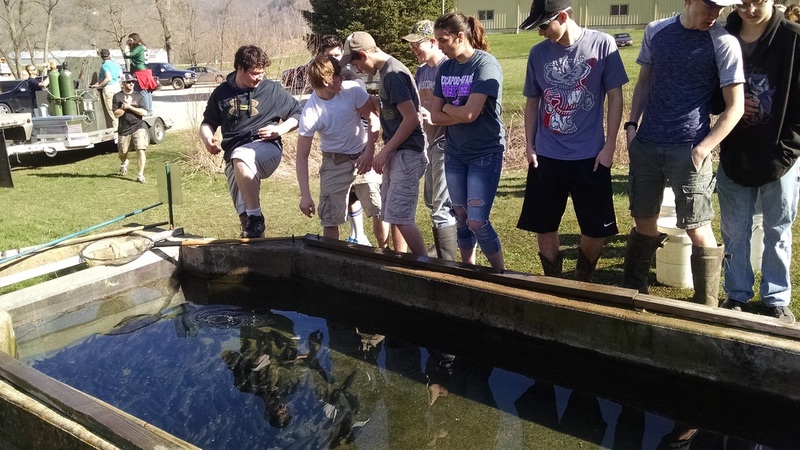 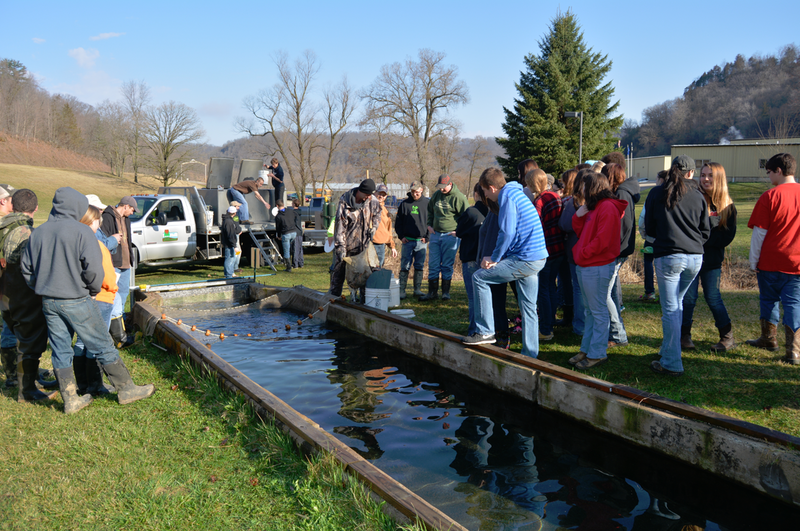 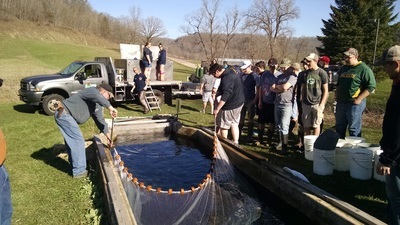 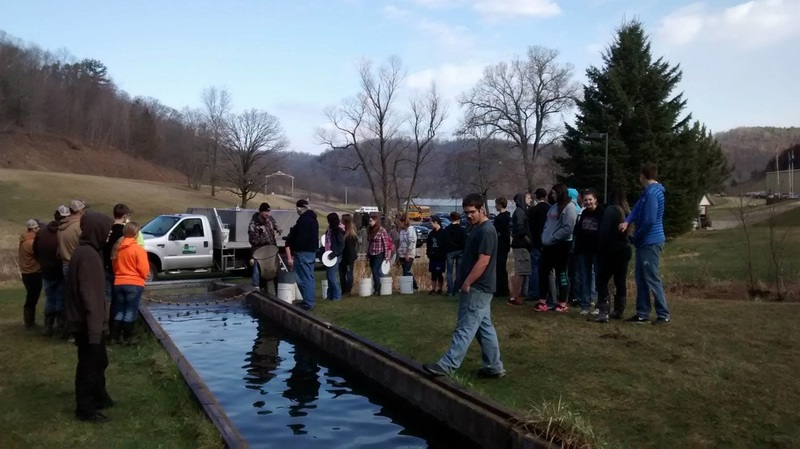 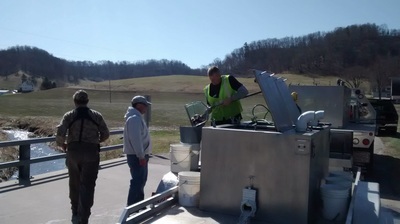 Several VSC members visited the Nevin Fish Hatchery in Madison on March 22nd. The tour we received was excellent, and we suggest everyone find time to visit the facility on Fish Hatchery Road. We were able to see the fingerlings that we will be getting in June. They are around an inch long now. 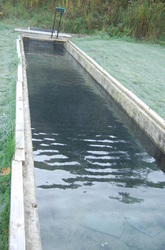 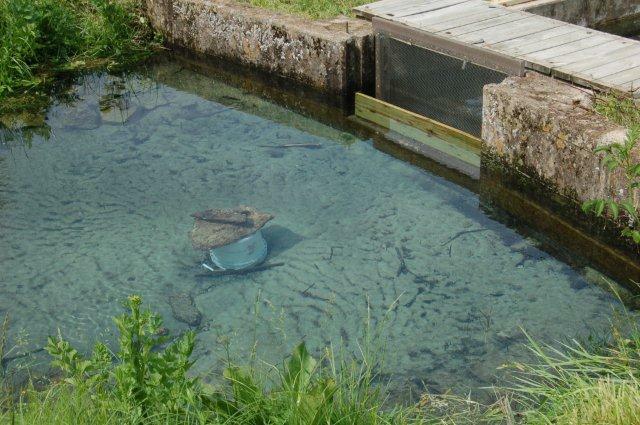 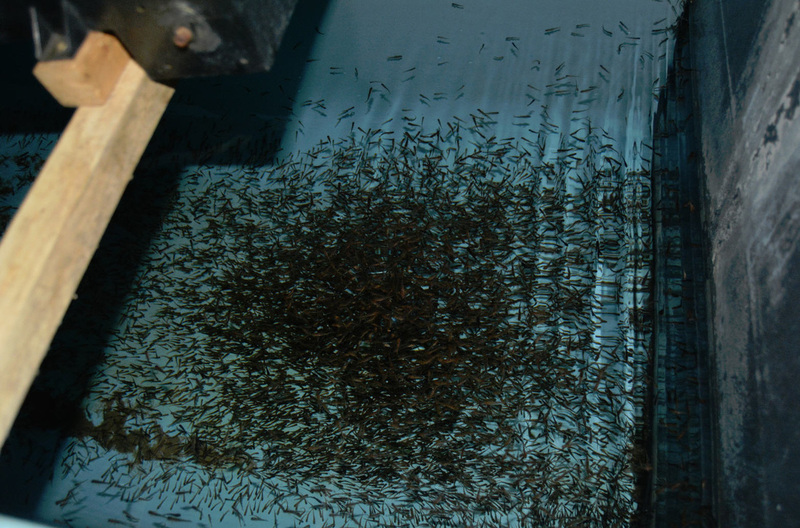 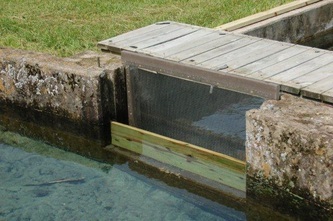 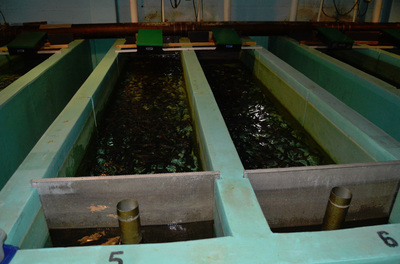 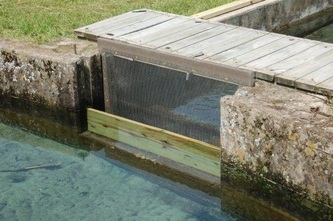 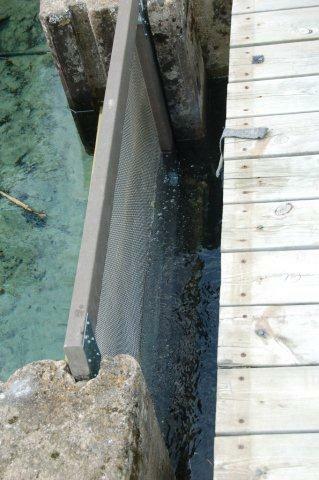 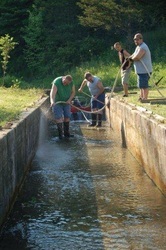 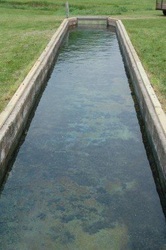 The facility also raises Brown and Rainbow trout besides our wild strain of Brook Trout. 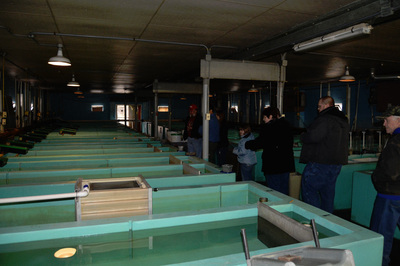 During the tour we learned that this hatchery is the oldest in the state, and they think it may be the oldest in the country. 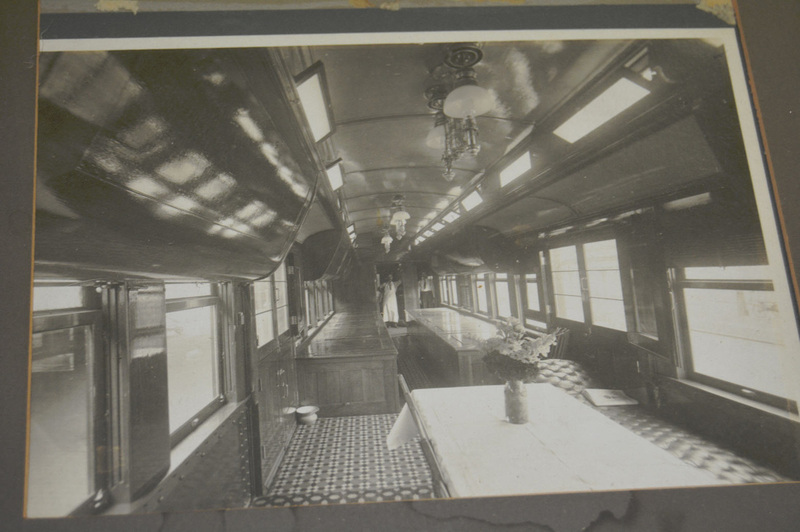 We were shown pictures of the train that used to transport fish in the state about a hundred years ago. 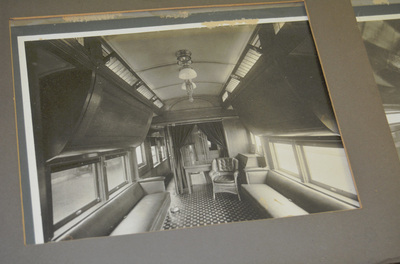 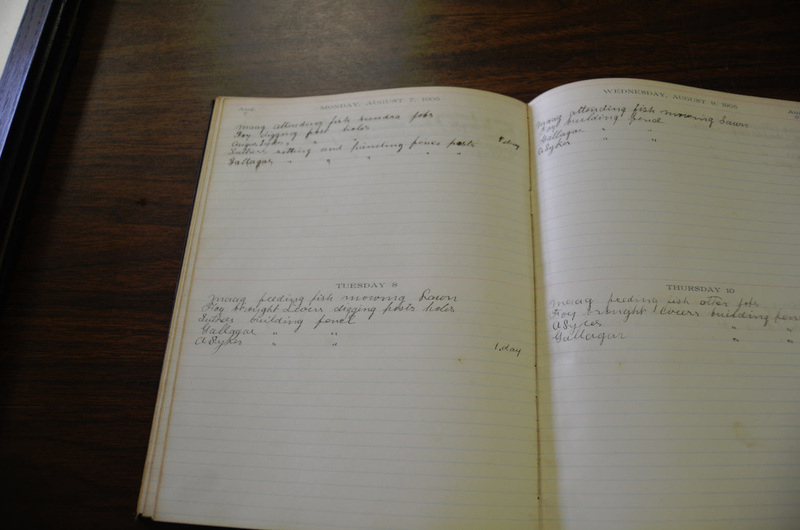 Some of the pictures you see with this article are of that train and there are pictures of a couple pages from their log book in 1905. 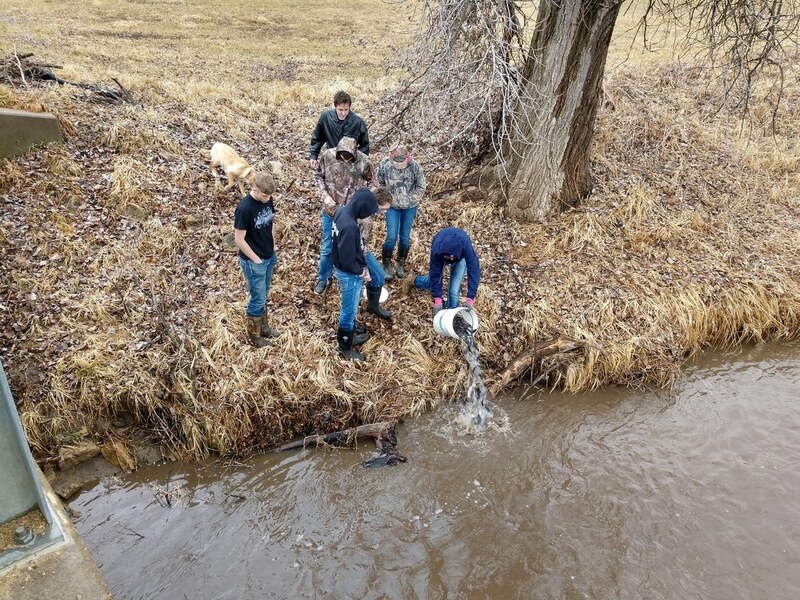 Anyone wanting to help with the stocking is welcome to stop out at S&S Cycle outside of Viola on Friday the 4th or Saturday the 5th, around 9:00. We will leave from there to travel to many different local streams to do the stocking. 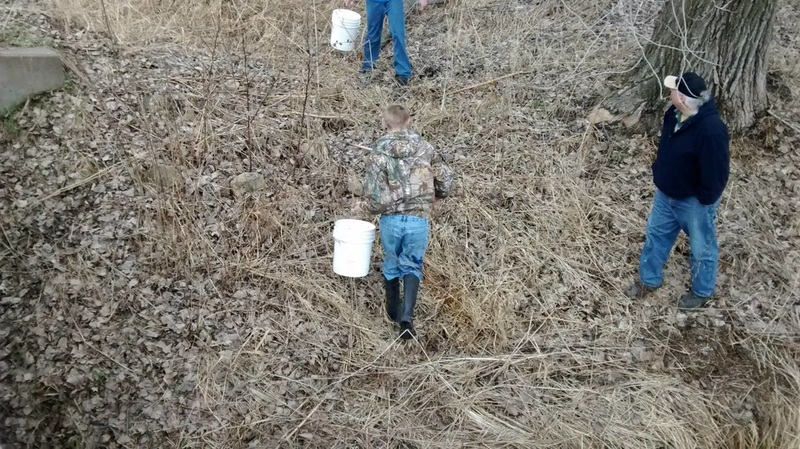 Boots are suggested but not required. 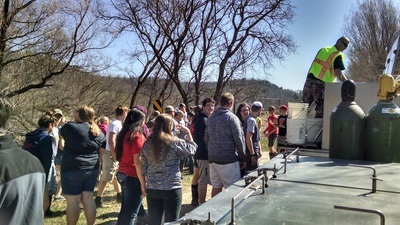 We have a group of Kickapoo High School students helping on Friday. 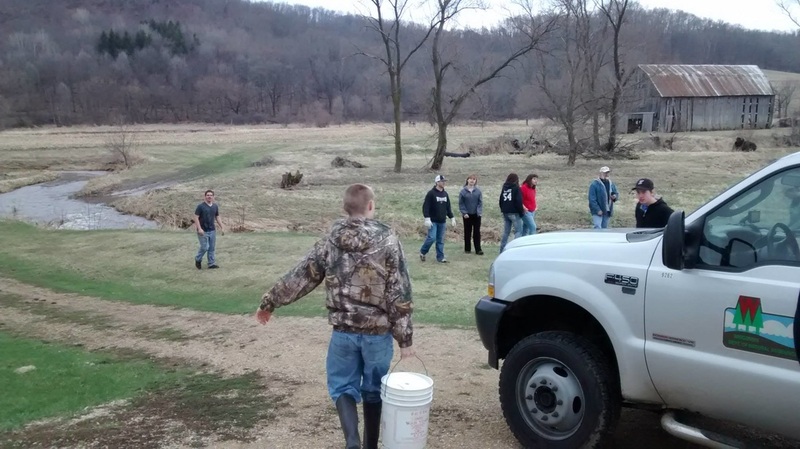 There will be more than enough to do for anyone who participates, so stop out and have some fun with us. 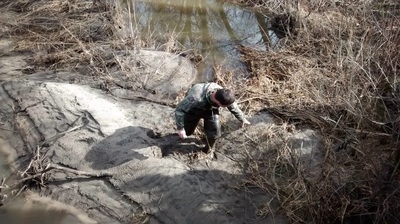 David (DNR) was here this morning to look over the trout at our request. We’ve been seeing a dead fish a day for a while, so we were worried something was wrong. 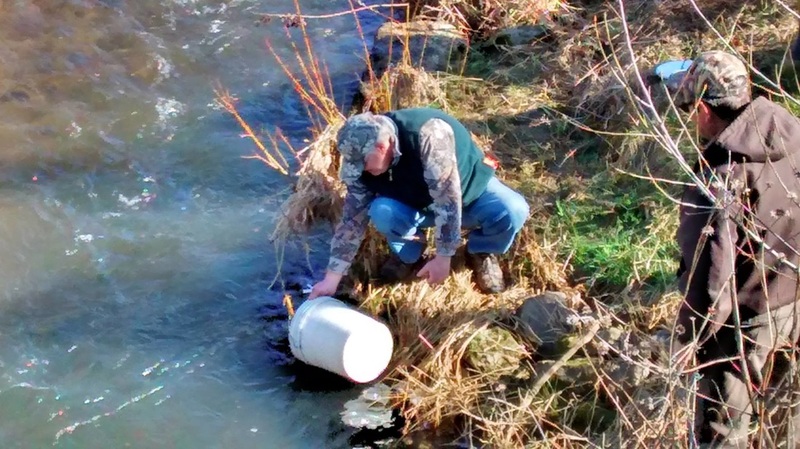 While he can’t explain why fish are dying, he’s pretty sure we have nothing to worry about. 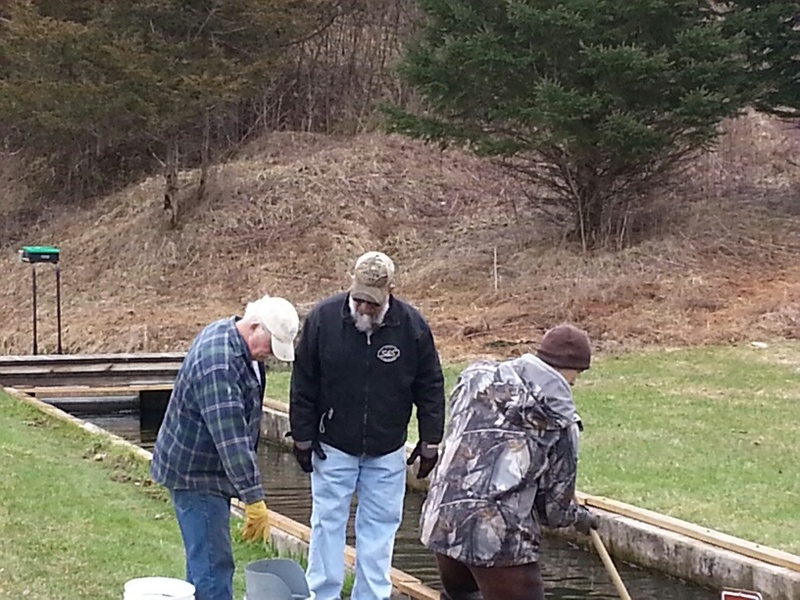 Last Sunday Gary, Jr, Ken, and myself came out and cleaned the pond. We scrapped all the fish poop from the bottom, and replaced the lower screen with the larger ¼" screen. 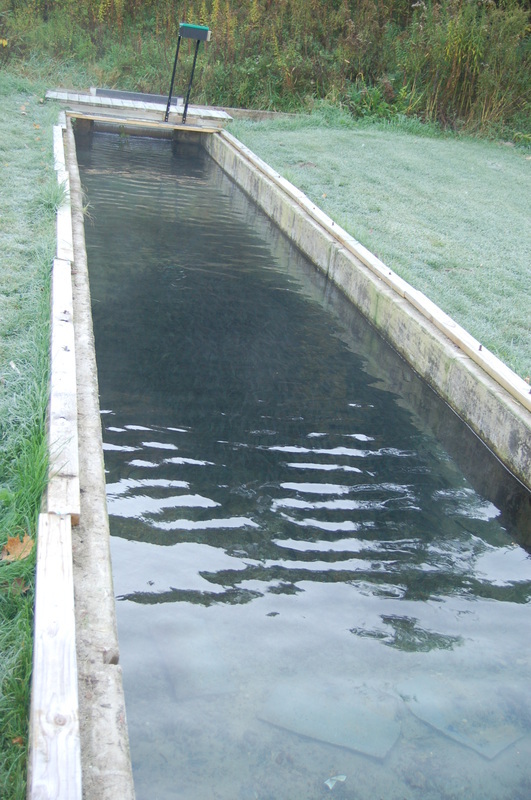 Today they seined the pond so we could get a count of the number of trout. 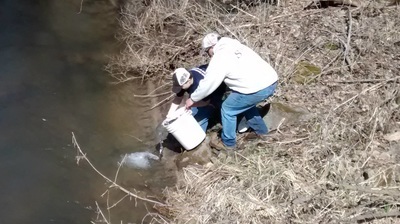 We were given approximately 7000 trout in April, and we figure we’ve lost no more than 100 total. 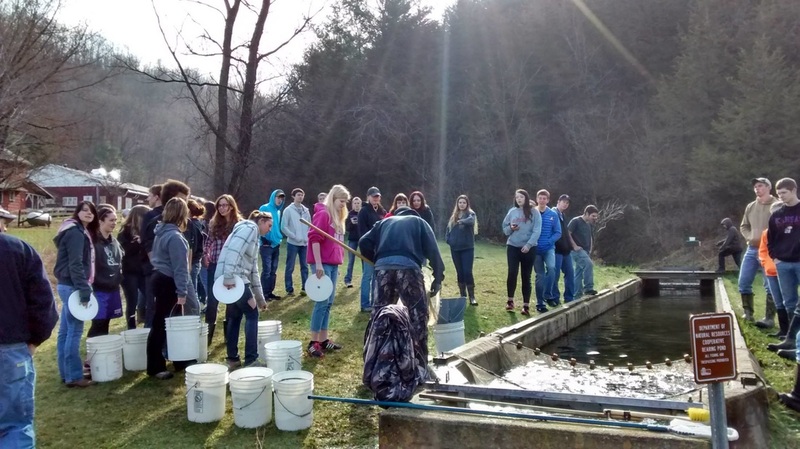 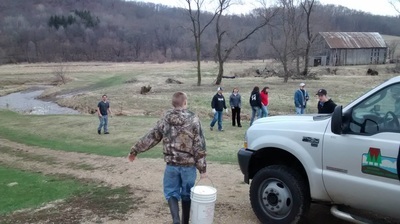 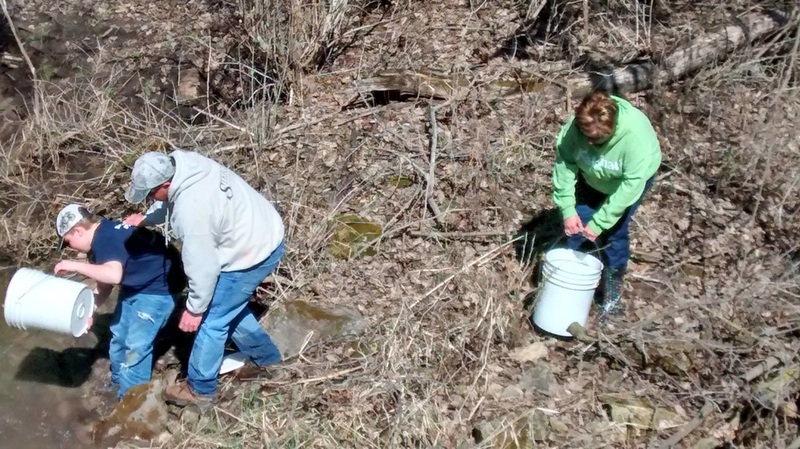 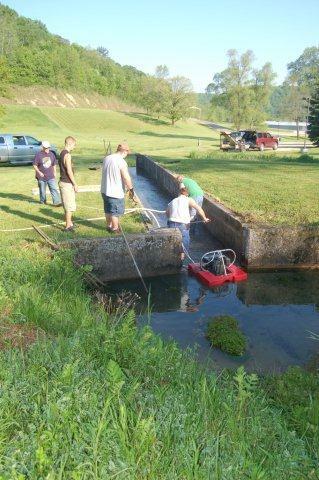 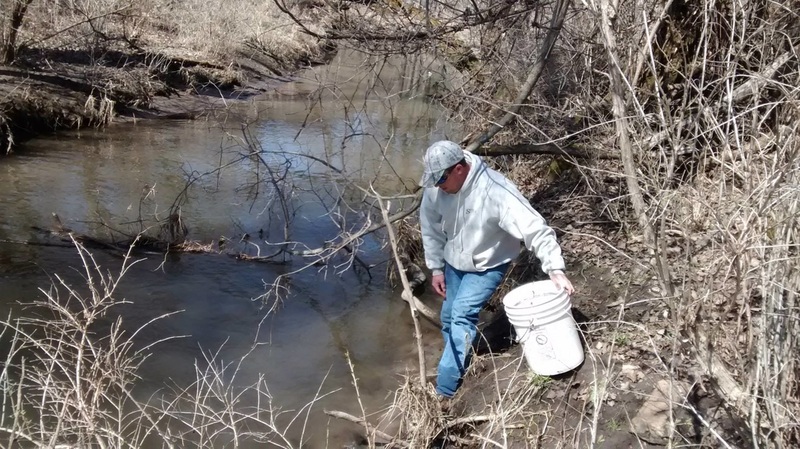 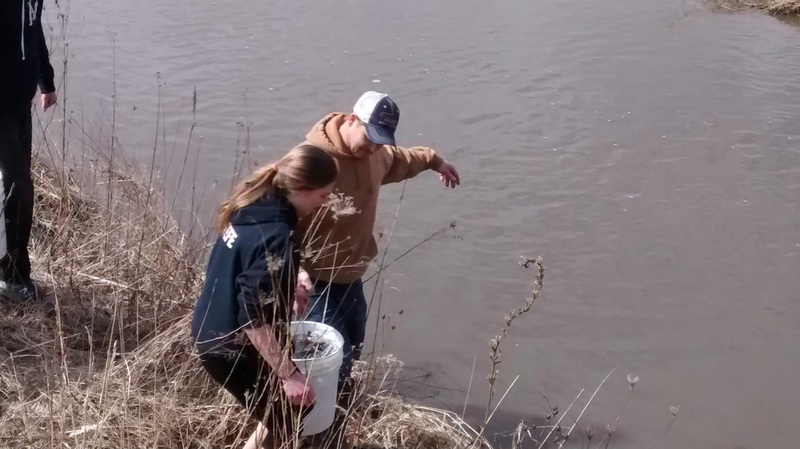 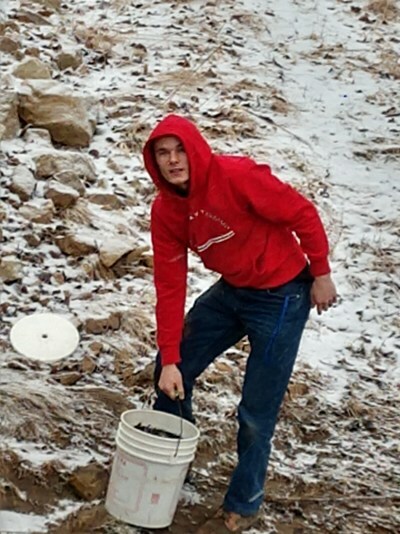 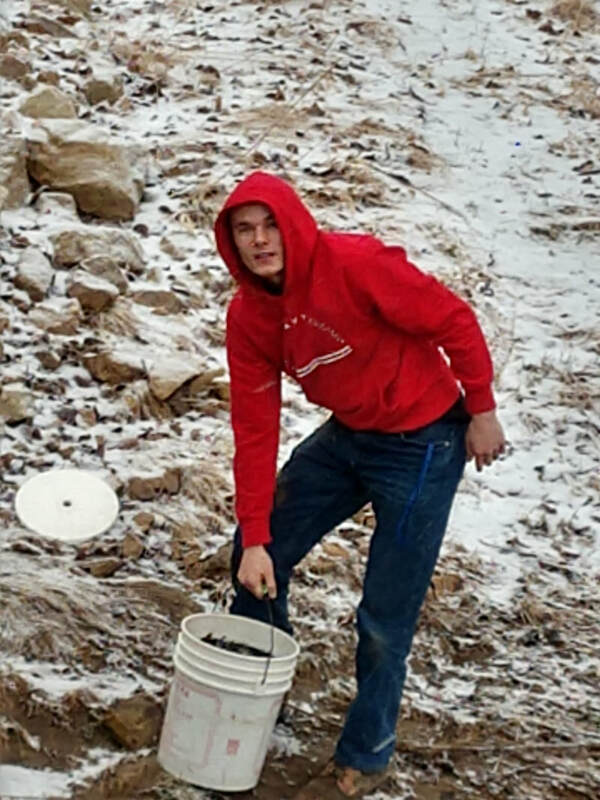 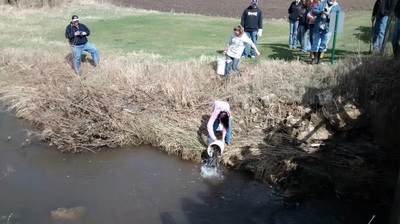 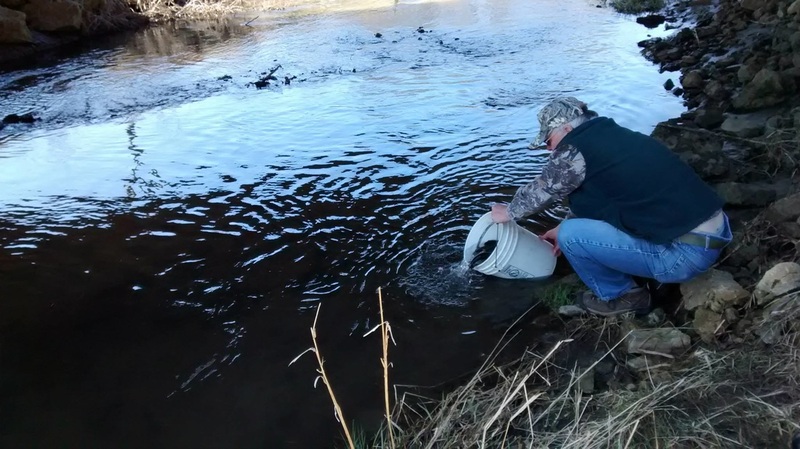 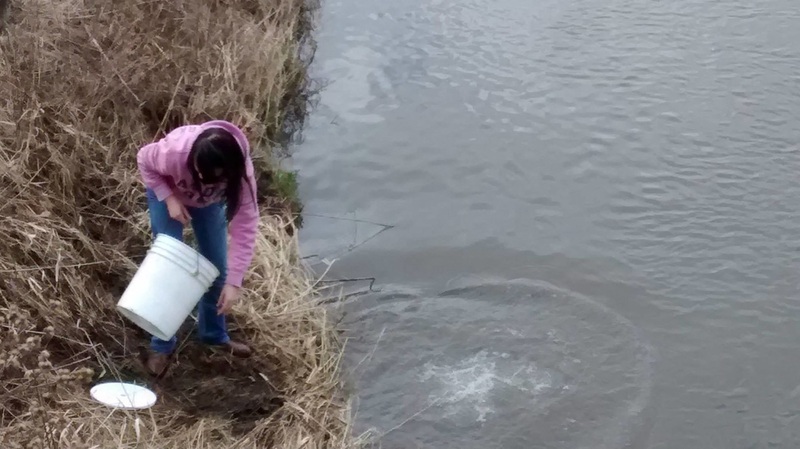 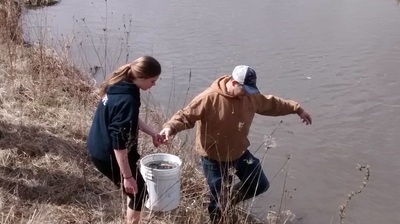 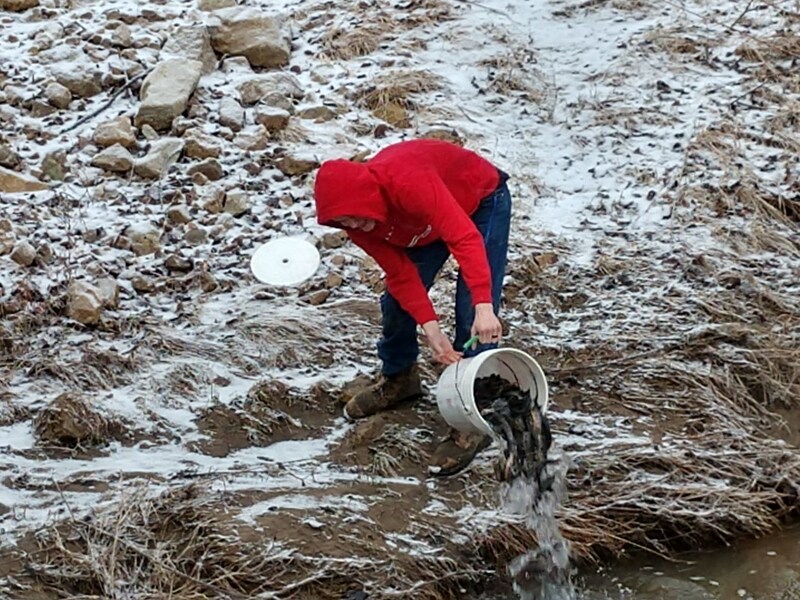 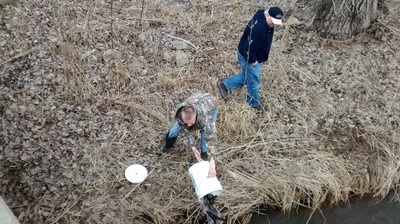 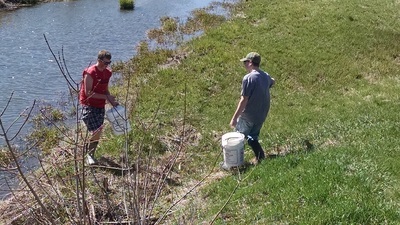 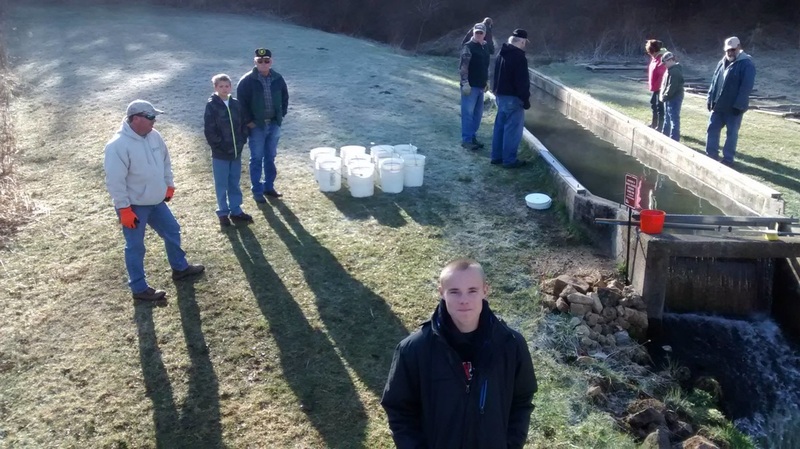 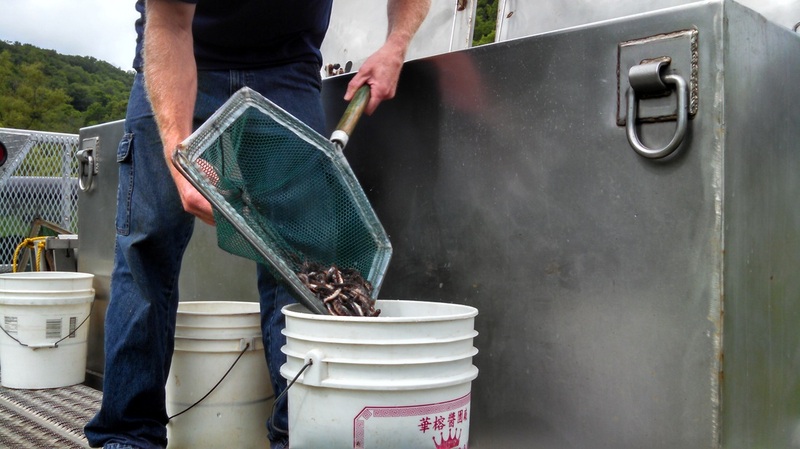 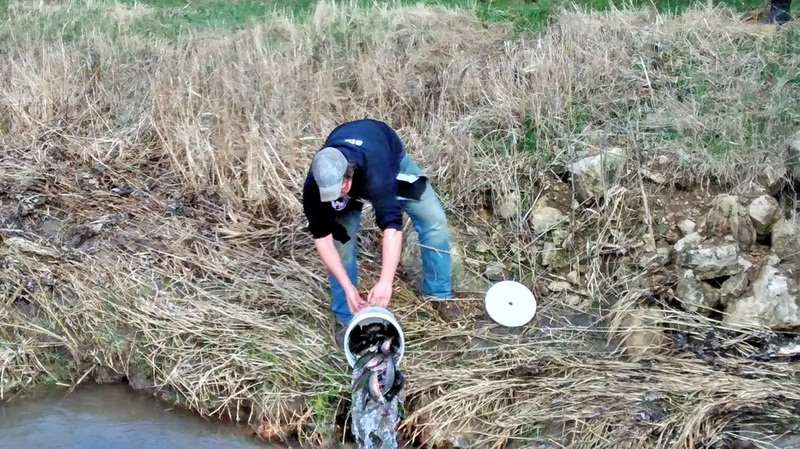 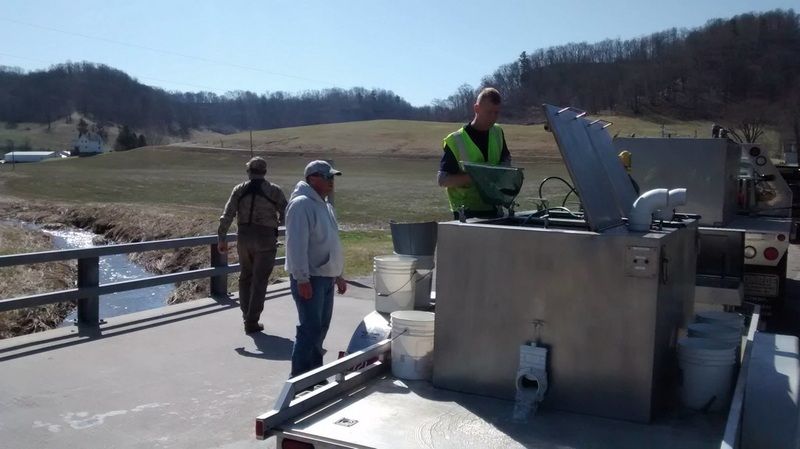 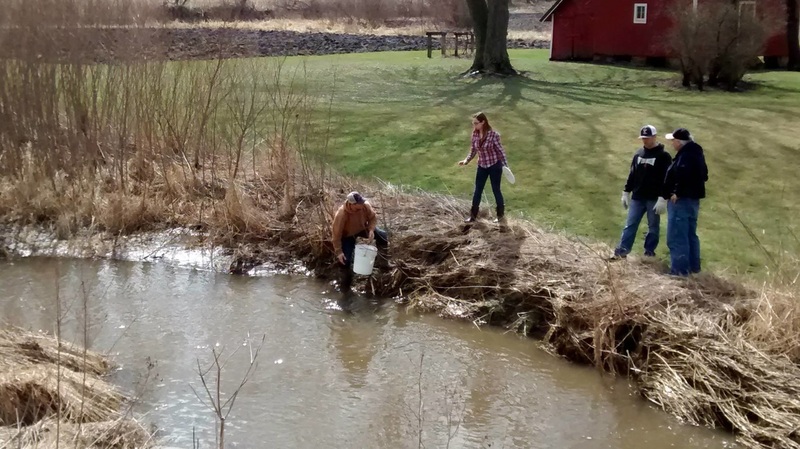 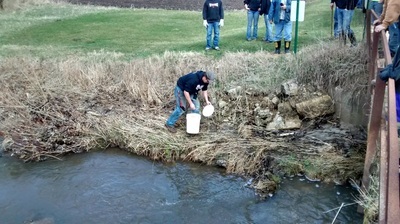 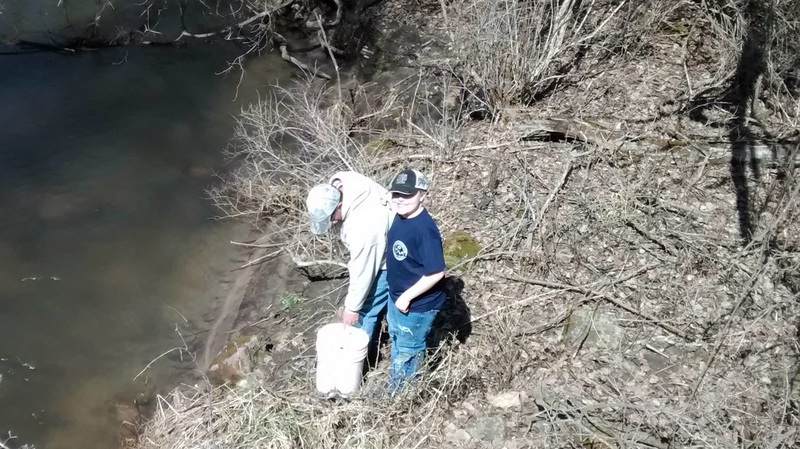 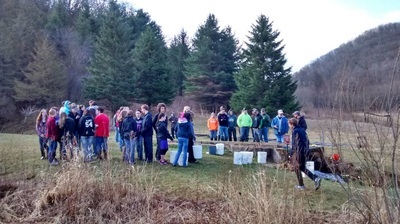 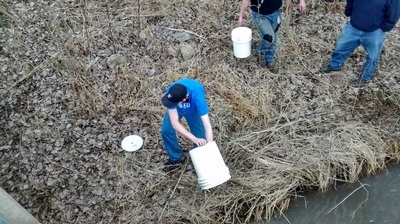 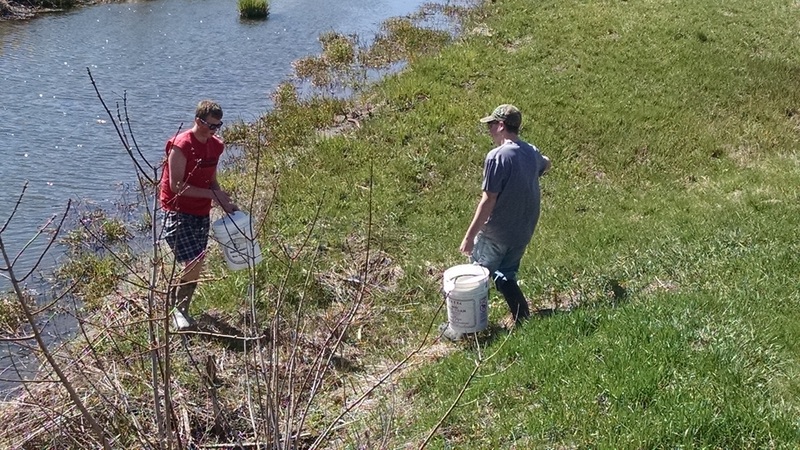 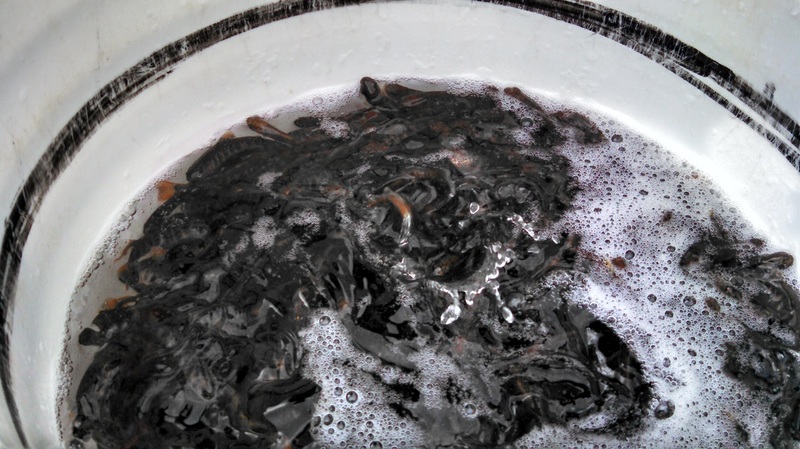 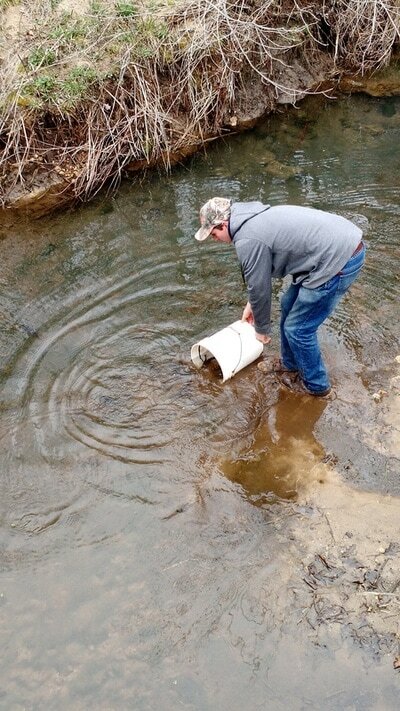 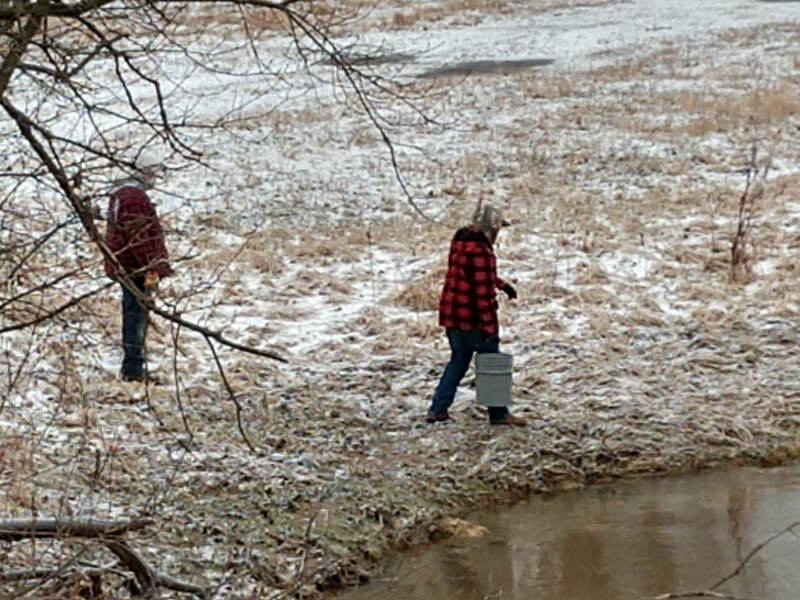 They filled 24 buckets with trout, and averaged 309 trout per bucket! That means we have about 7400 trout right now! 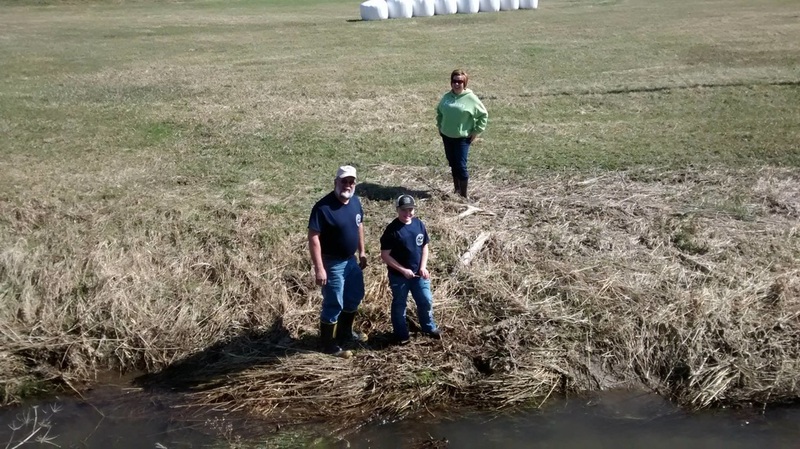 So we haven’t had any large losses like last year, and like we thought may have happened during the spring flood this year. 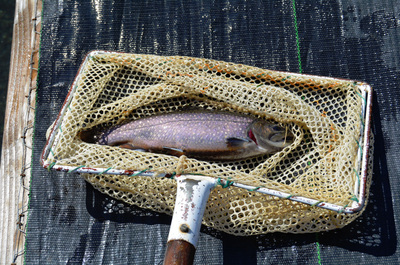 The number of dead trout is within their expected mortality rate for a quantity like we have. David also complimented us on our overall operation and on how observant and cautious we are. 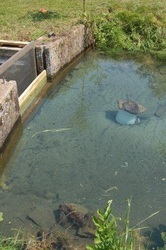 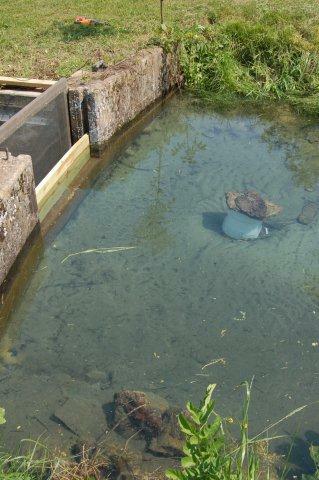 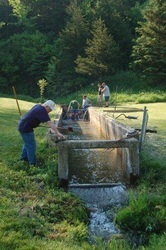 Going forward, tomorrow I will put the last of the three salt block into the head pond. 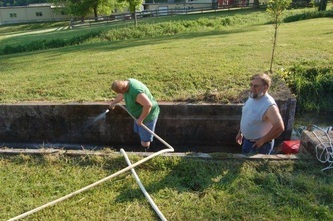 That will make three days in a row as David suggested we do. In addition to this, David wants us to put one more block in each week until the blocks they gave us are gone. 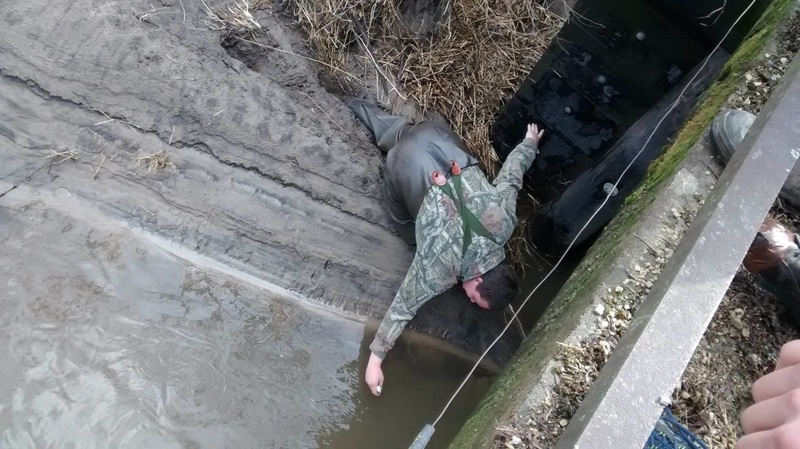 That will be 5-6 weeks. It’s actually good for the trout he says. 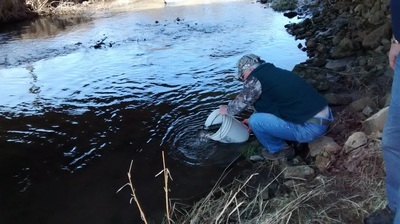 He will be returning in another week or so to do his normal trout route checks, and he will give us the data from that trip. 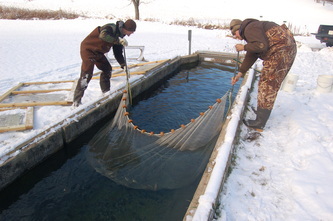 He also said he wanted to work with us to possibly select a Saturday to do at least some of our stocking. 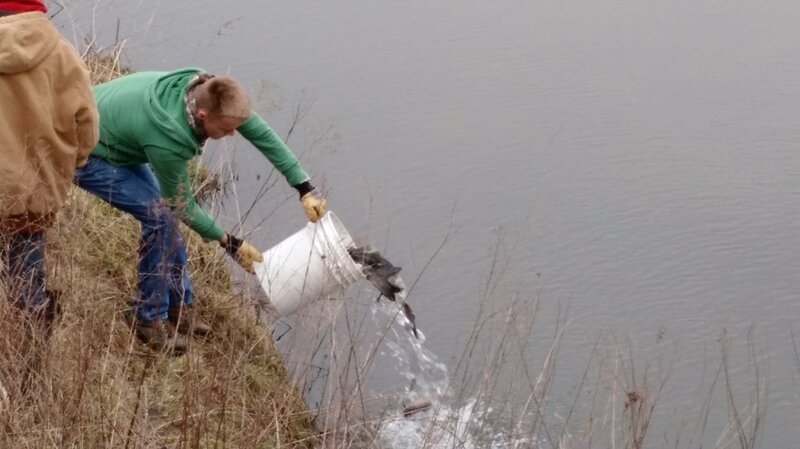 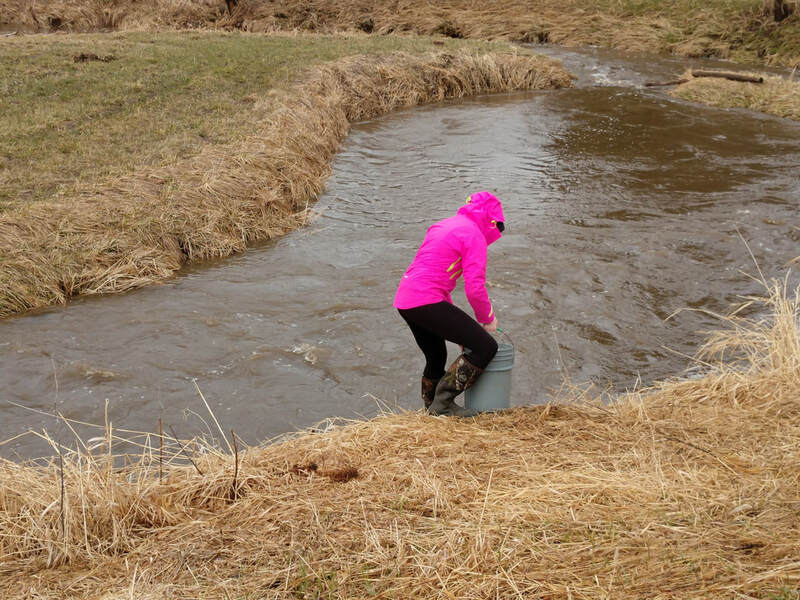 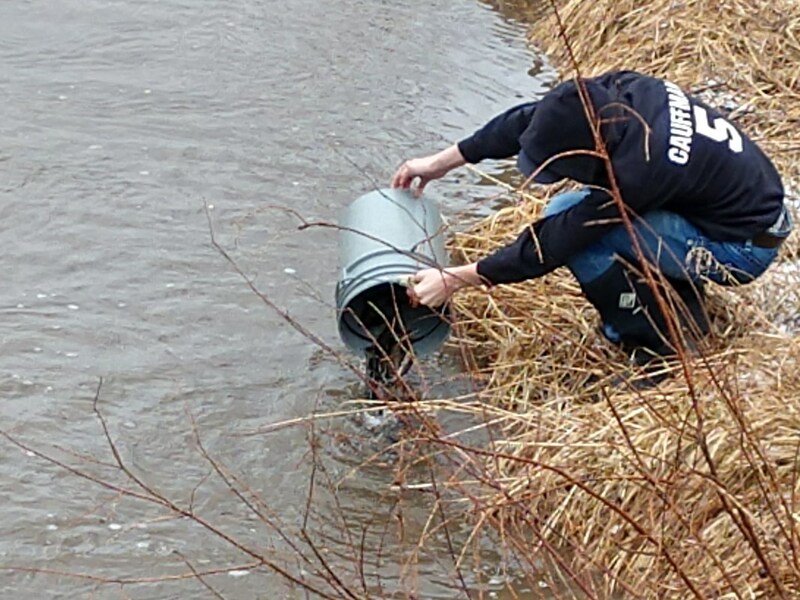 Just as a reminder, last year when we stocked, each bucket had about 90 trout in it, so we’ll have somewhere around 80 buckets to dump into creeks this year. 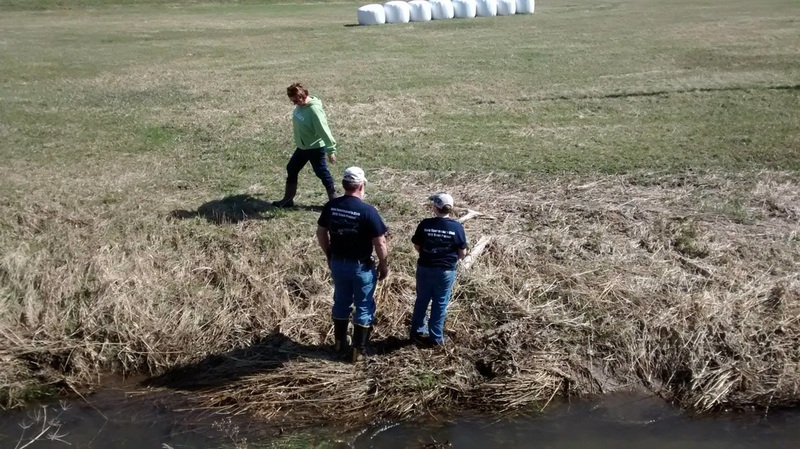 We will need more help than we had last year, so a weekend date would really help us. 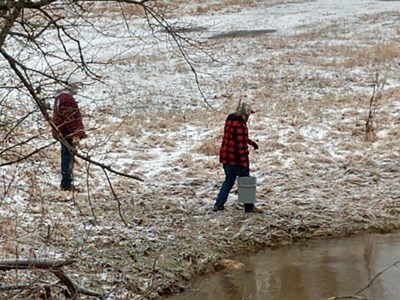 As we get closer to the stocking time, we will set a firm date so we can all plan around it. 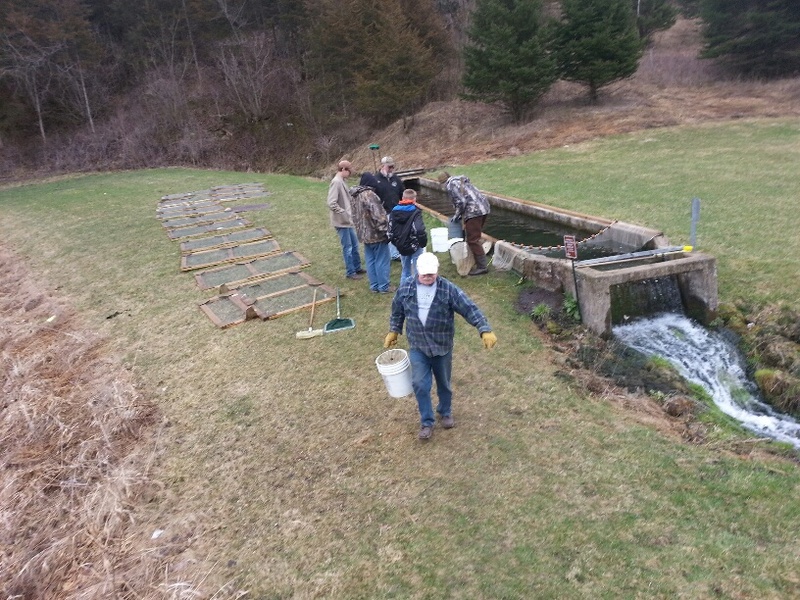 Our trout project is moving along as planned. 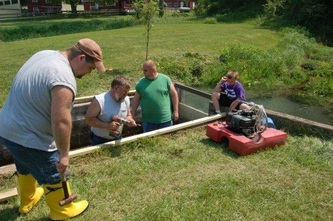 For those who don’t know, there were some changes to this program at the beginning of this year. 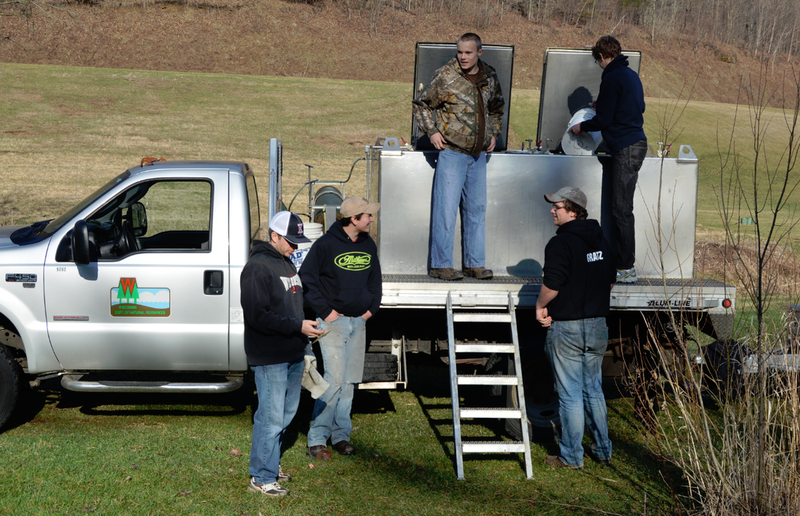 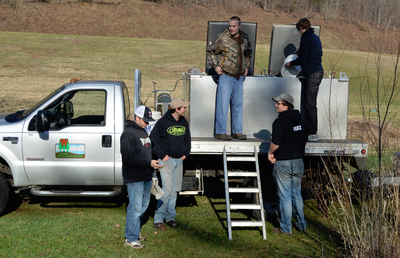 Our original commitment was to raise 2500 Brook Trout. 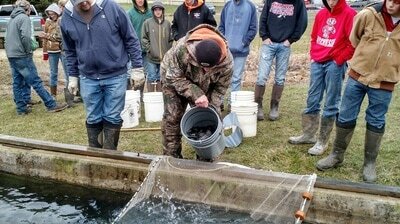 There was a change in the DNR Co-op program, and with the help of the Rockton Sportsman’s Club, we are now raising 7000 Brook Trout! The VSC has one more Trout Project fundraiser for the year, so along with our other fundraisers and the assistance from the Rockton Club, we have raised enough to fully fund the program for this year. The trout are now 4-6 inches long now, and are doing great. The plan is to release the trout next April, and we will be trying to organize some help when the stocking day arrives. If you are interested in helping with the stocking, just let the club know. 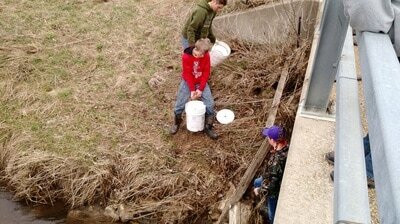 As soon as we can confirm which creeks, streams, and rivers the trout are to be released in, we will post the info for you. 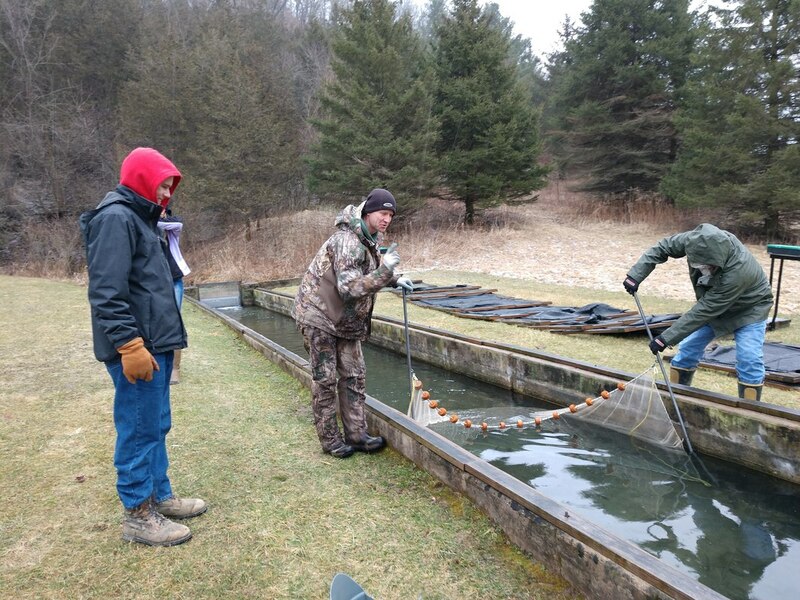 DNR visit to Trout Rearing Pond week of December 10, 2012 to check the size and health of the Trout.